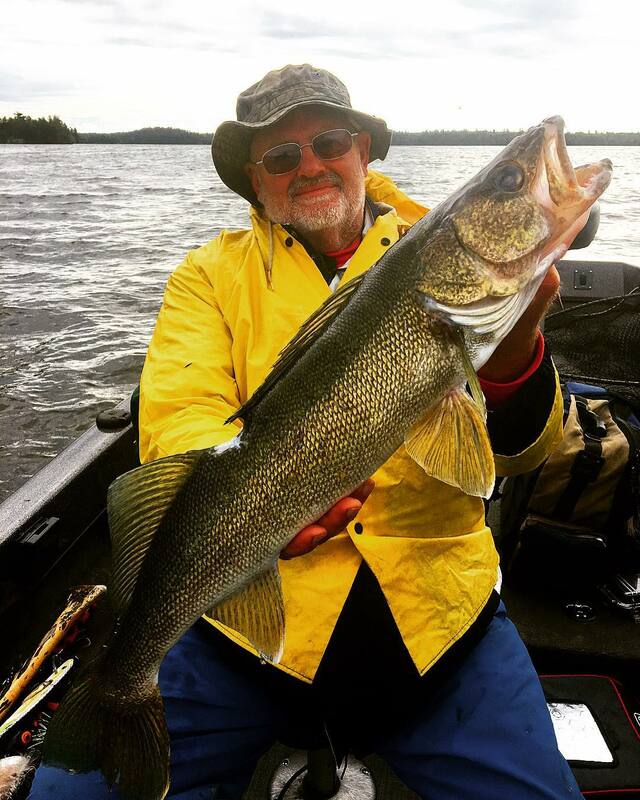 When it comes to the great outdoors, there is truly no better place than enjoying yourself on Eagle Lake at Andy Myers Lodge. 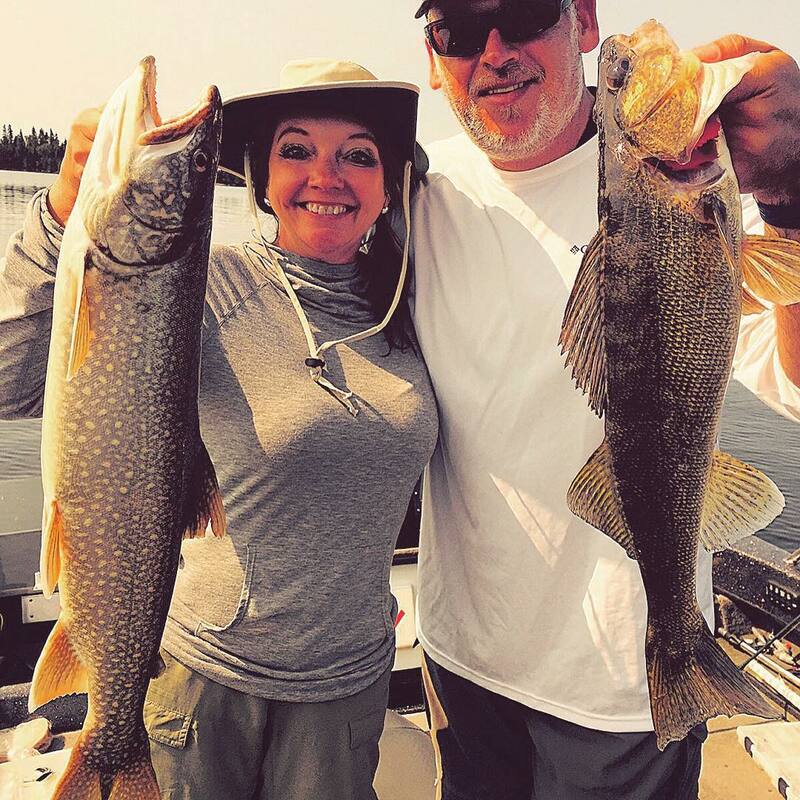 We are dedicated to providing fisherman with great accommodations to make not only a great fishing trip but a relaxing and high class vacation. 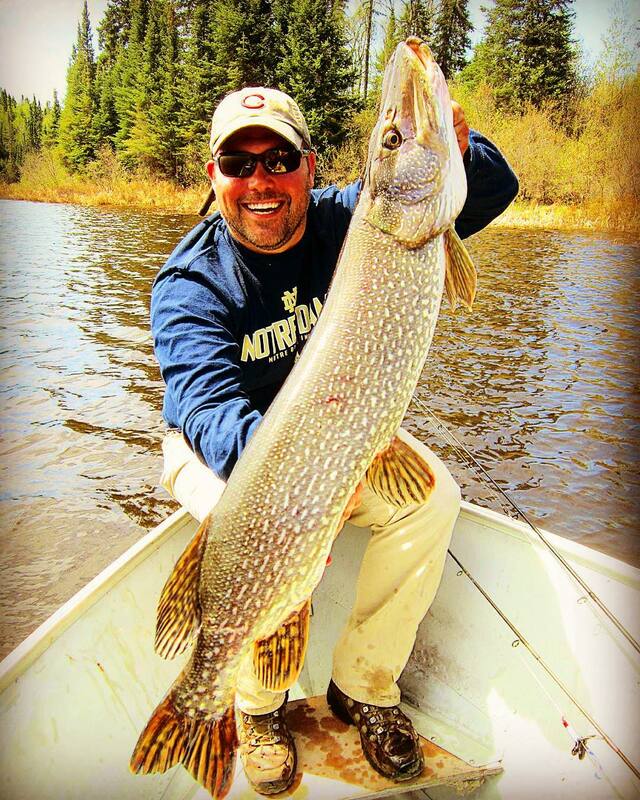 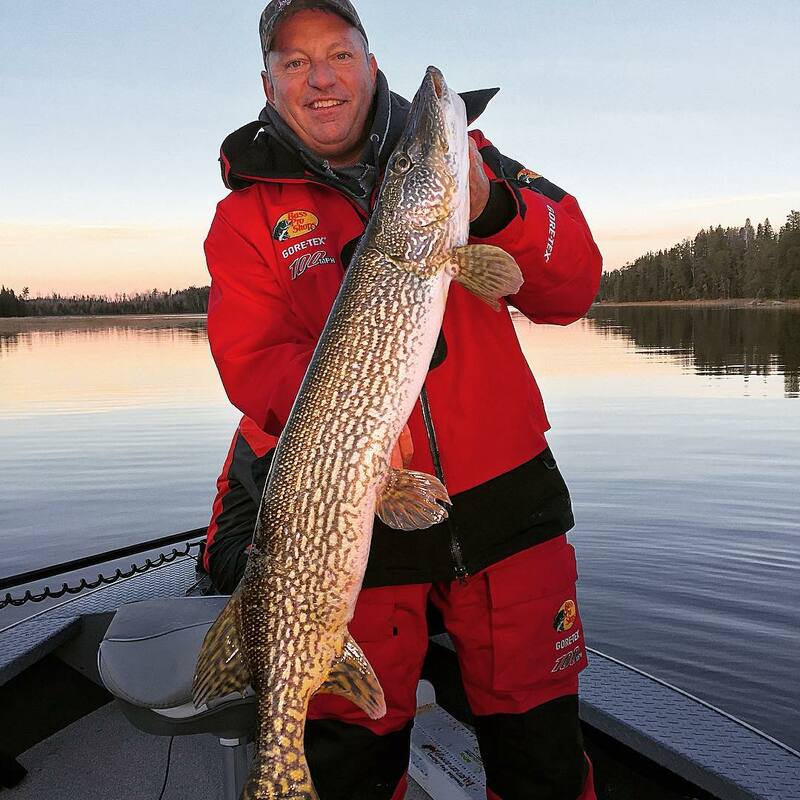 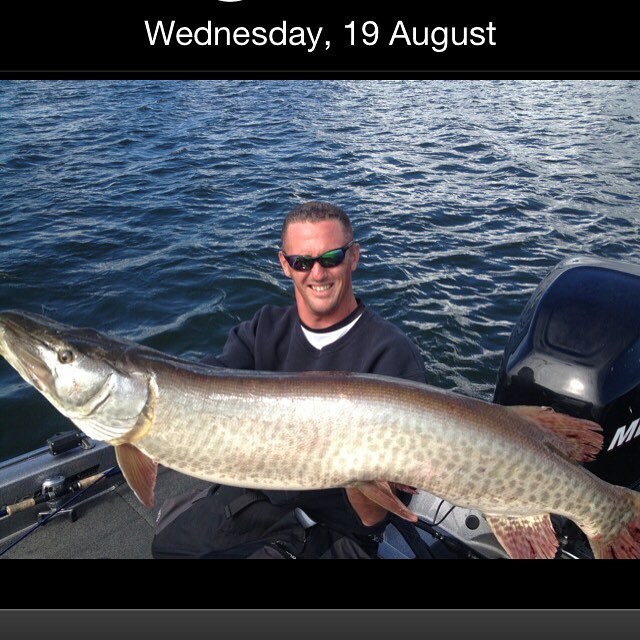 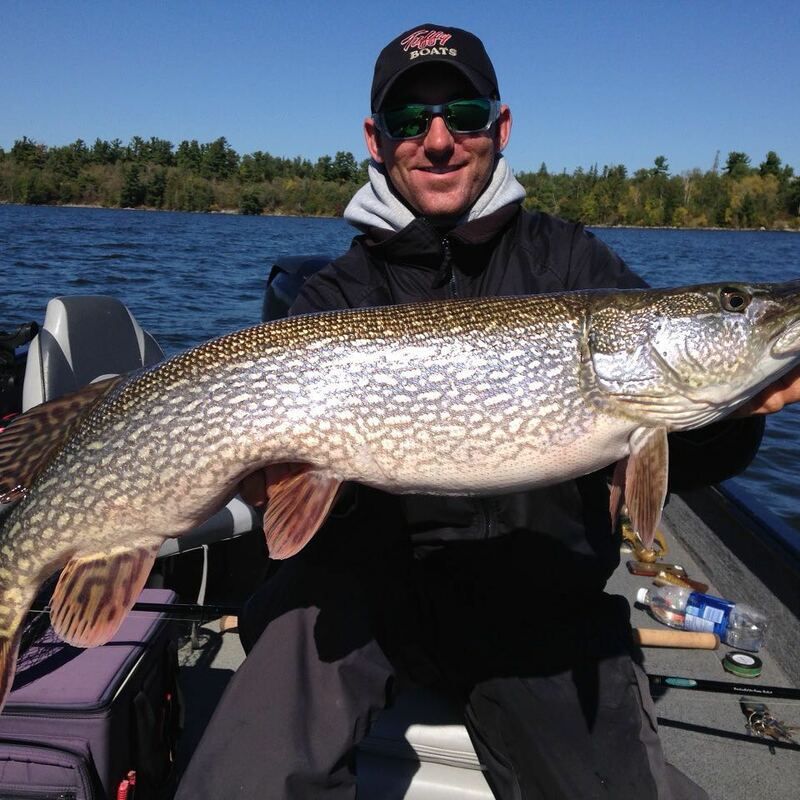 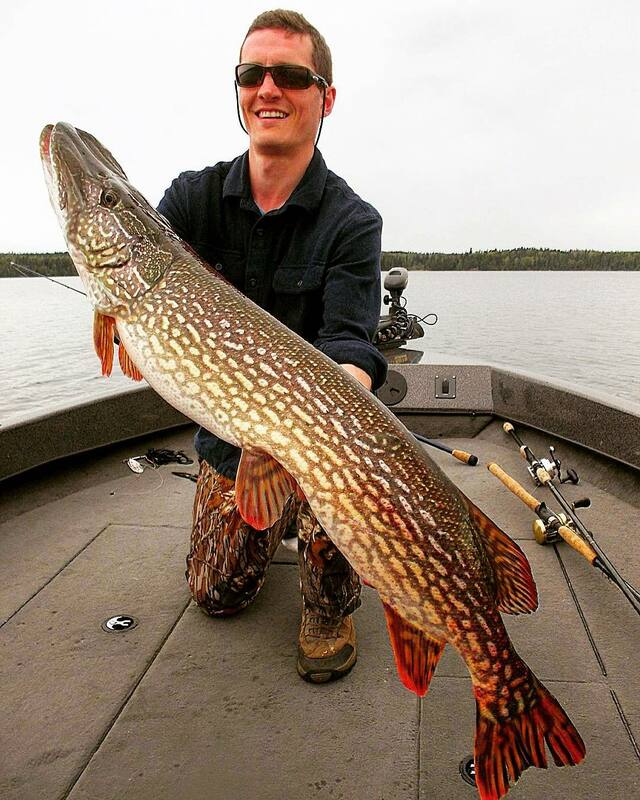 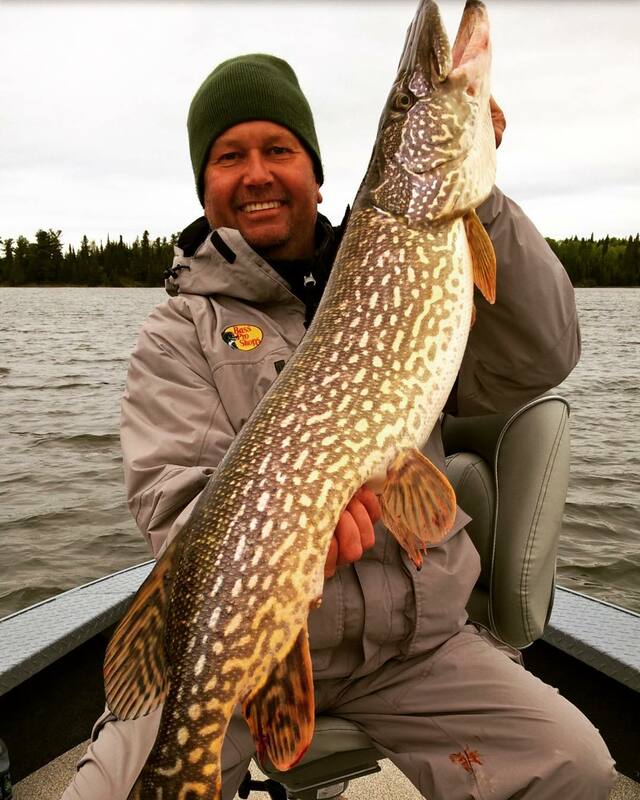 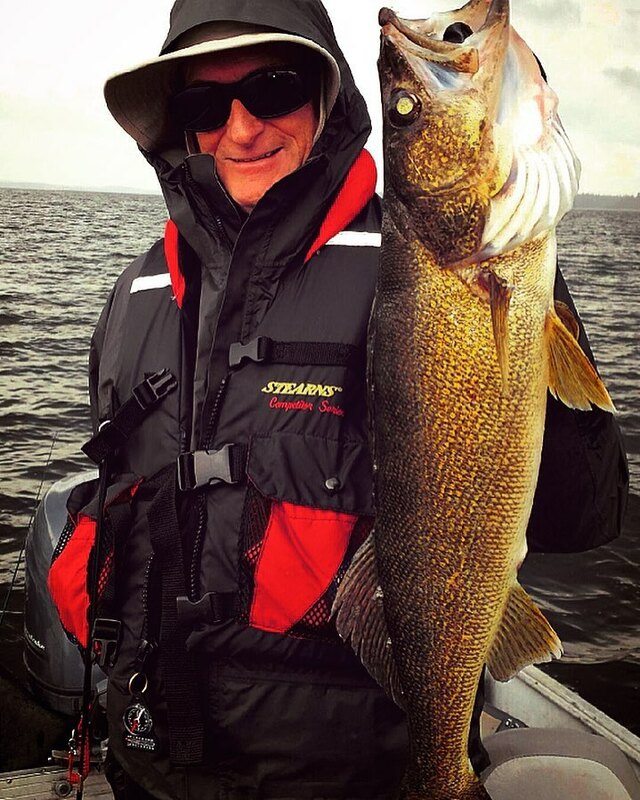 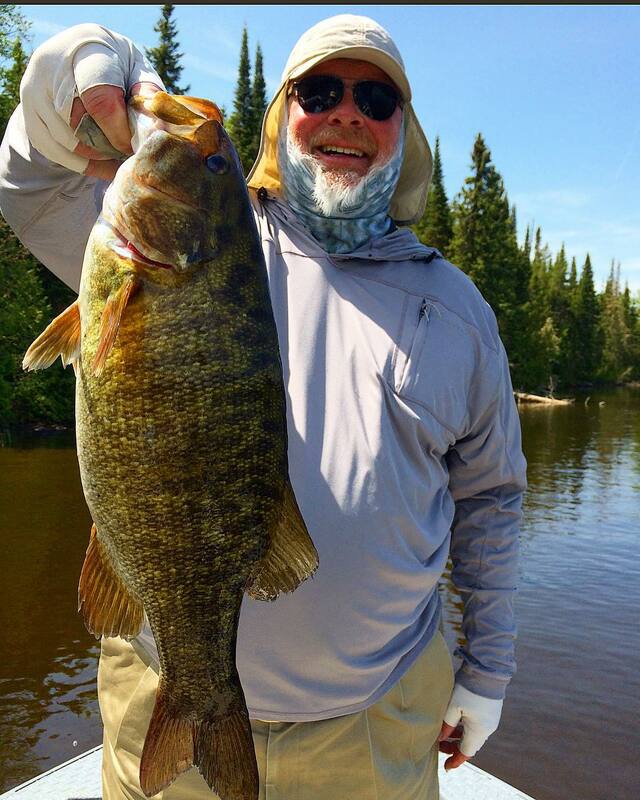 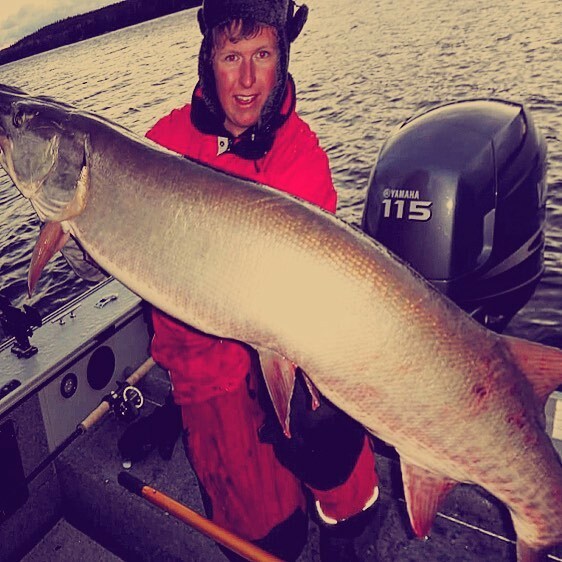 If you are looking for world-class fishing and accommodations in Ontario, Andy Myers Lodge is the answer. 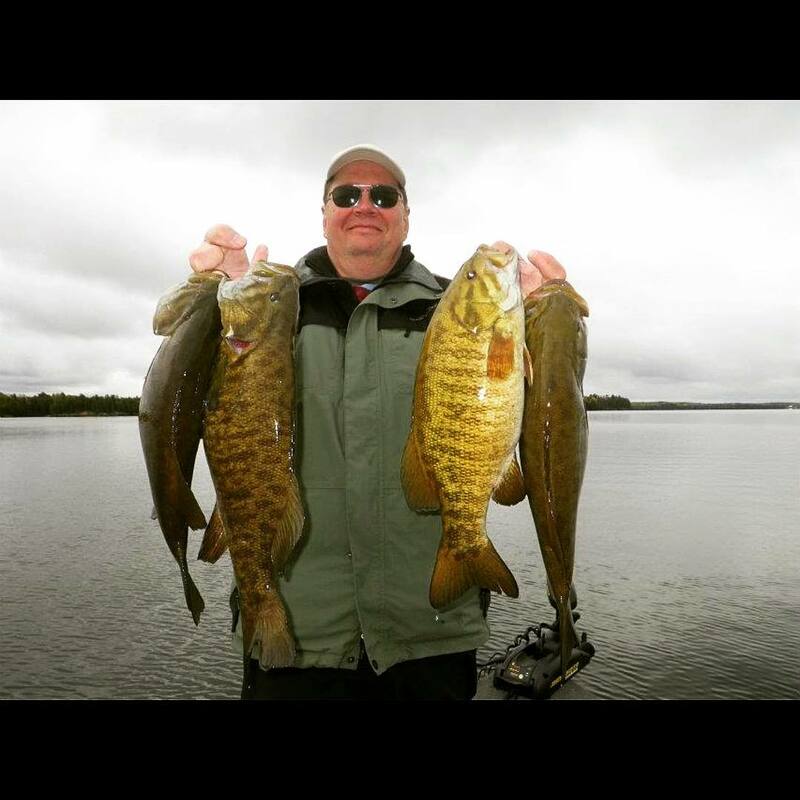 Our Ontario, Canada lodging vacations are simply the best. 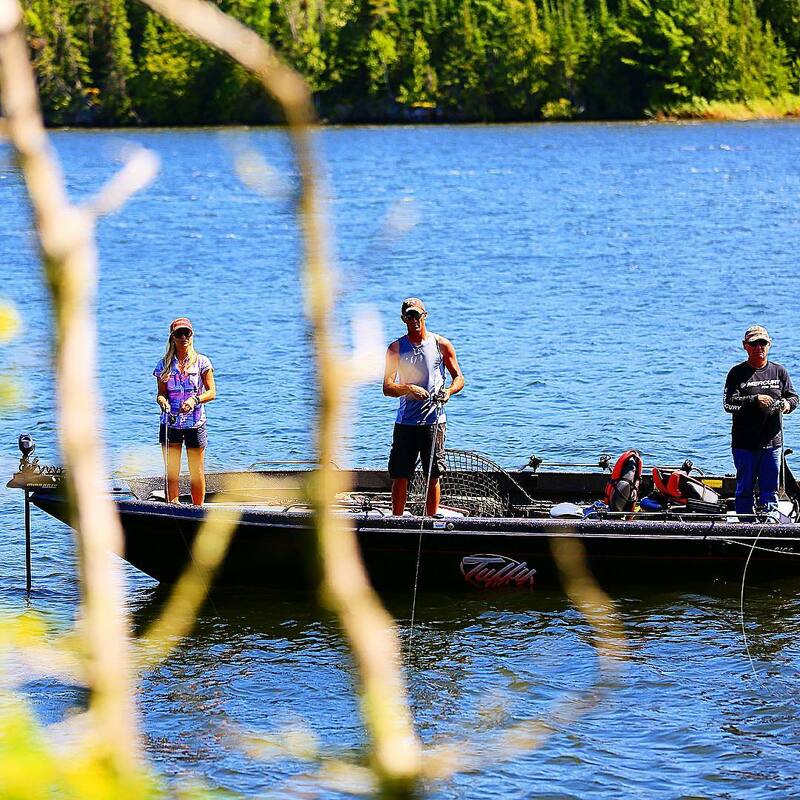 With affordable rates and great accommodations, you can’t go wrong. 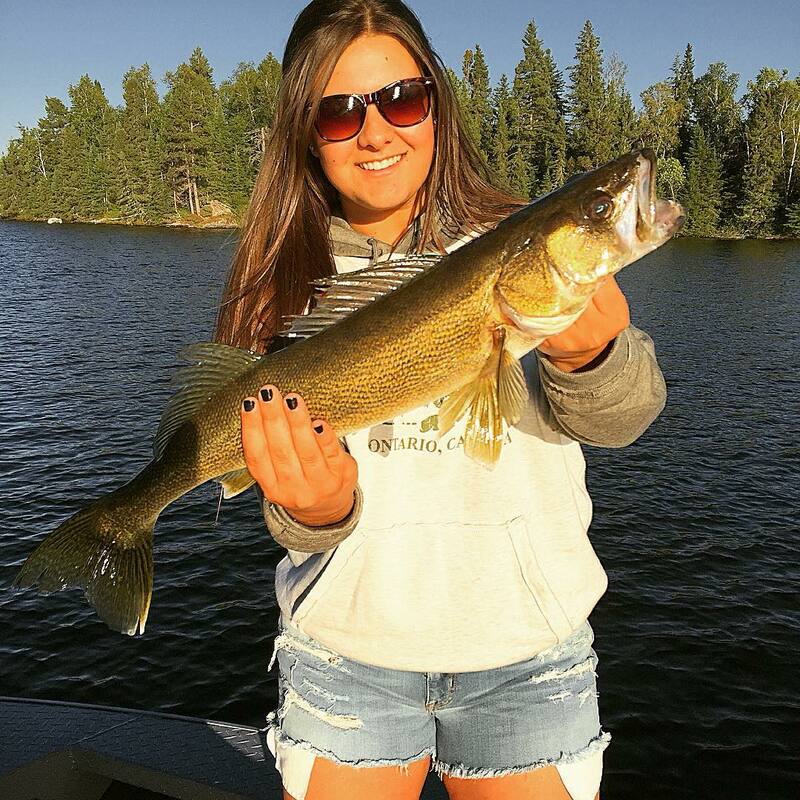 Our lodging has 15 individual handcrafted cabins to handle any size group and is perfect for relaxation. 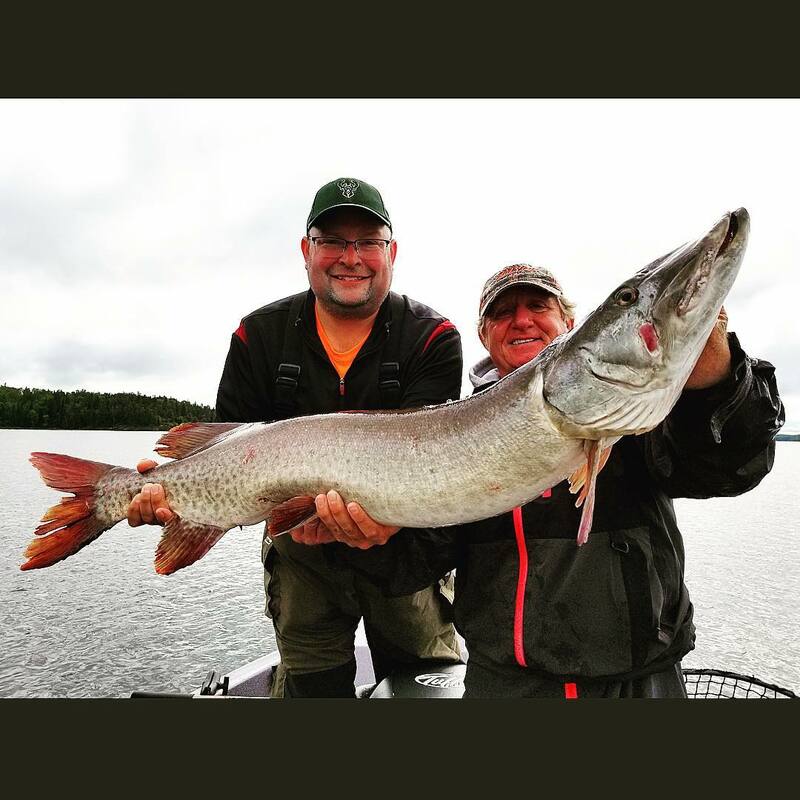 All cabins are completely furnished with private bathrooms including shower, gas furnace, electric refrigerator, cooking facilities with preparation and eating utensils, all bed linens and towels. 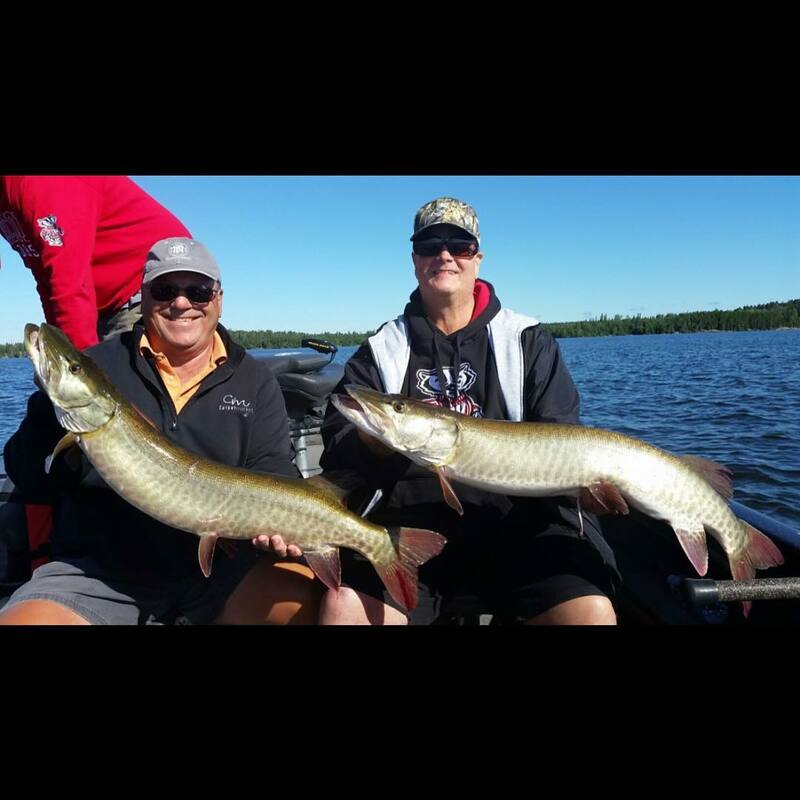 Here at Andy Myers Lodge, we believe that you can live and breathe the outdoors during the day and relax in the comforts of home in one of our cabins. 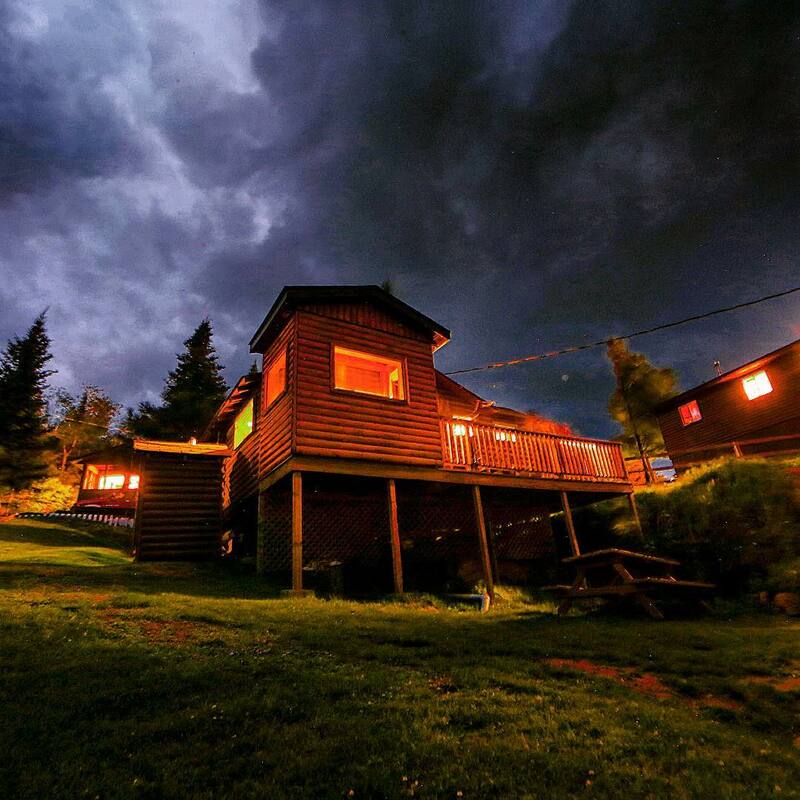 All cabins are climate controlled to be enjoyed all year round. 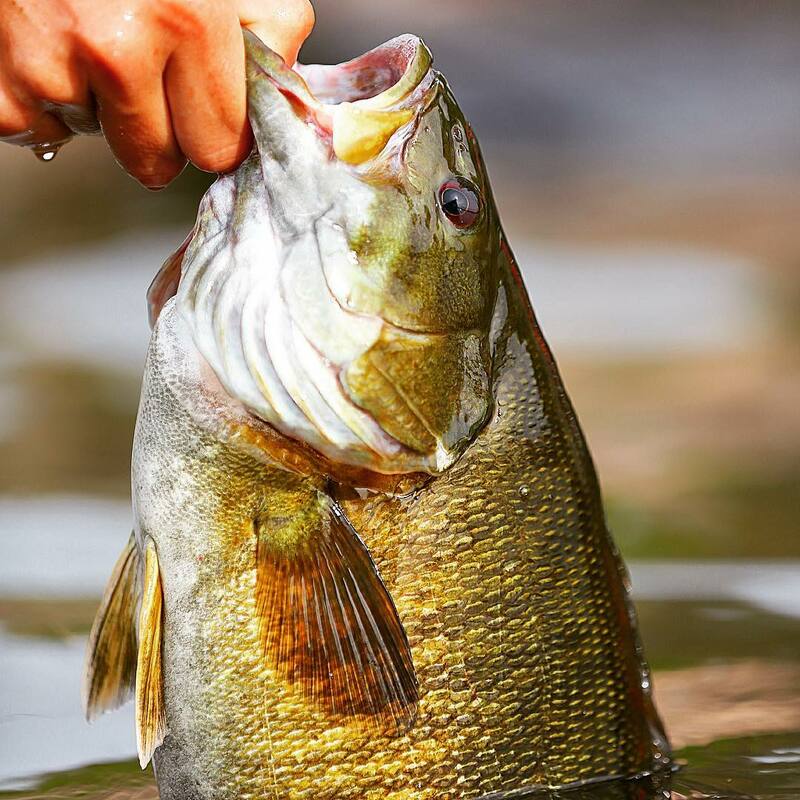 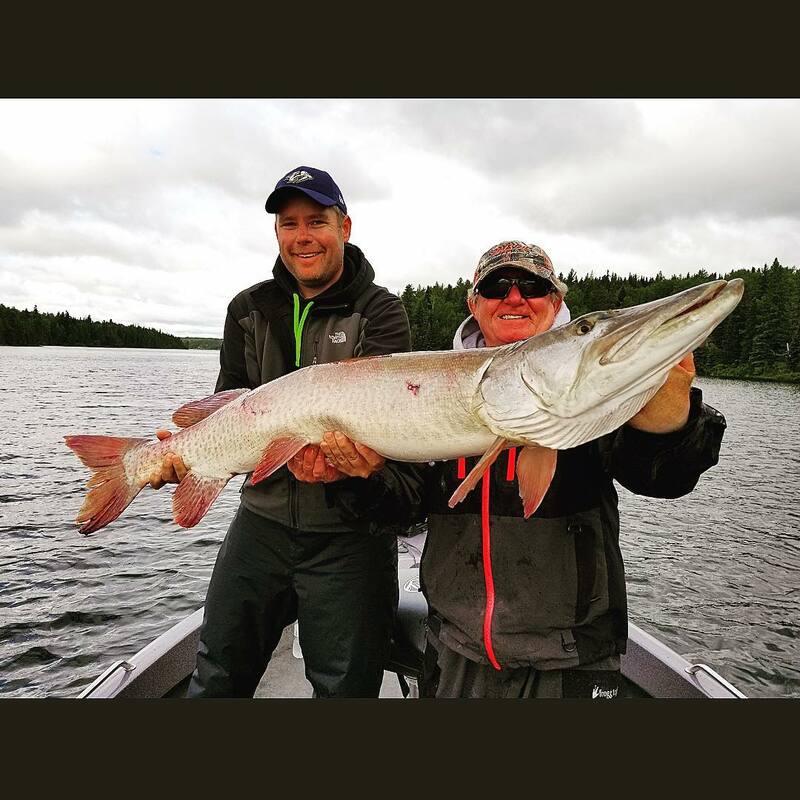 Besides being committed to making your stay as comfortable and relaxing as possible, there is a strong emphasis on providing you with the best fishing and hunting information for your stay. 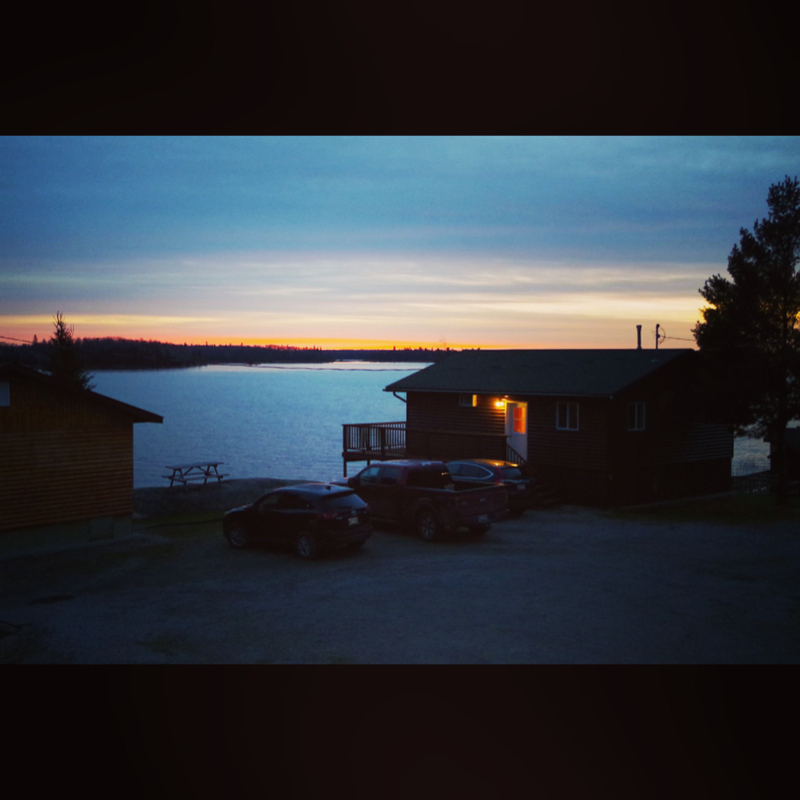 Our lodging accommodations are the perfect getaway you need. 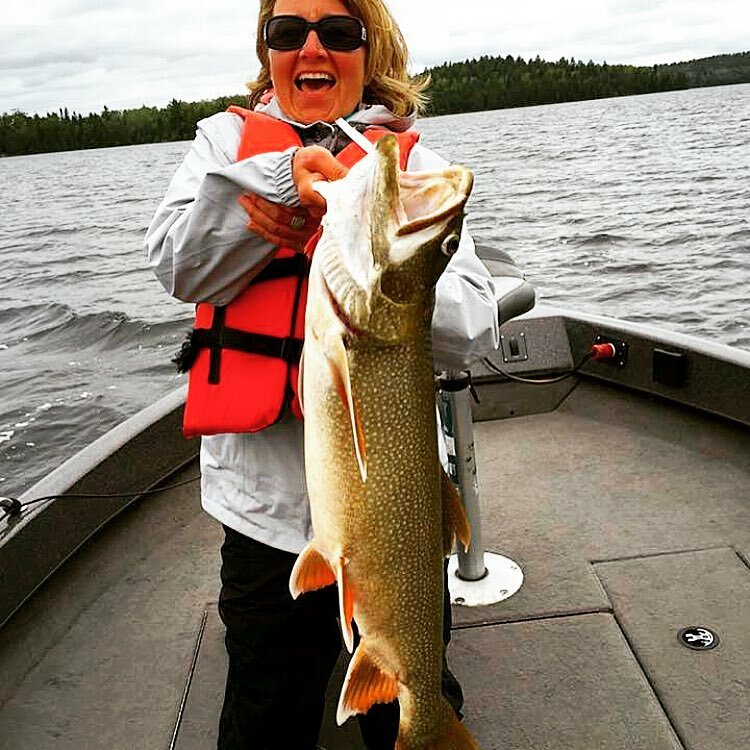 Andy Myers Lodge is more than just Ontario, Canada’s premier fishing and hunting lodge, it’s an escape from the stress of the daily grind. 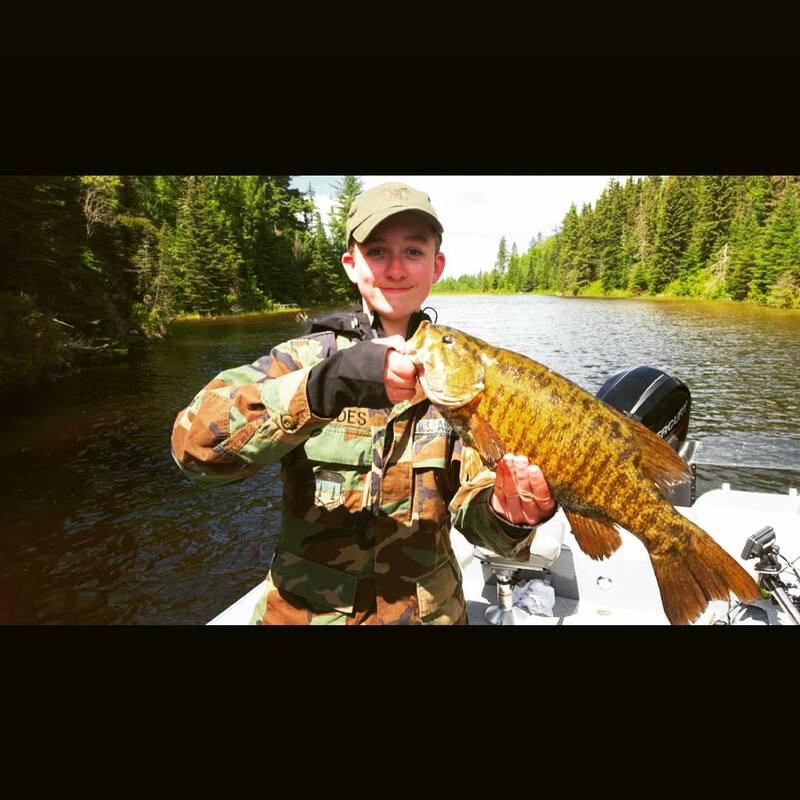 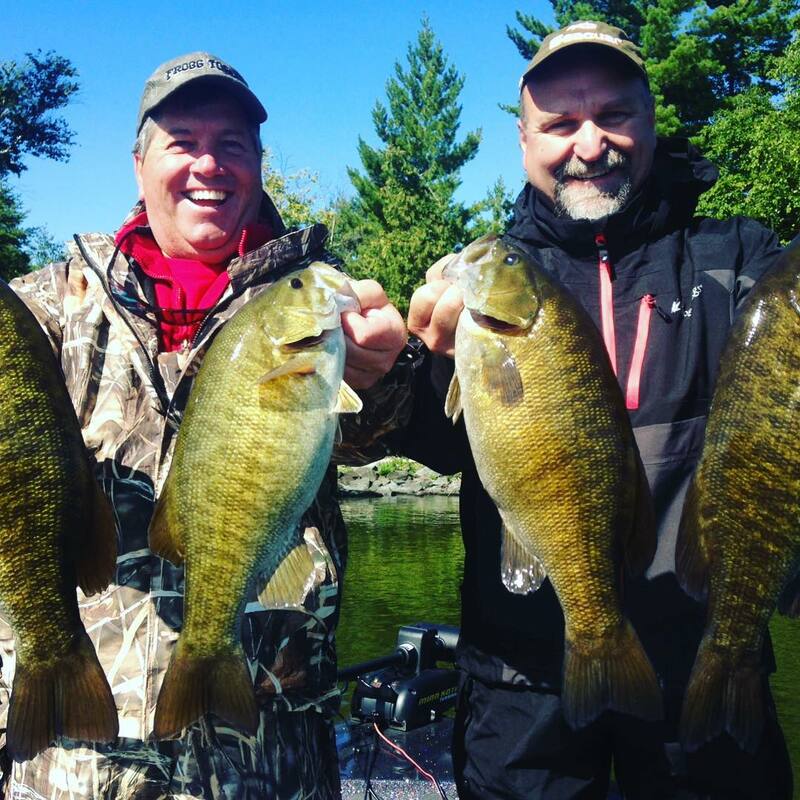 We take pride in matching our world-class fishing and hunting experiences with some of the best lodging accommodations in Ontario, Canada. 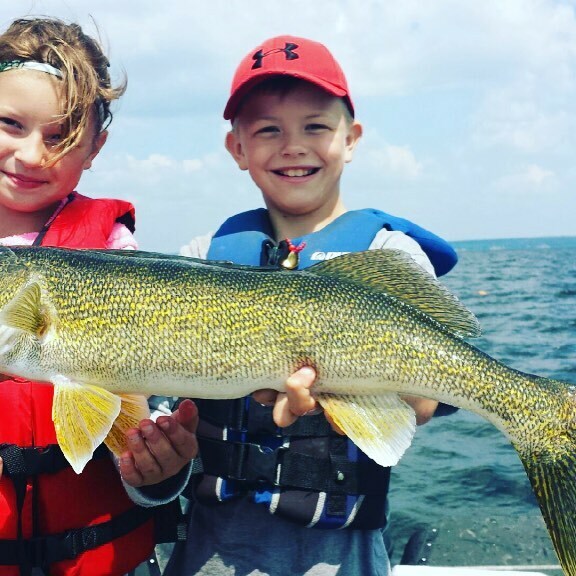 Enjoy the excitement of life on Eagle Lake in Ontario without sacrificing your comfort. 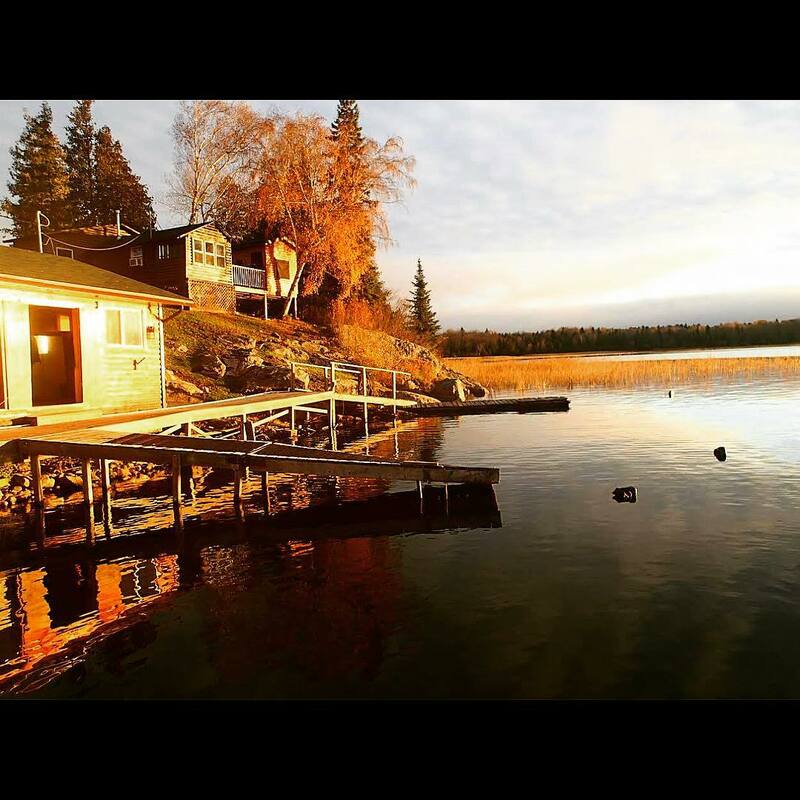 Our lodging has 15 individual handcrafted cabins to handle any size group and is perfect for your relaxation. 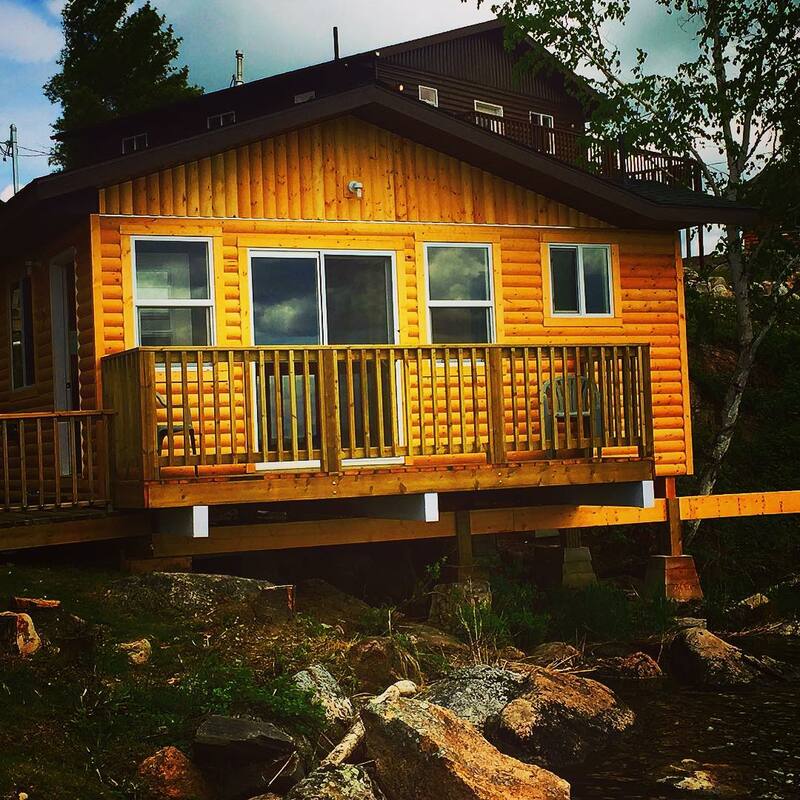 All cabins are completely furnished with the comforts of home. 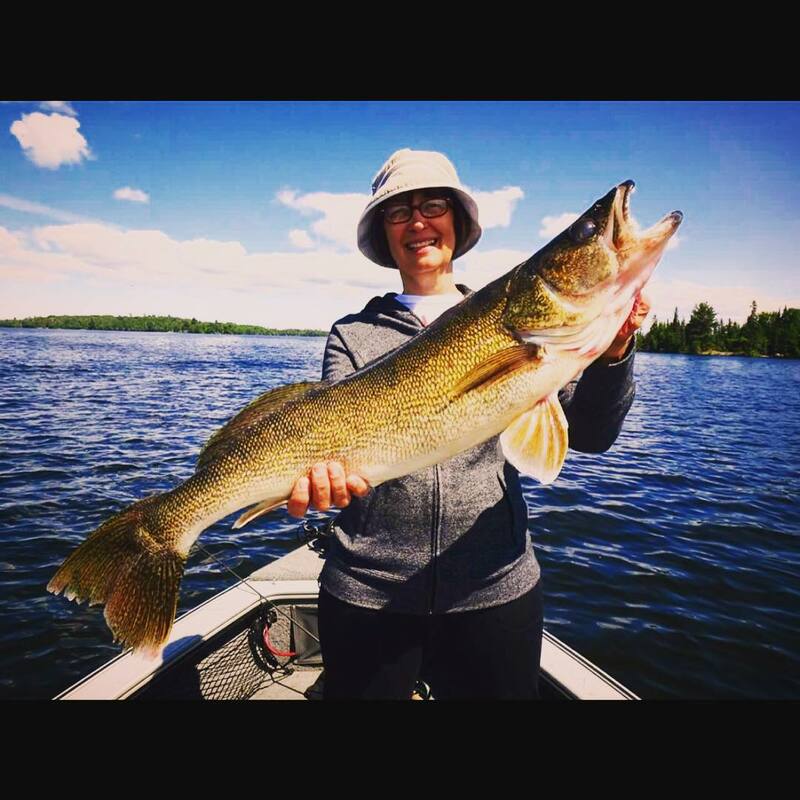 Spend your time fishing on the lake, hunting wild game, or simply relaxing and enjoying the Canadian wilderness and solitude then come back to a hot shower in your own private bathroom. 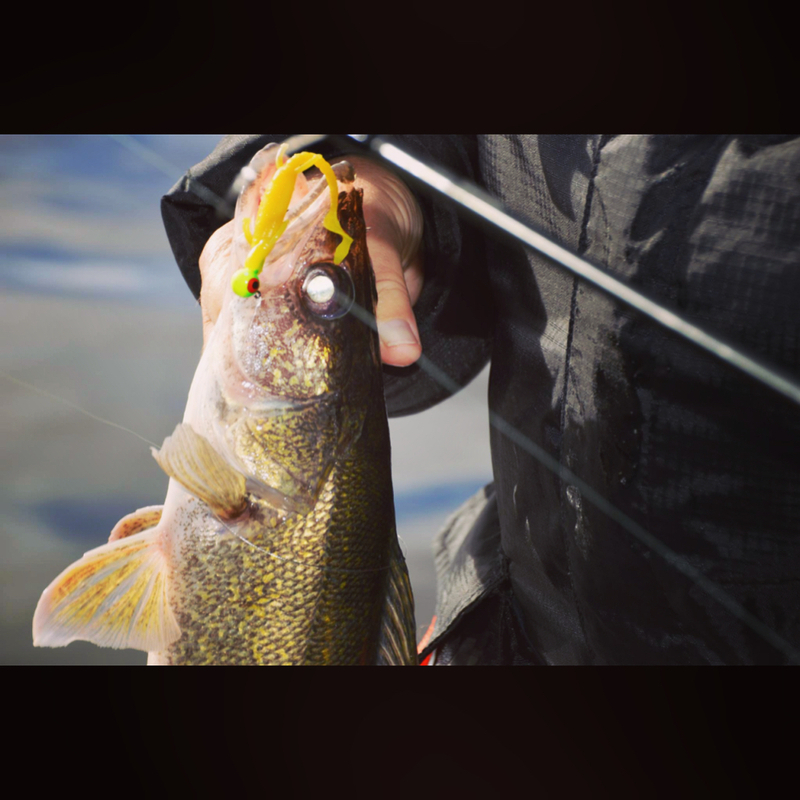 Each climate controlled cabin is equipped with a gas furnace, electric refrigerator and cooking facilities with preparation and eating utensils. 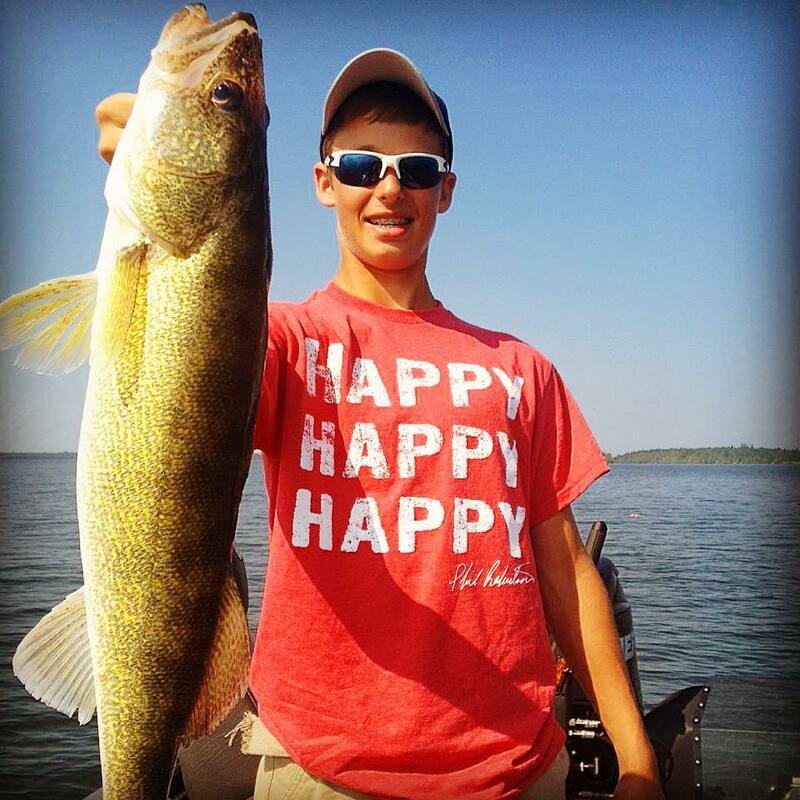 We also provide all the bed linens and towels. 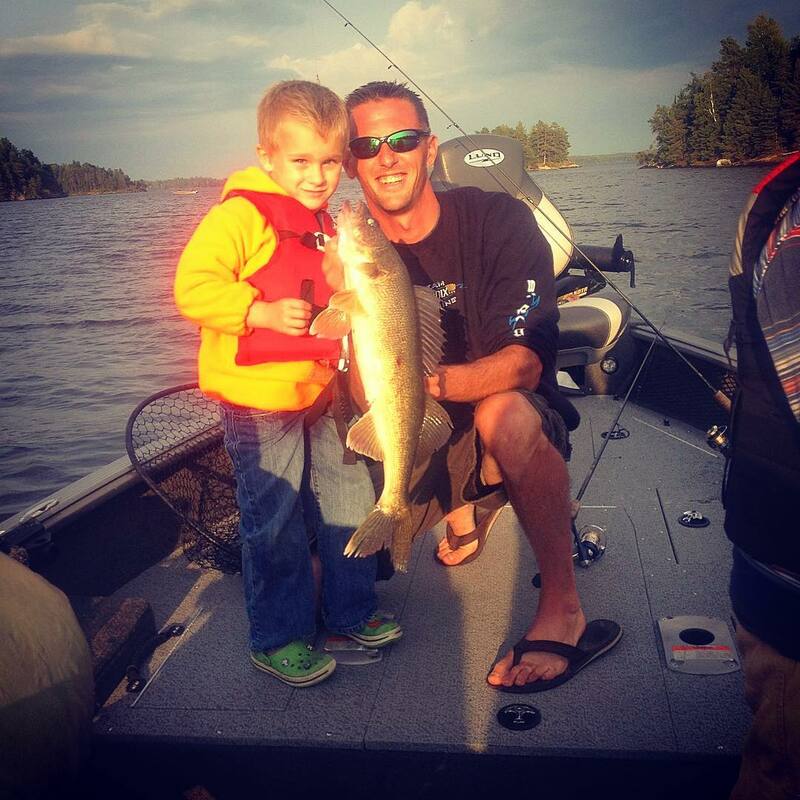 Our facilities and accommodations help keep what you need to bring to a minimum. 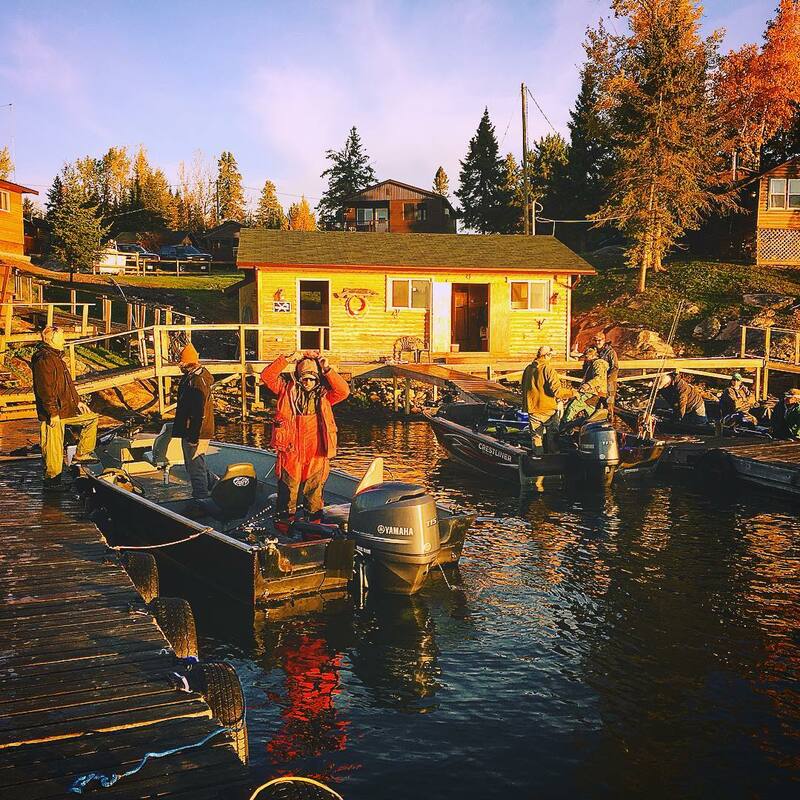 Optional daily seminars to further your skills and knowledge of the lake and its incredible fishery, as well as nightly rap sessions, are held in our main lodge, where you’ll be greeted by a roaring fireplace and a casual setting where you can relax and socialize. 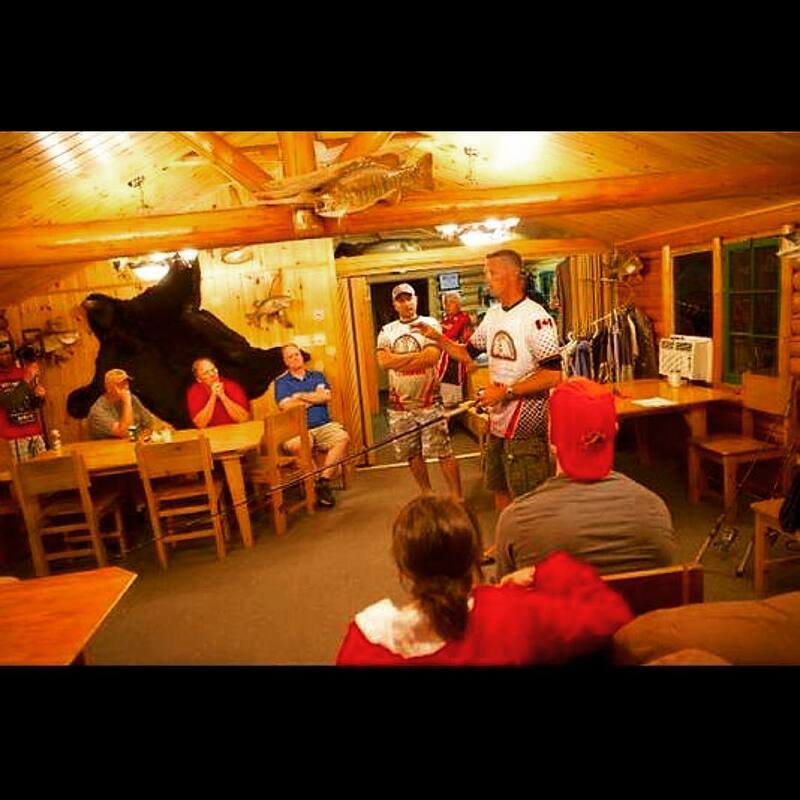 Meet and swap stories with other guests mingle with the guides, wifi is also available. 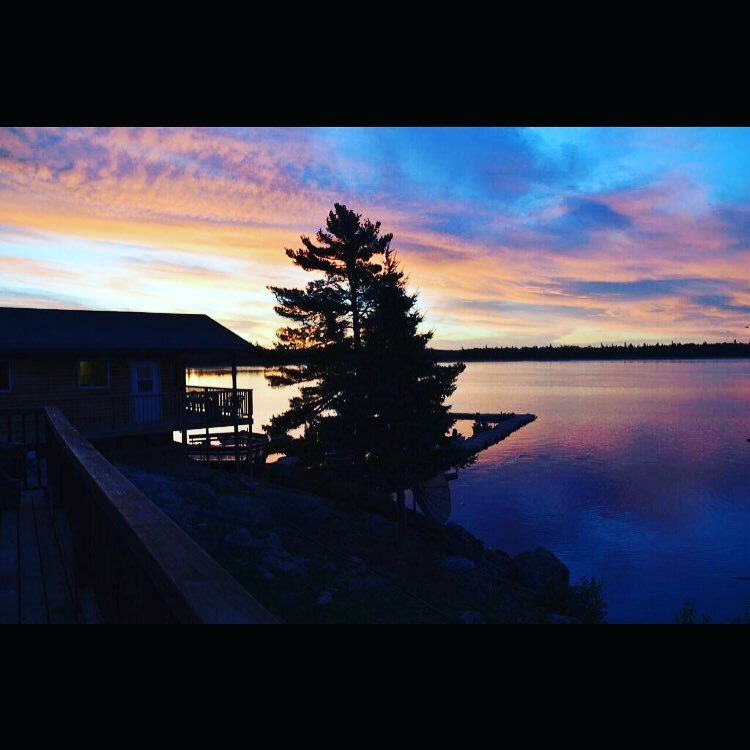 Learn more about our lodge. 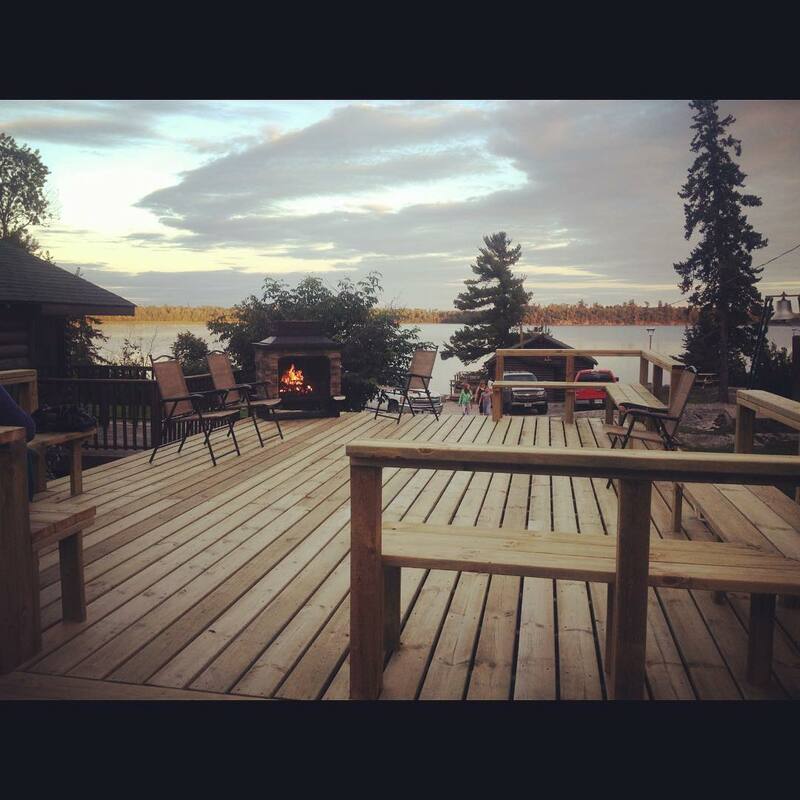 In our dining room overlooking beautiful Eagle Lake, there are enough tables, chairs, and couches to accommodate your whole group and then some. 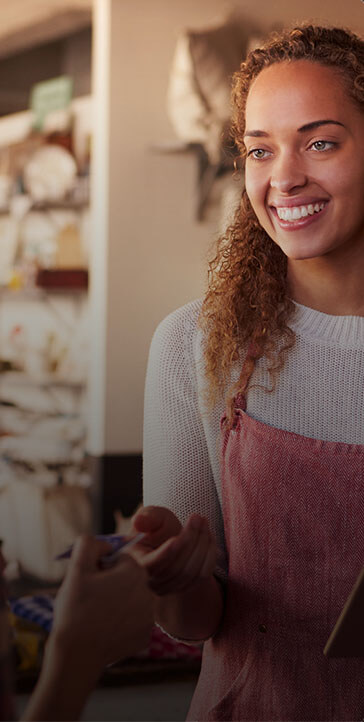 Enjoy hearty home cooked breakfasts and evening meals when you purchase our American plan package or just evening meals with the Housekeeping package. 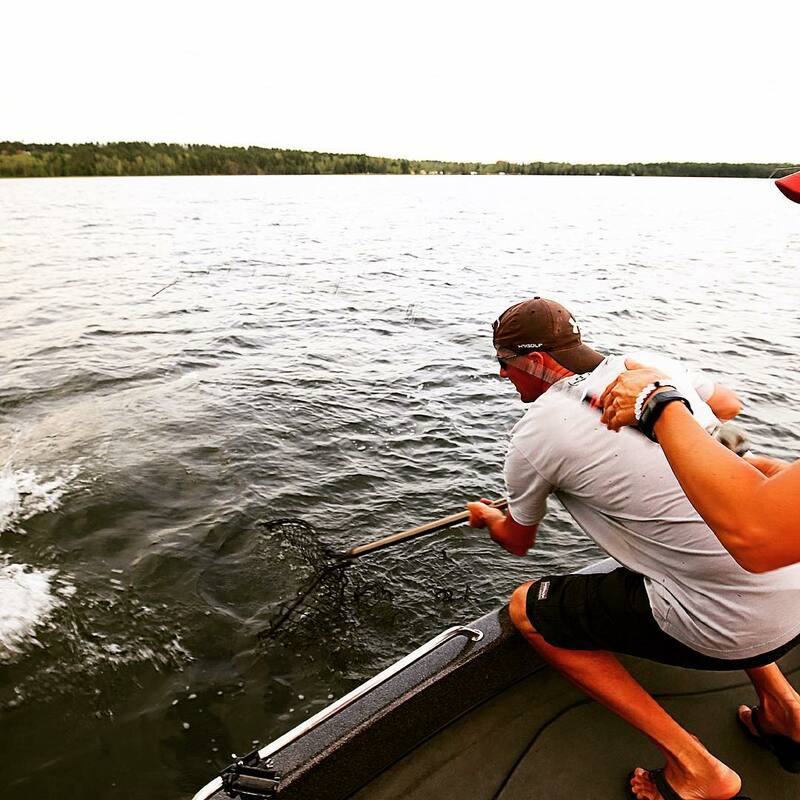 Fishing is probably one of the most enjoyed sports of our time. 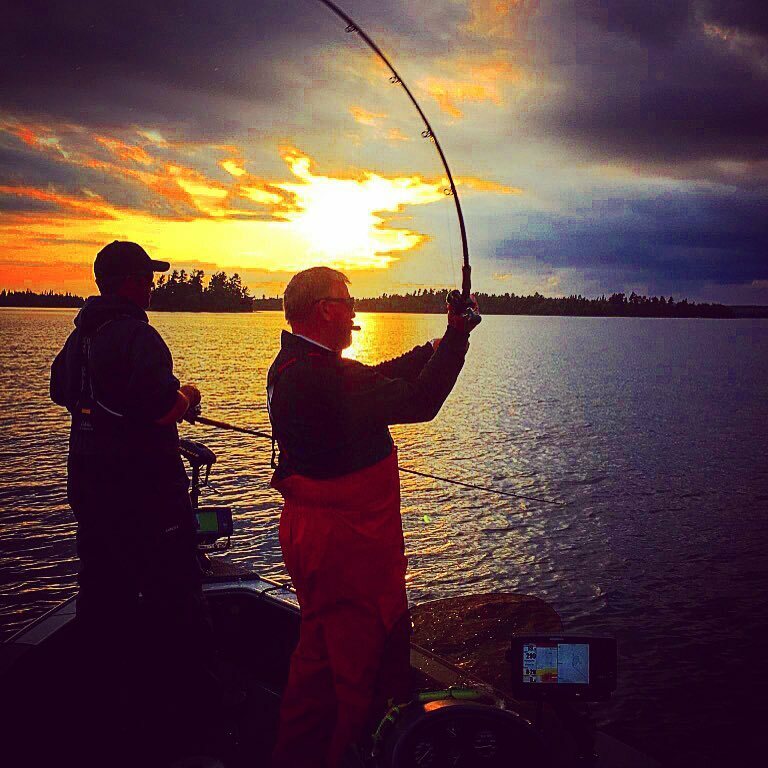 With its relaxing feel and high rate of success, you can’t beat the art of fishing. 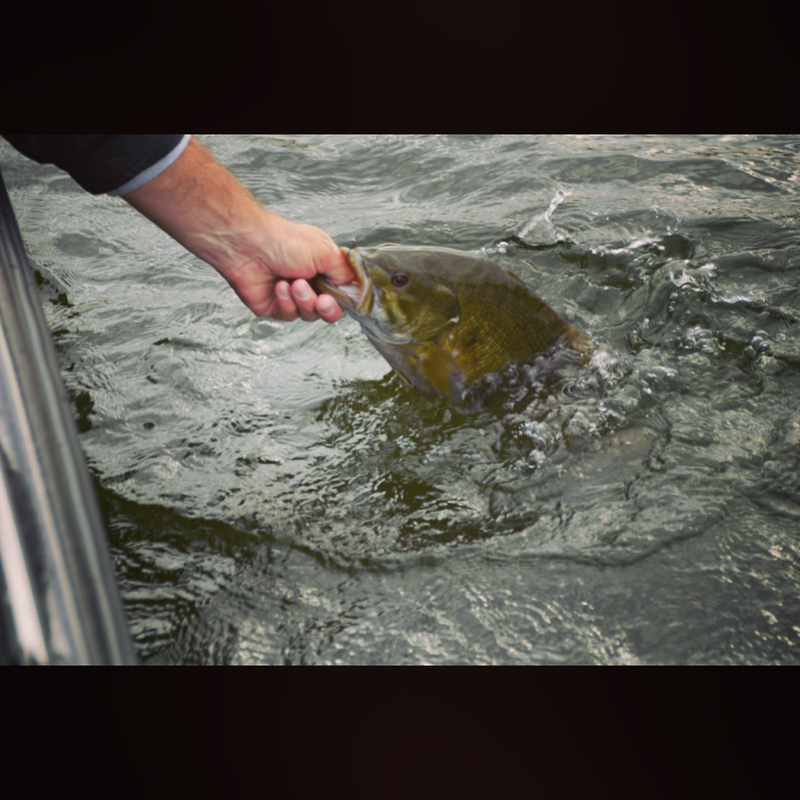 What’s also great about fishing is that it can be enjoyed as a leisurely activity or as a competitive sport. 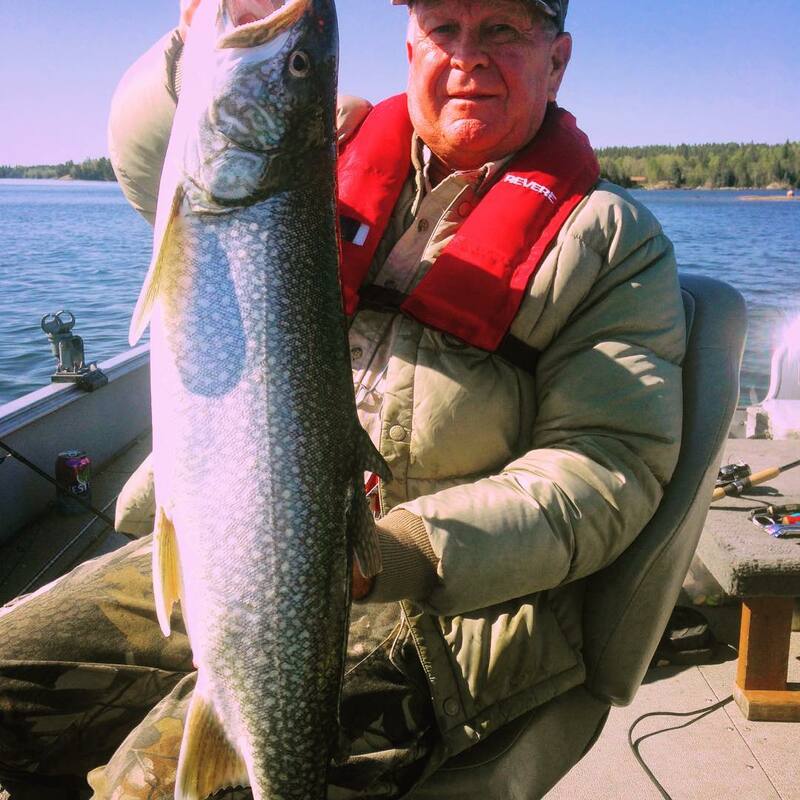 Here at Andy Myers Lodge, we are your number one Eagle Lake Ontario, Canada fishing lodge, providing you with great accommodations and a great opportunity to catch good fish. 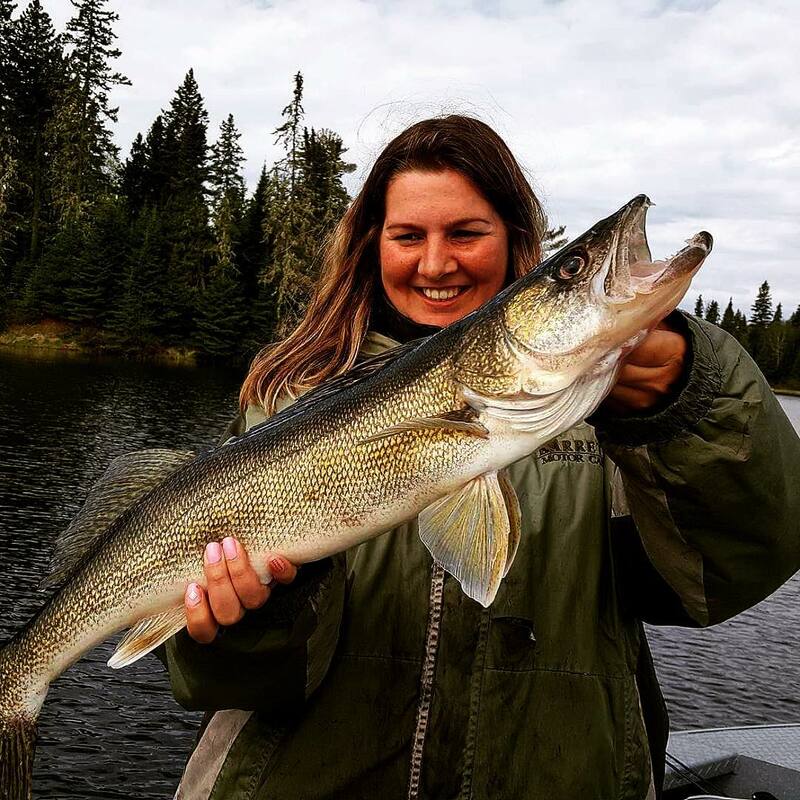 If you are looking for the perfect getaway from the chaos of life, then come to our Canadian fishing lodge where you’ll be able to relax, have a great time and enjoy good fishing. 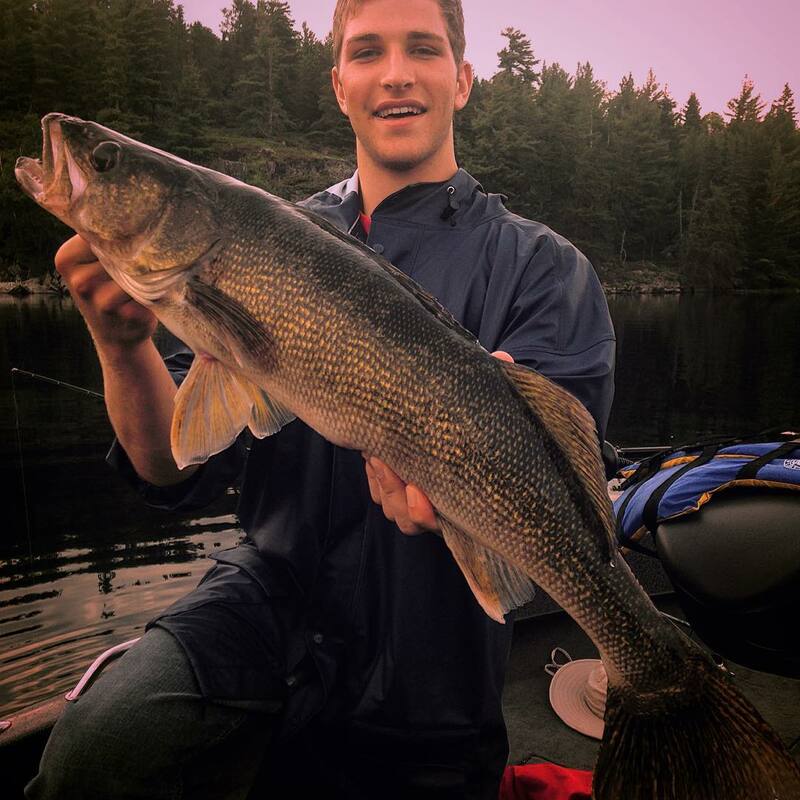 Eagle Lake Ontario, Canada, is famous for its Canadian fishing and scenic beauty. 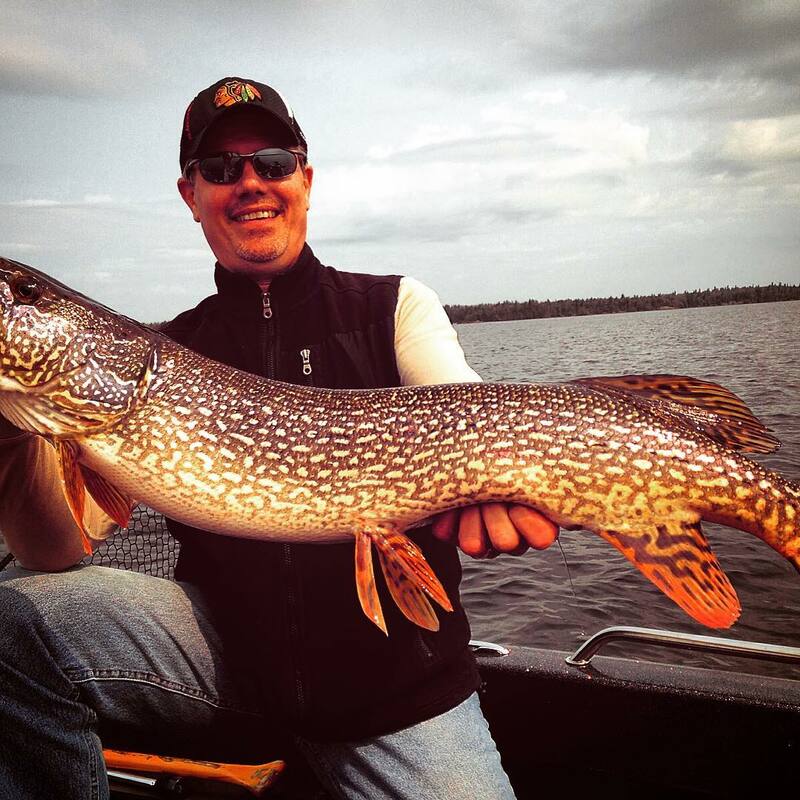 With its features of 63,428 acres of water and more than 490 islands, your Eagle Lake fishing will be one to remember. 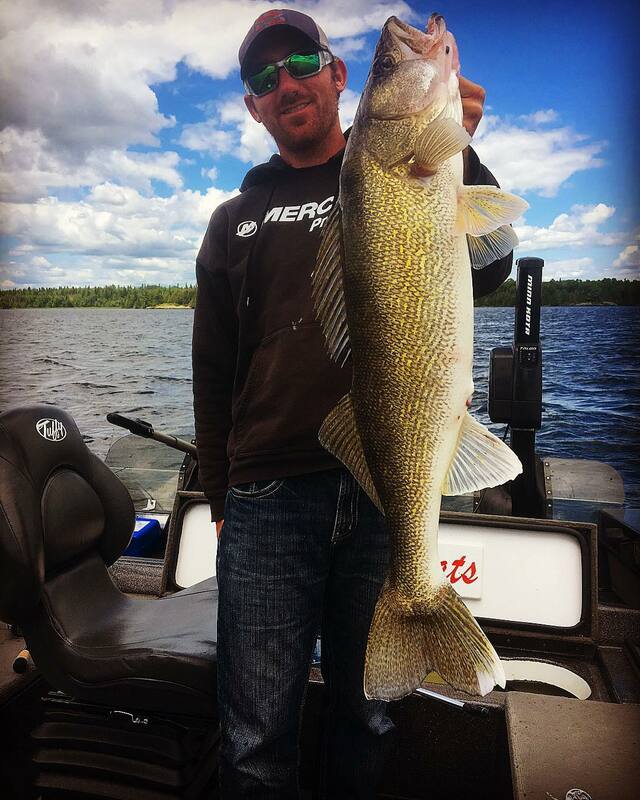 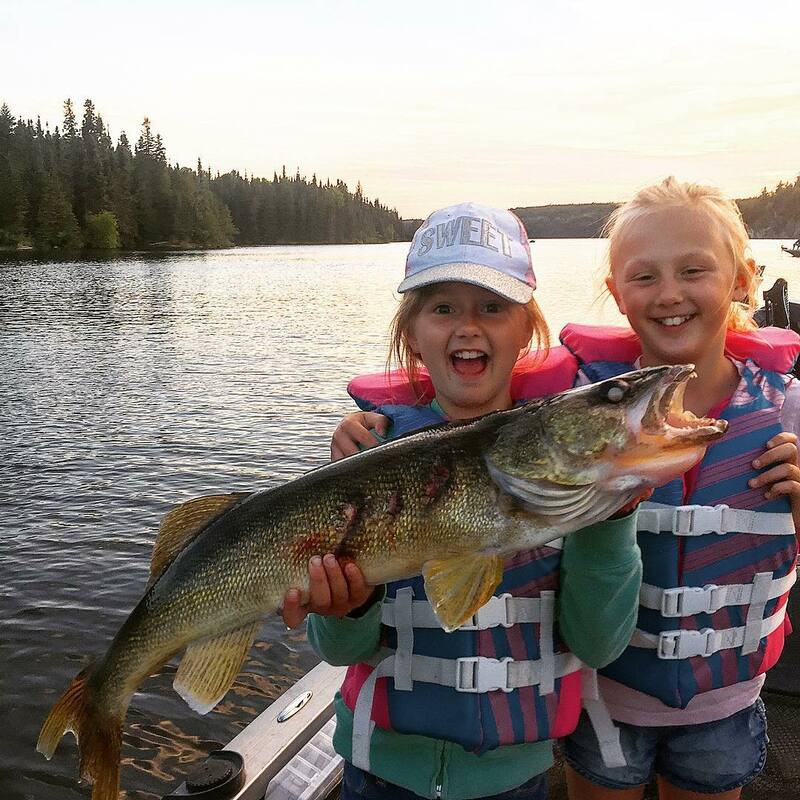 Fishing on Eagle Lake is unique in that it produces trophy fishing and is one of the most exciting Canadian lakes for fishing. 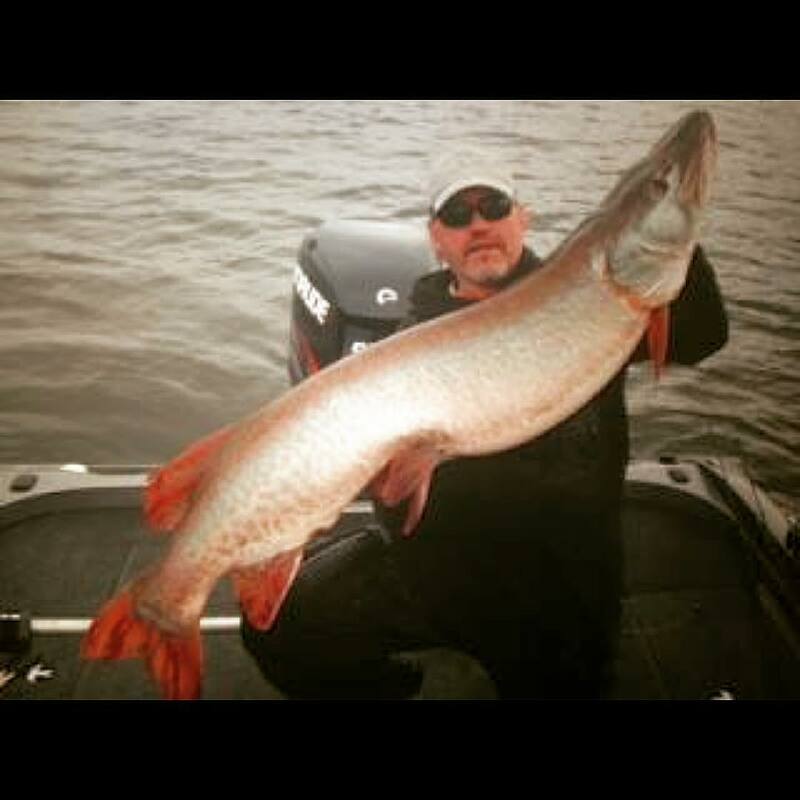 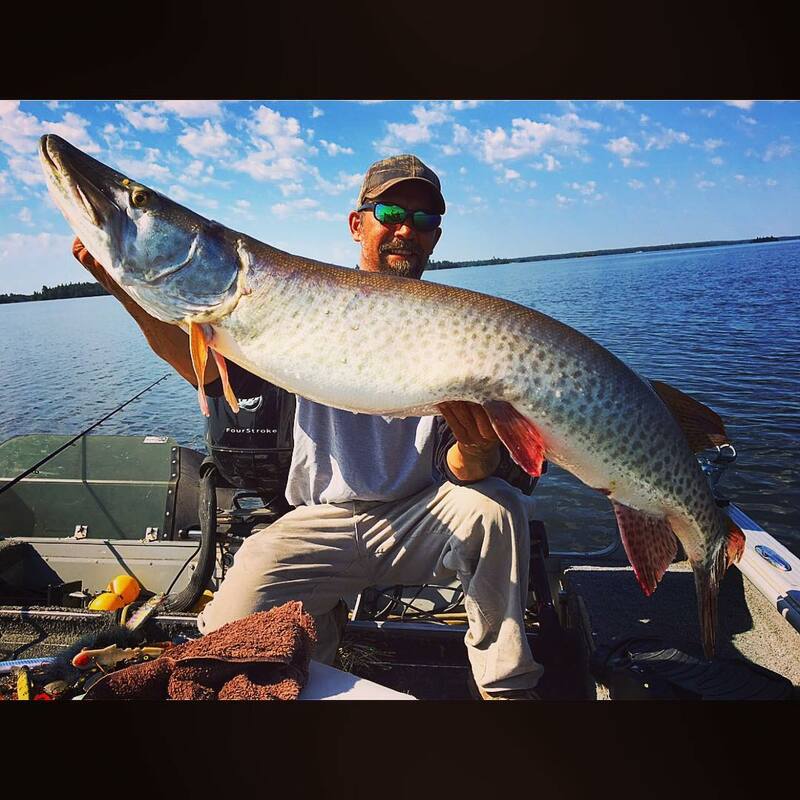 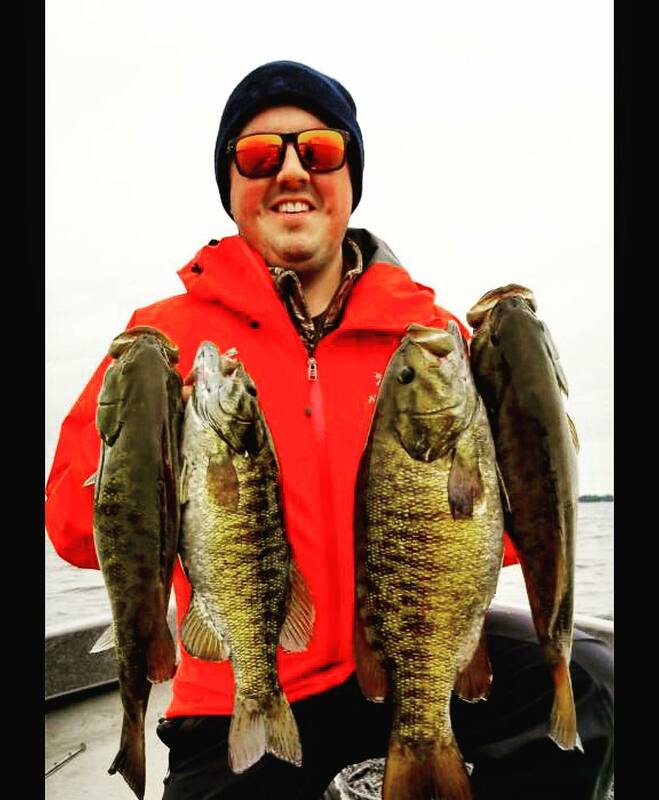 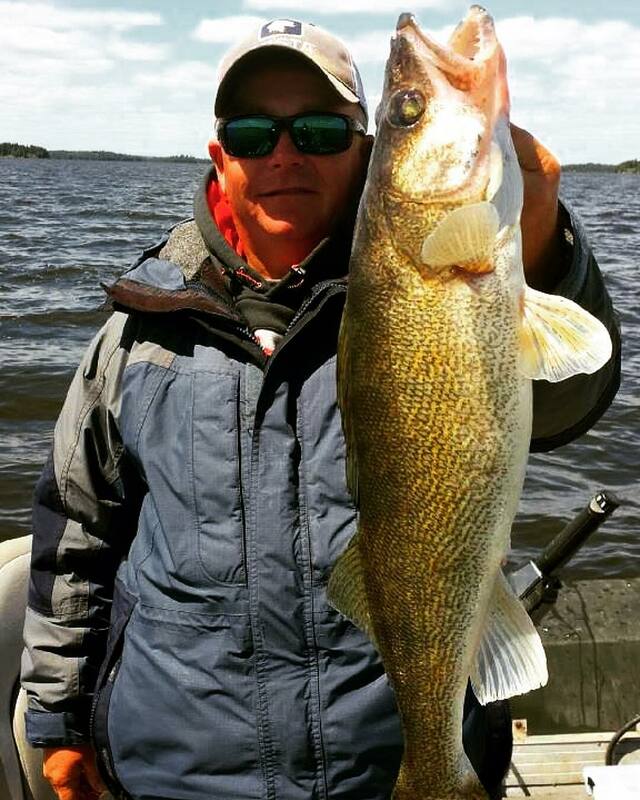 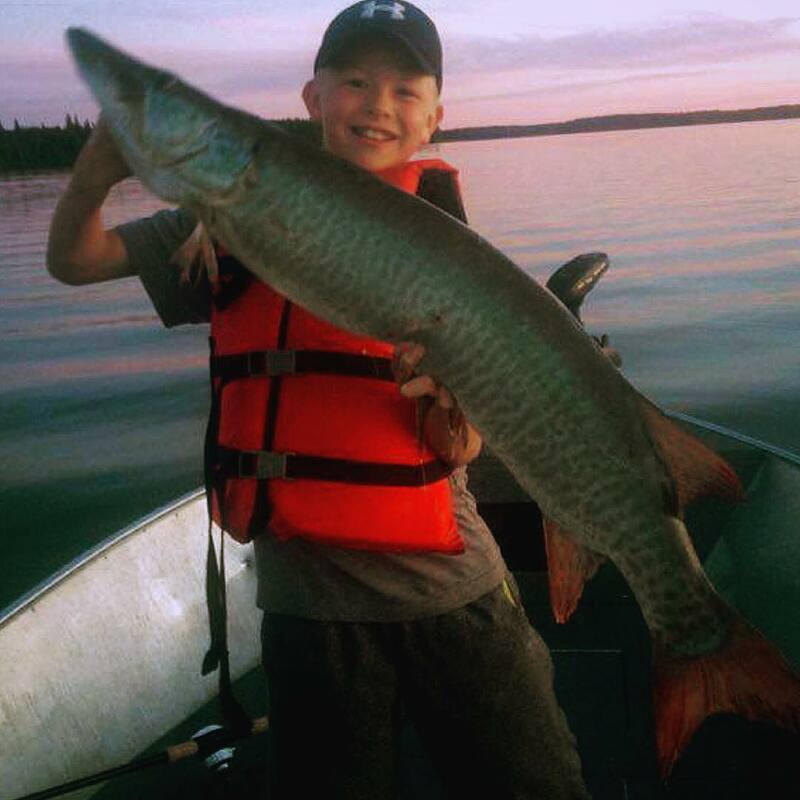 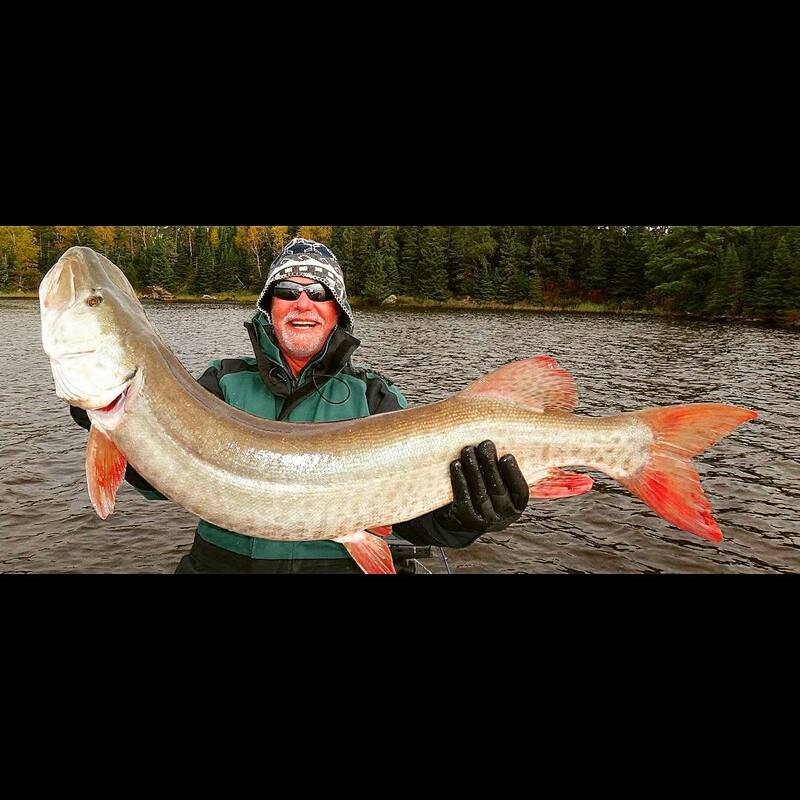 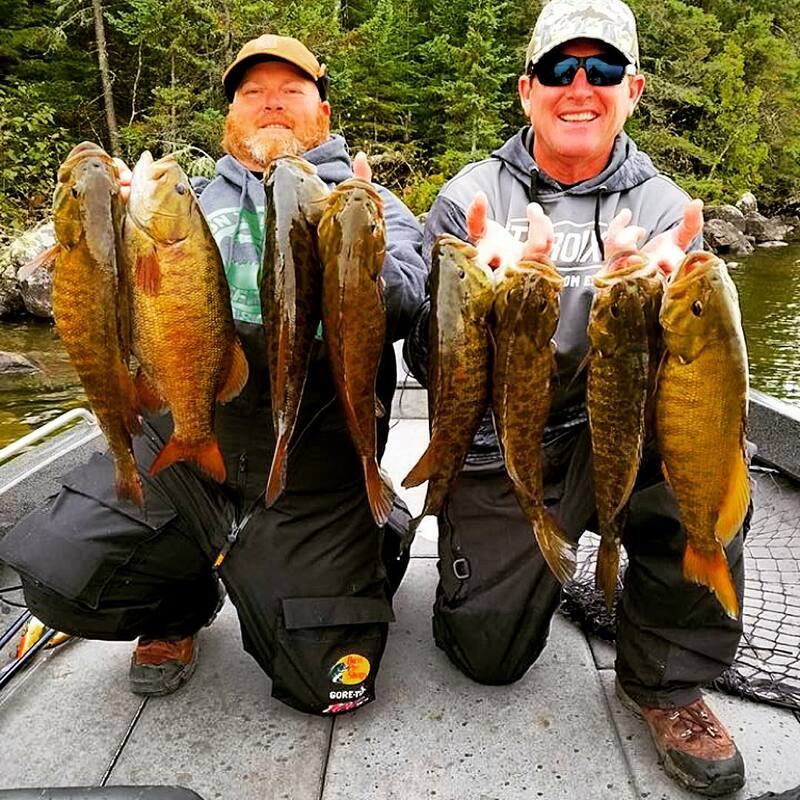 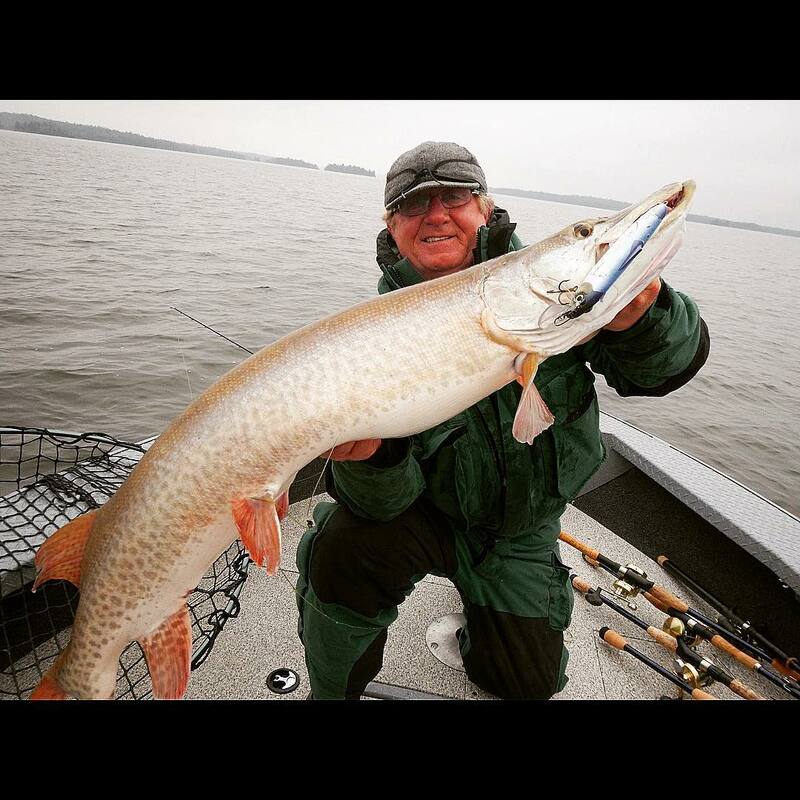 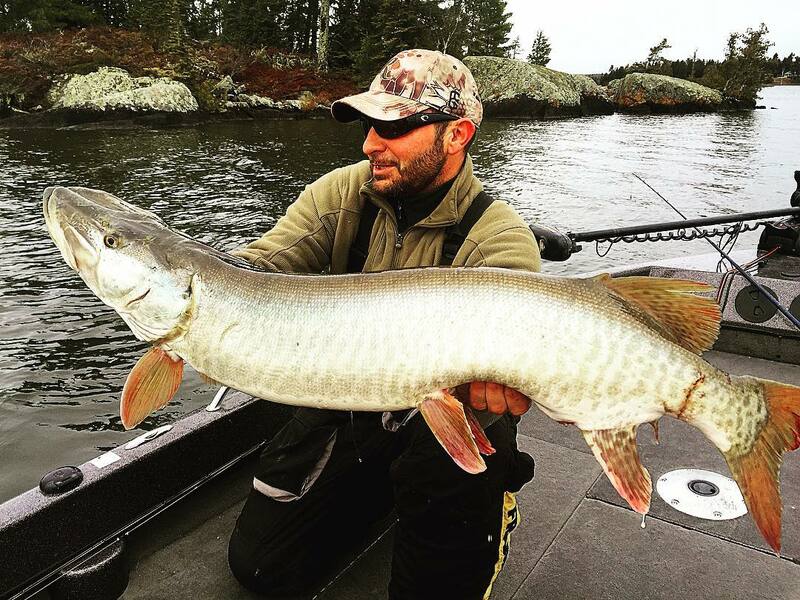 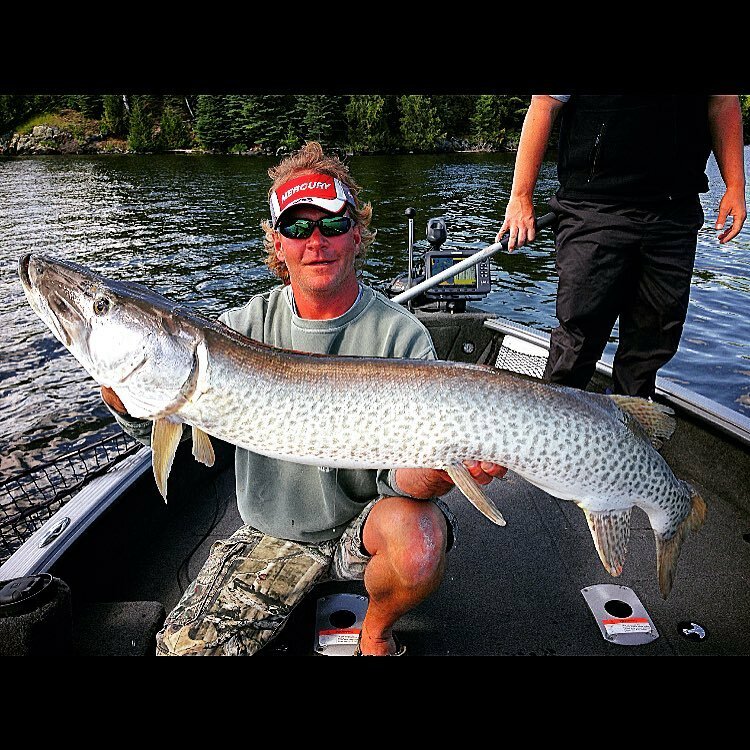 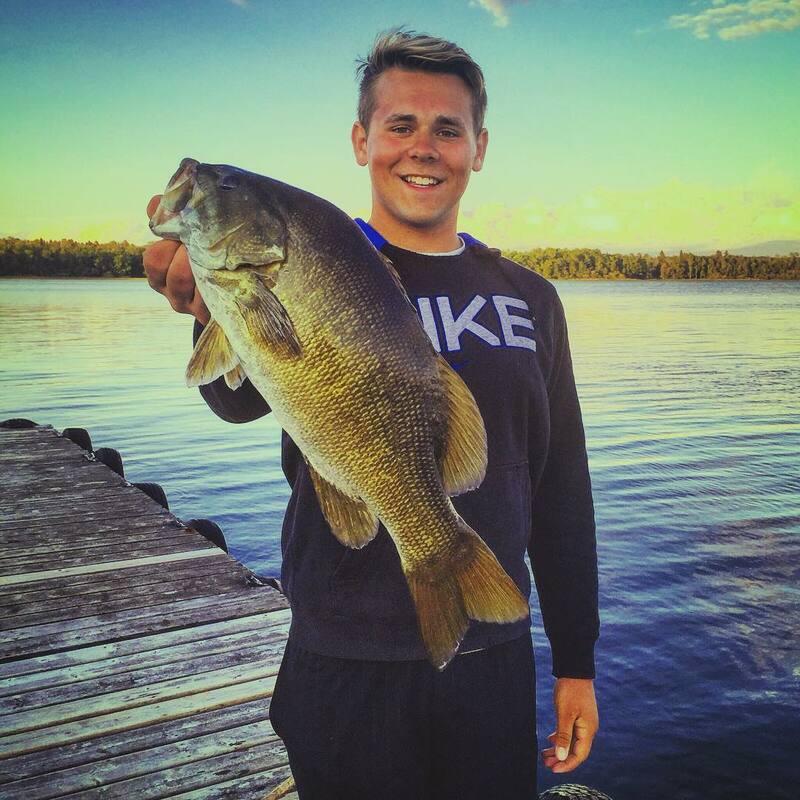 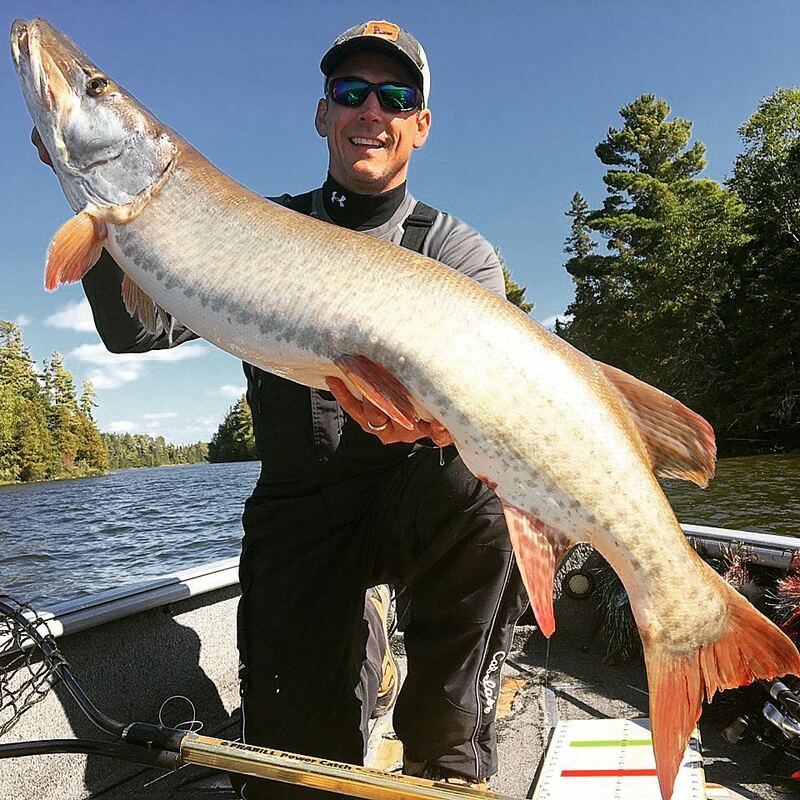 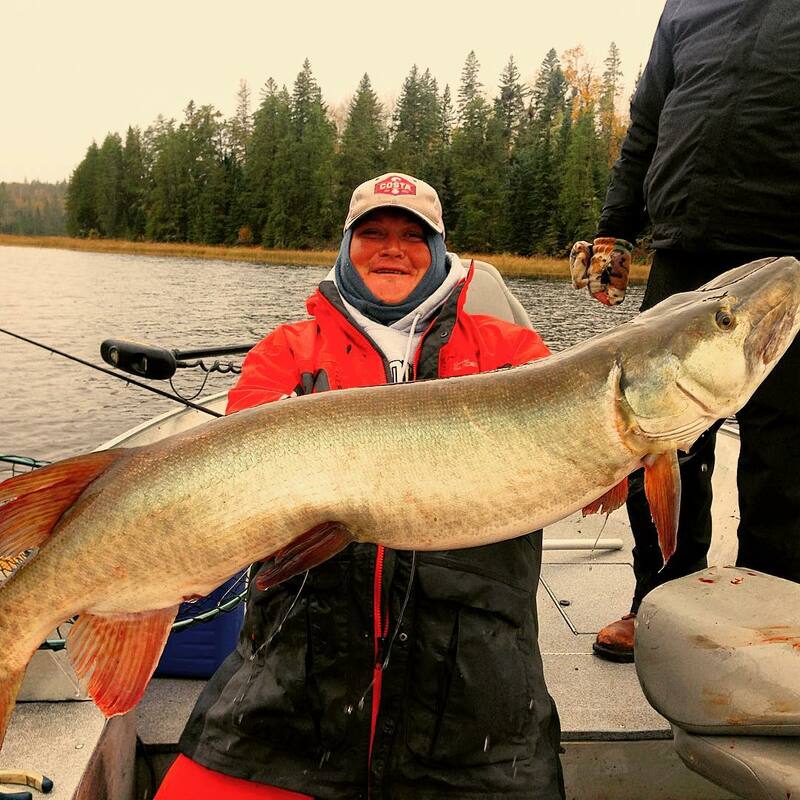 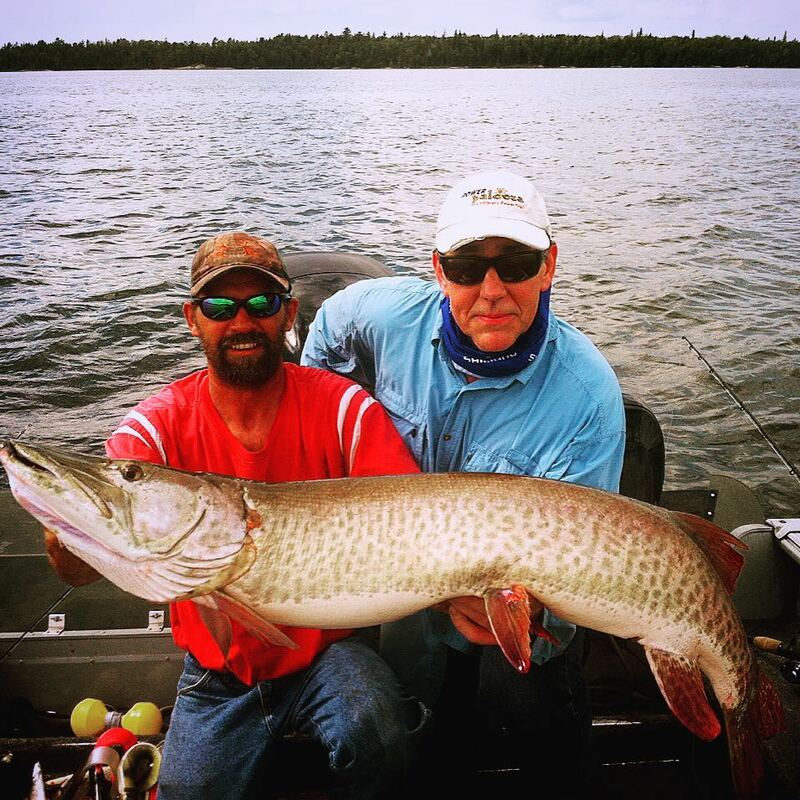 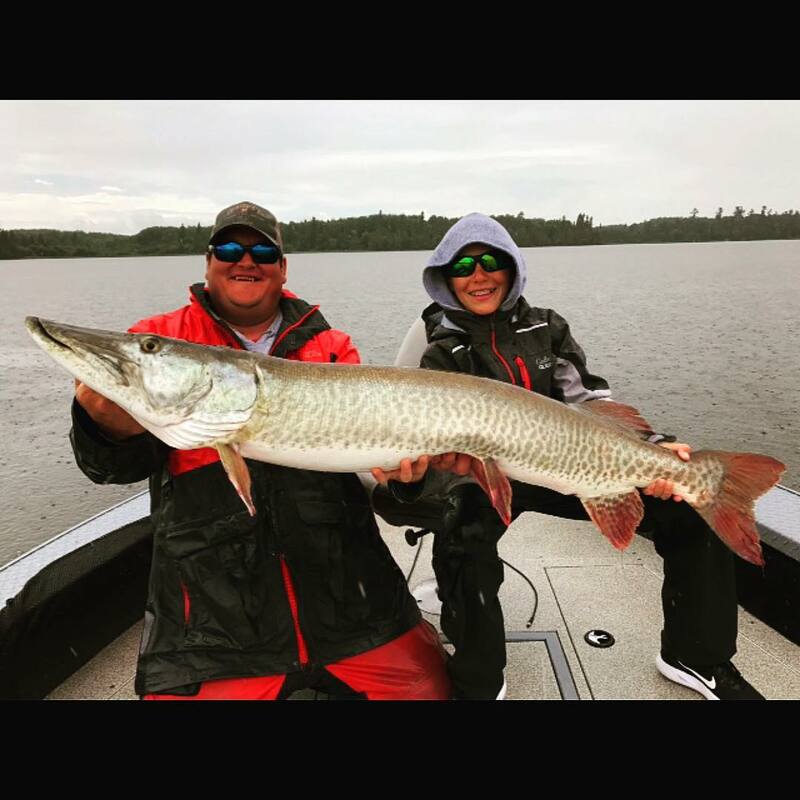 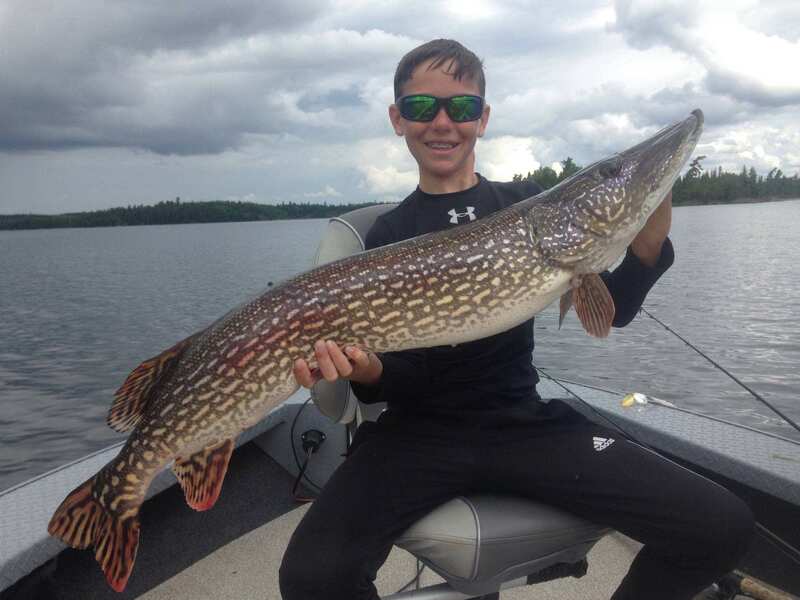 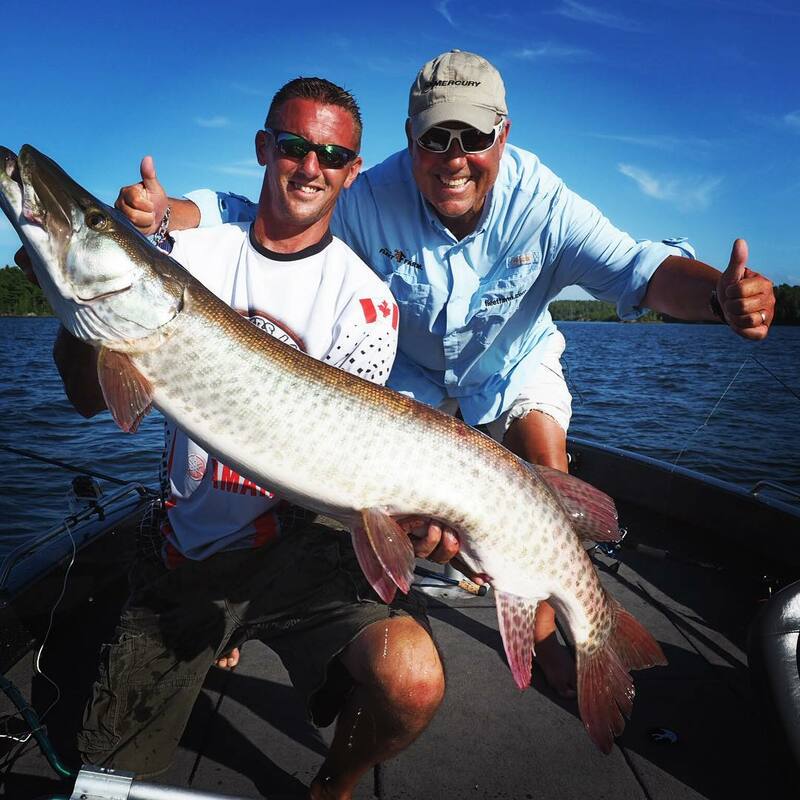 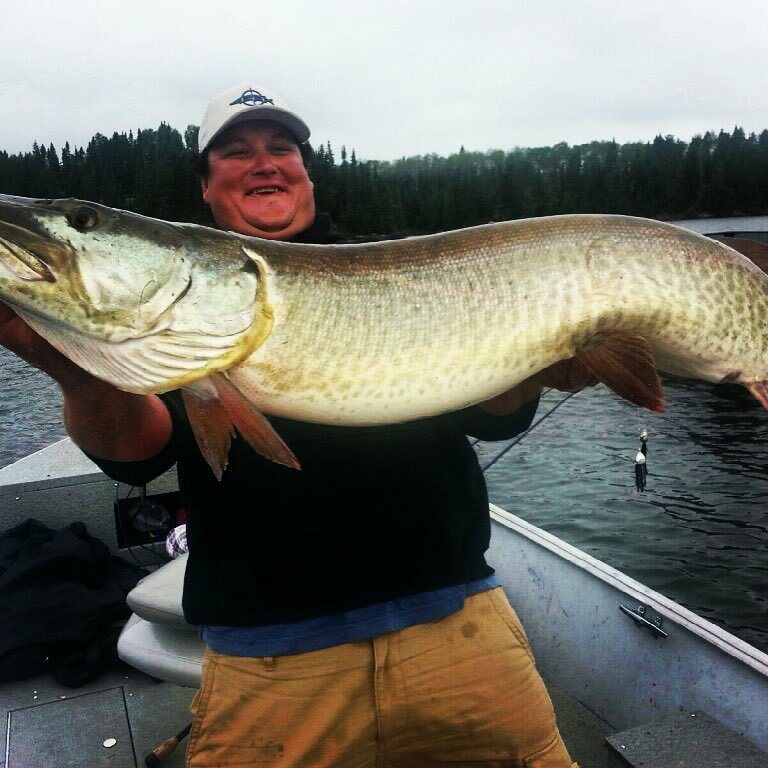 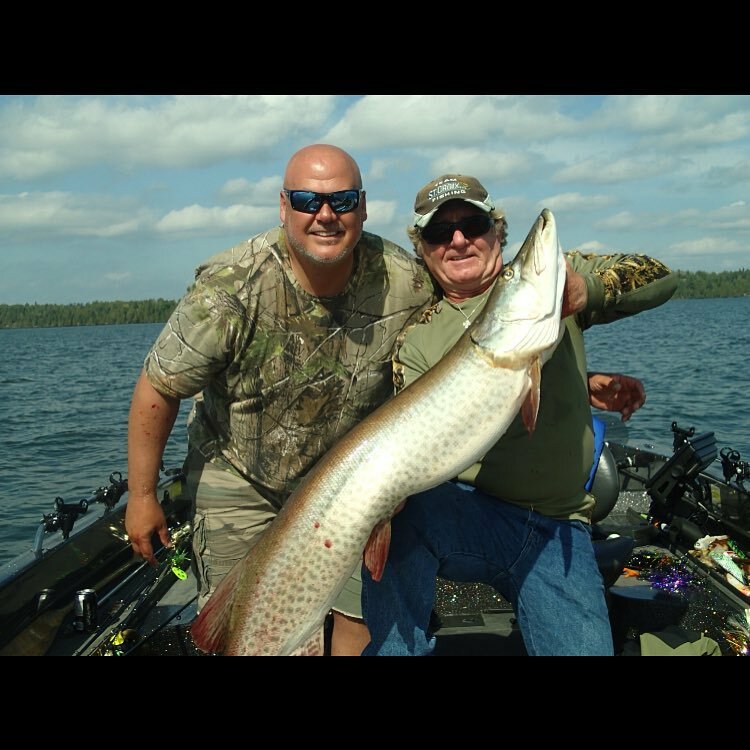 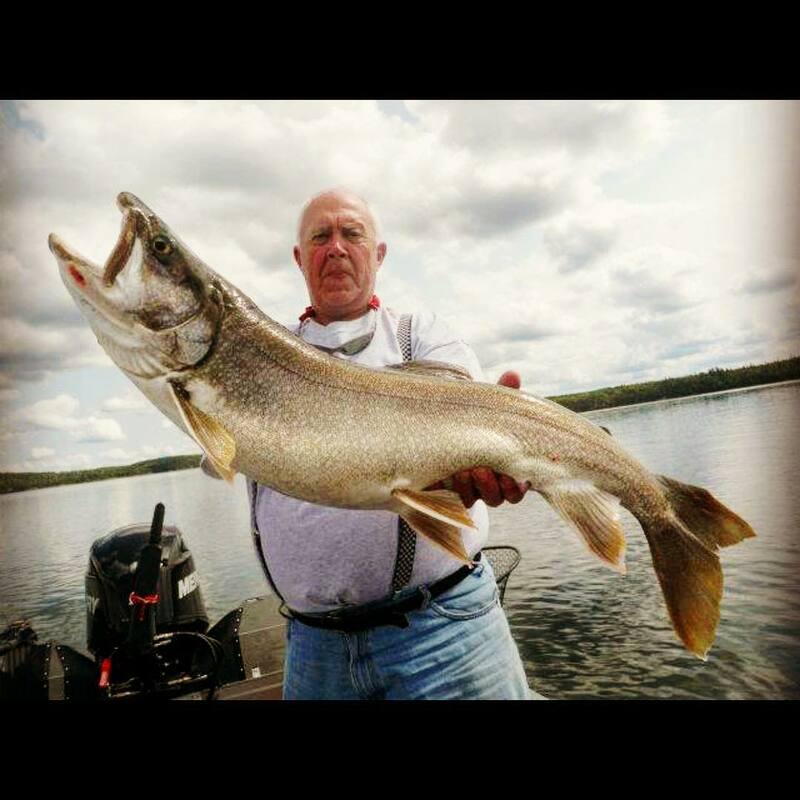 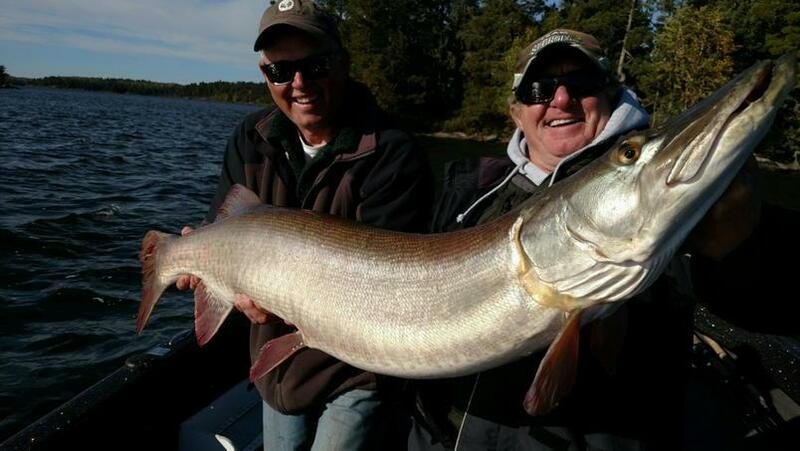 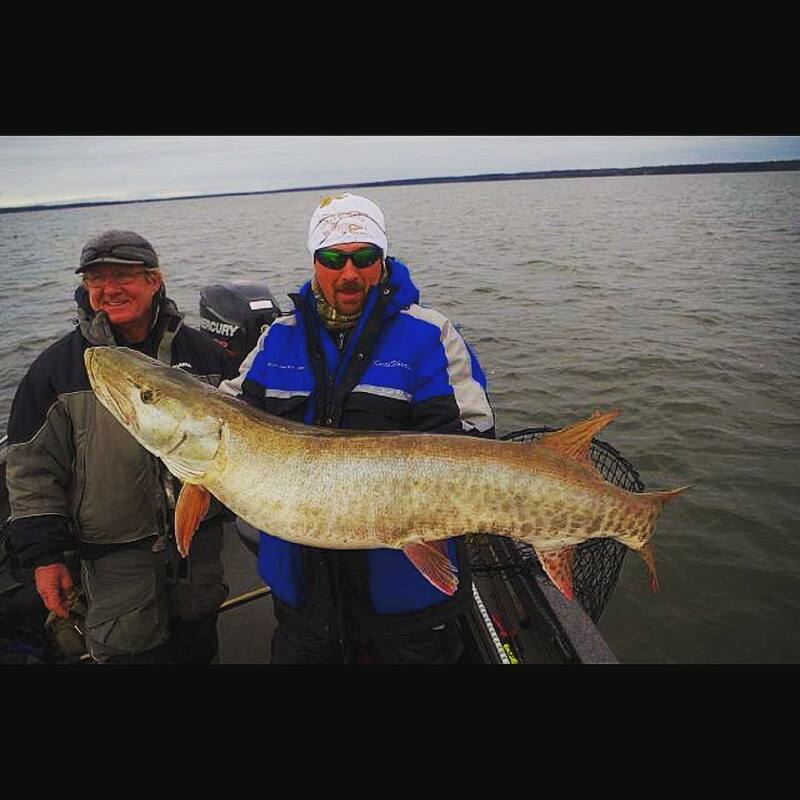 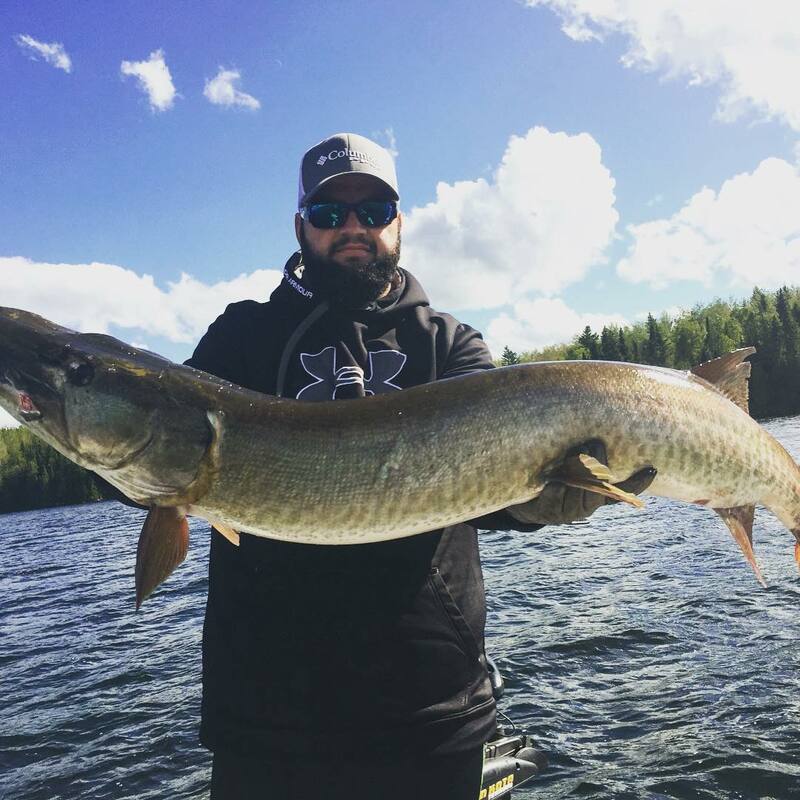 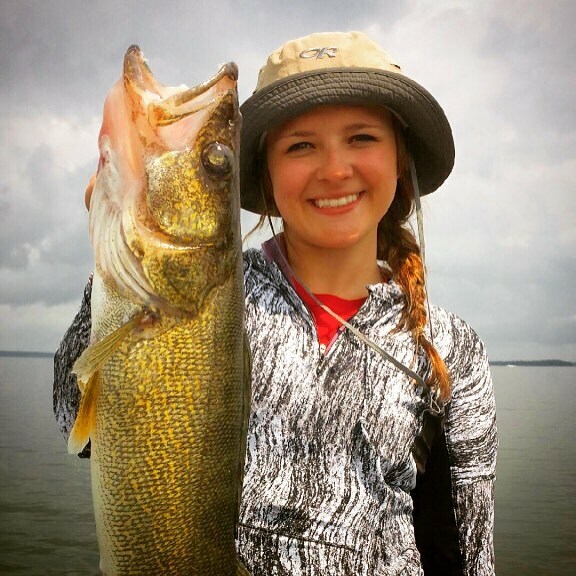 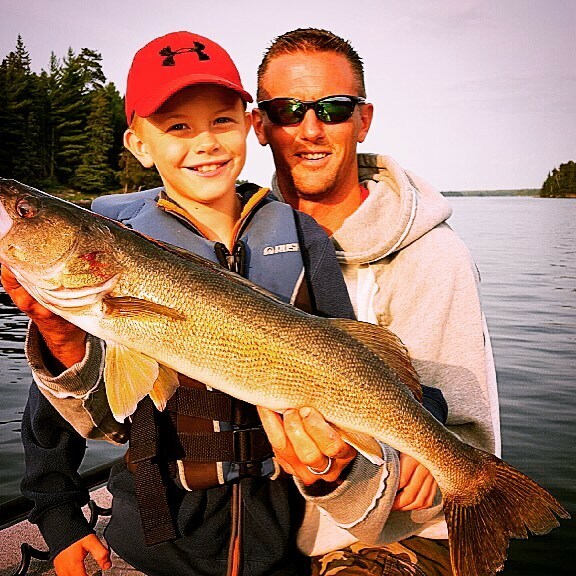 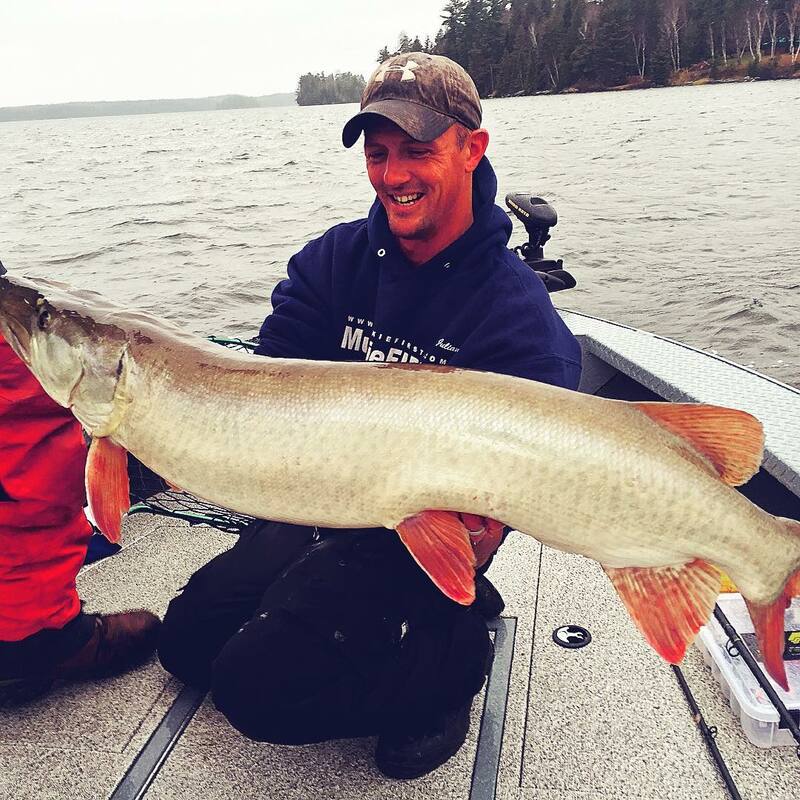 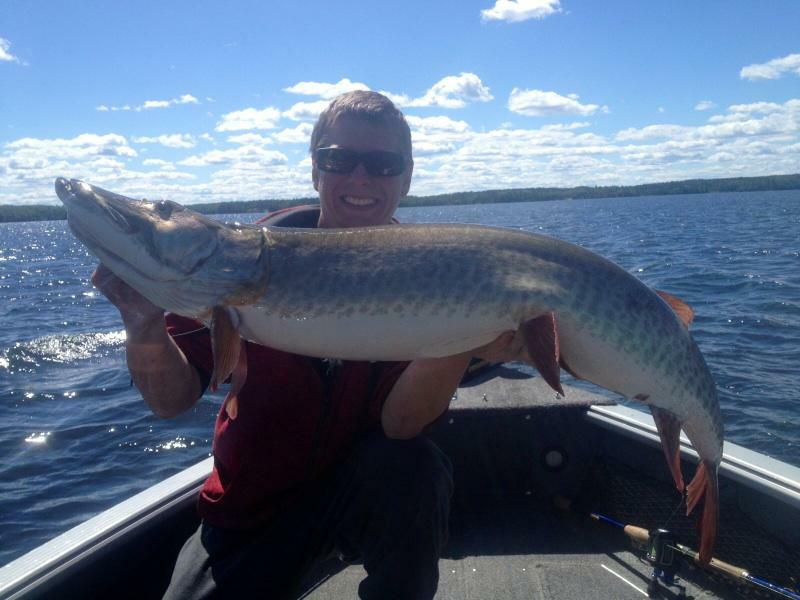 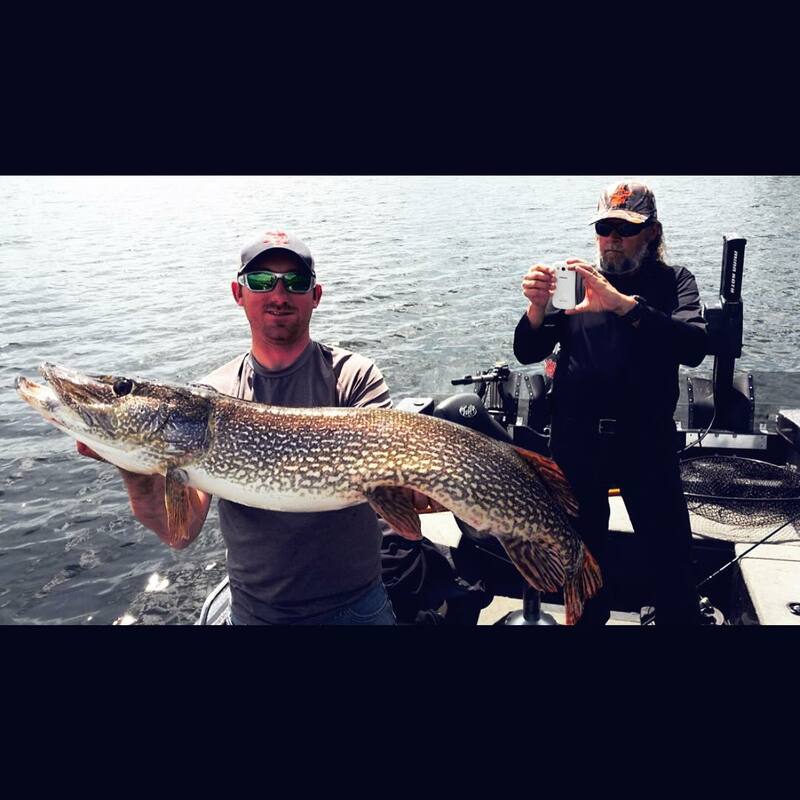 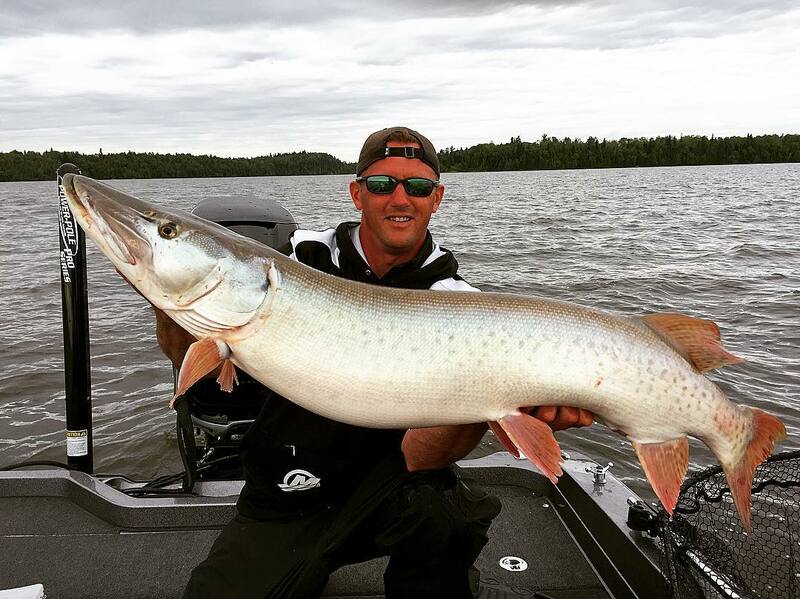 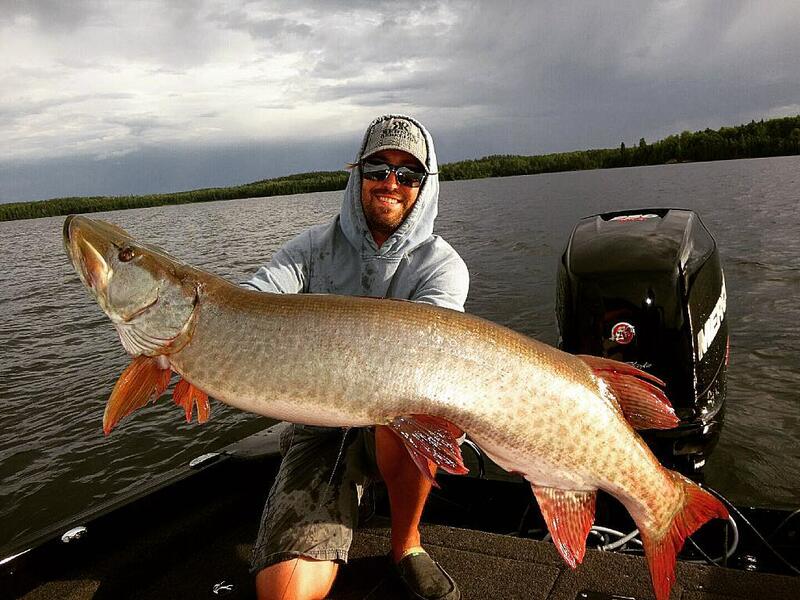 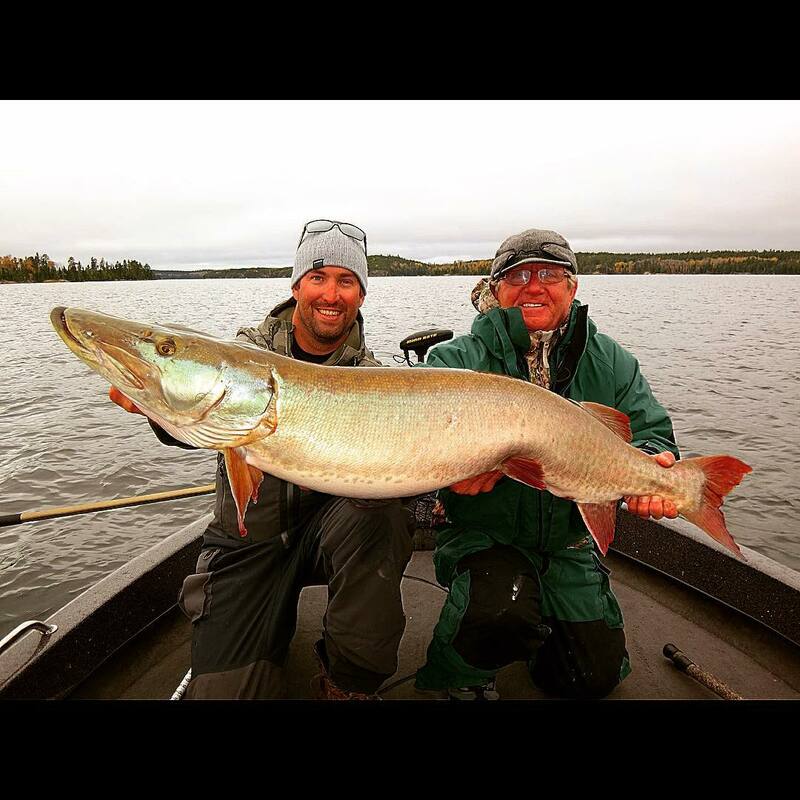 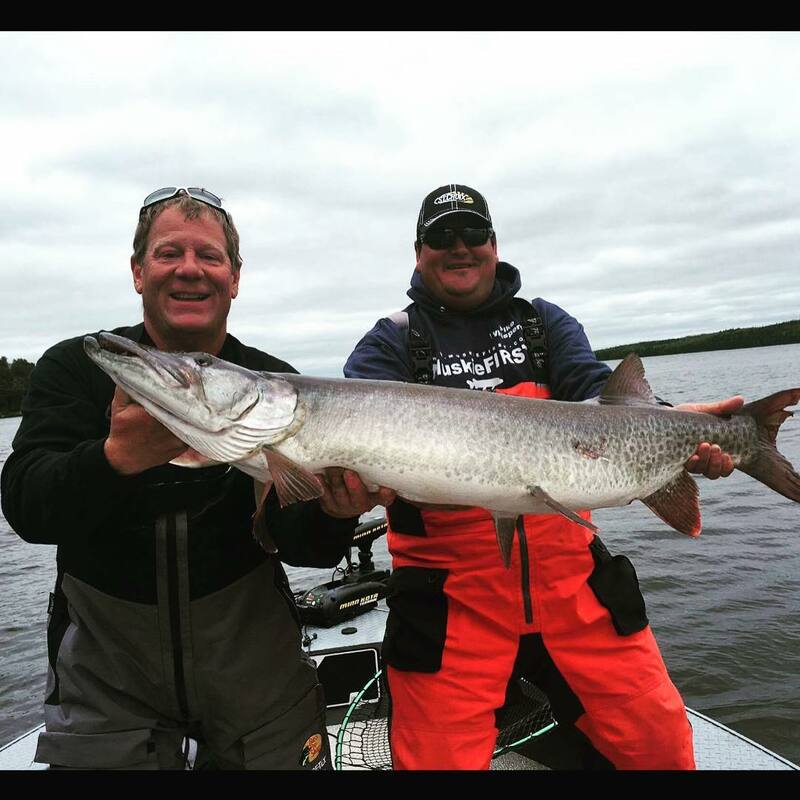 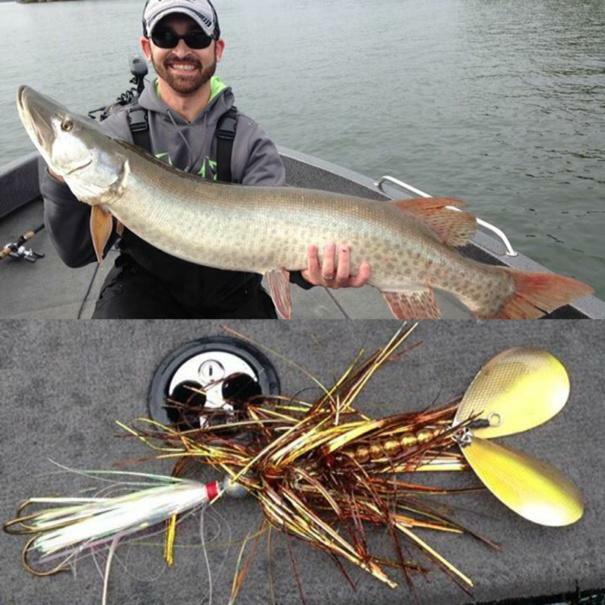 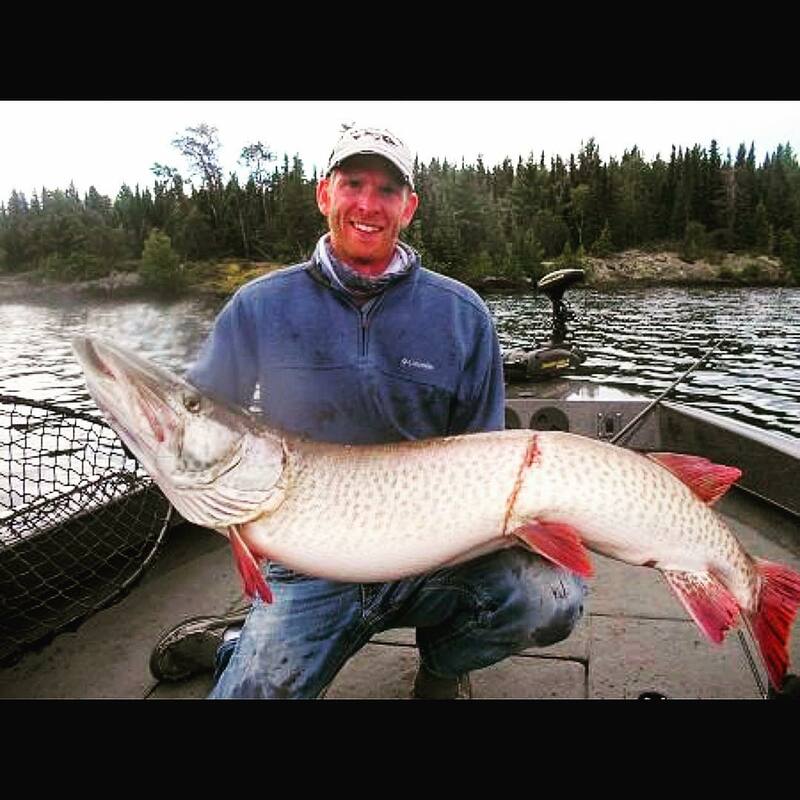 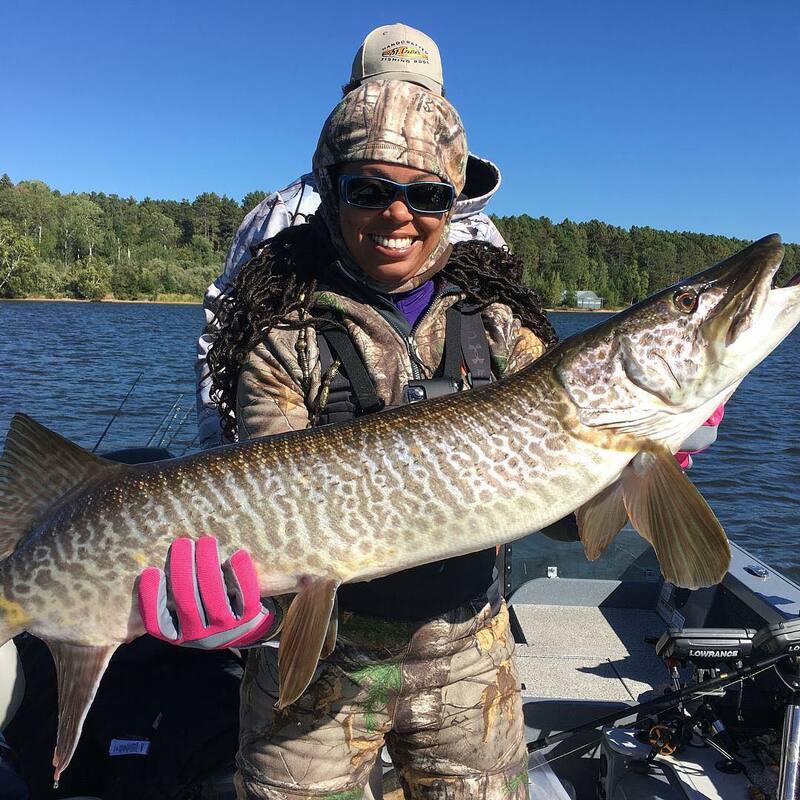 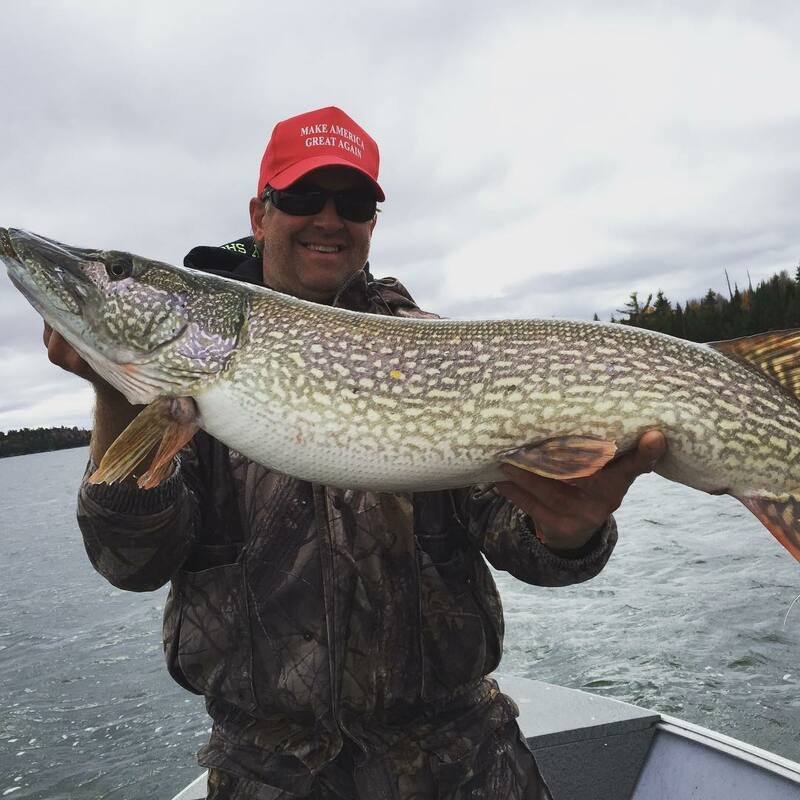 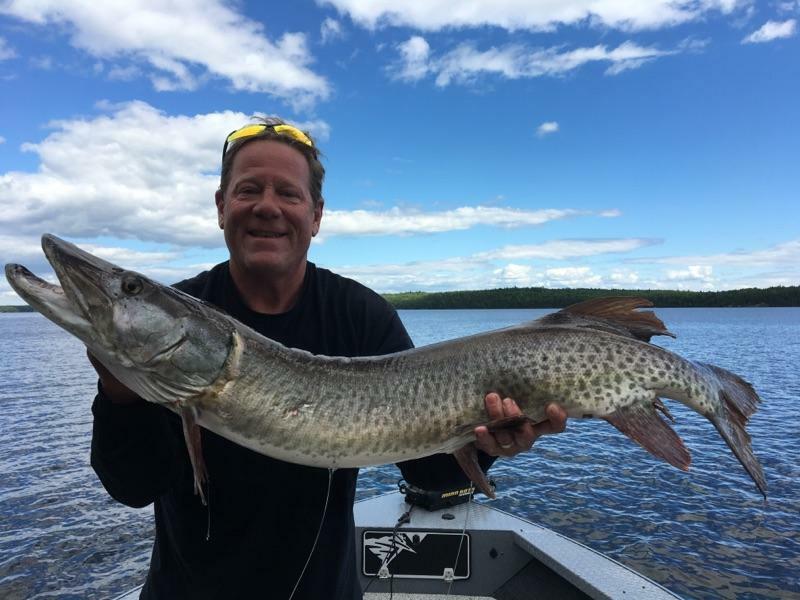 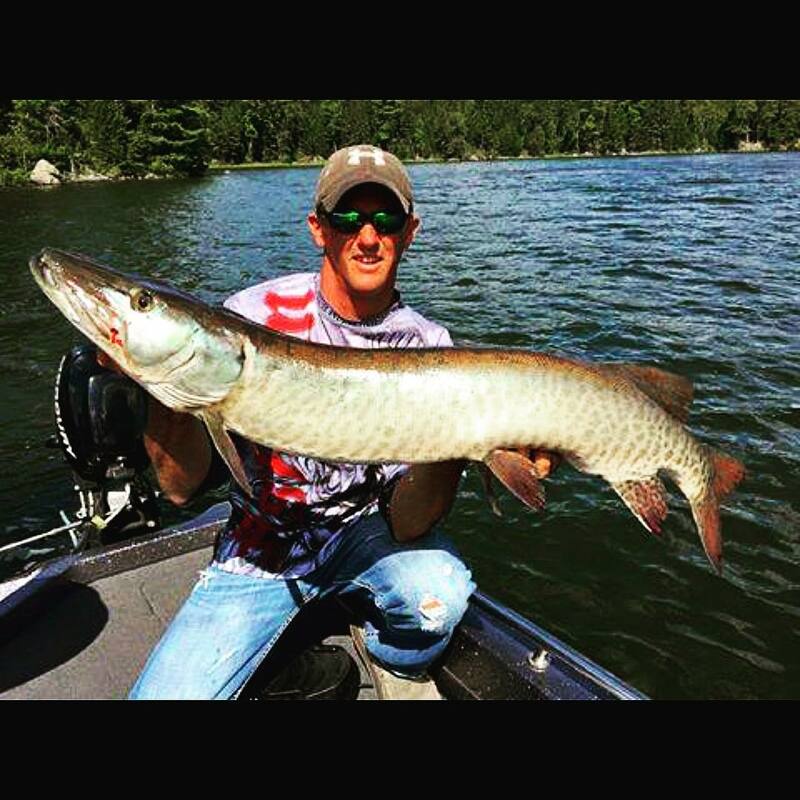 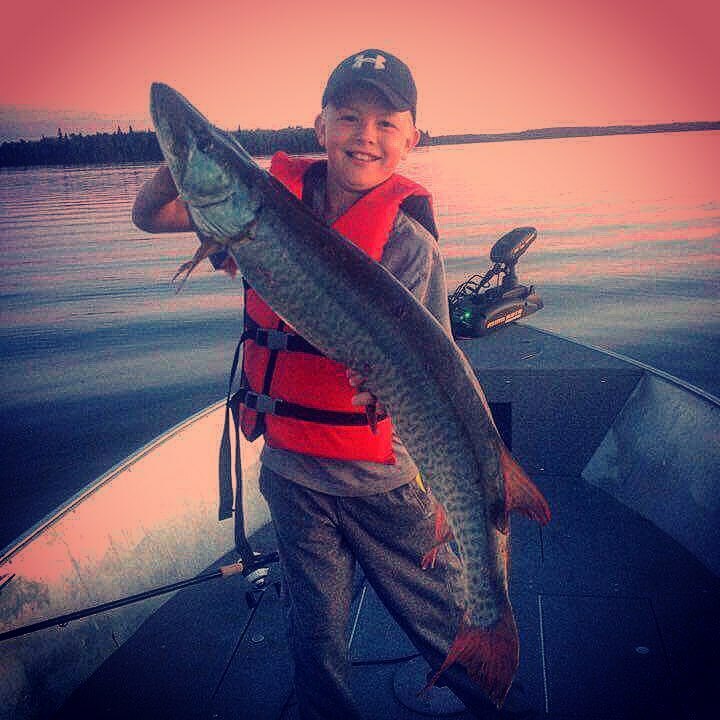 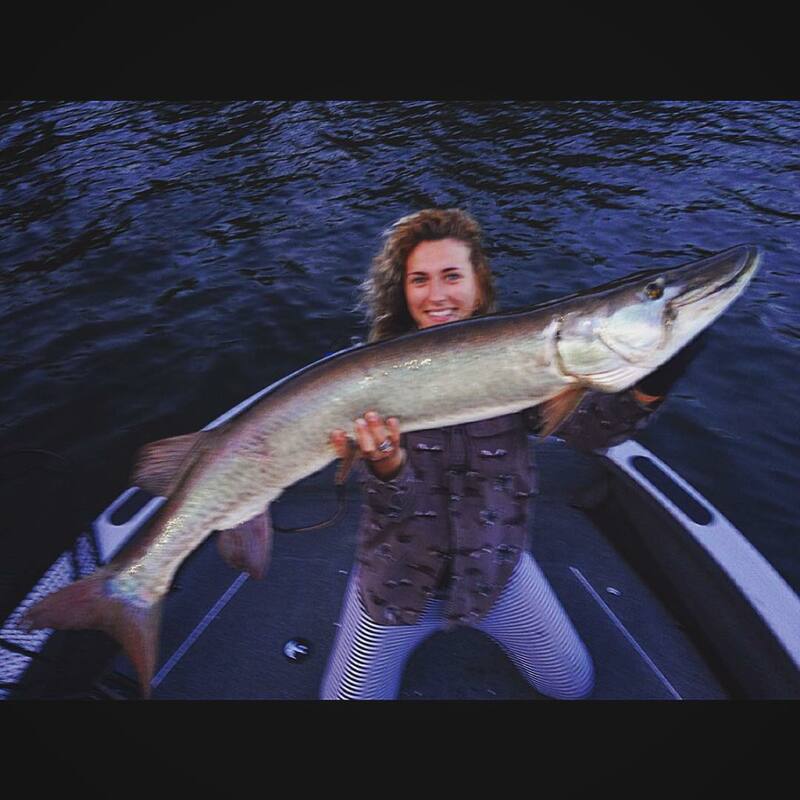 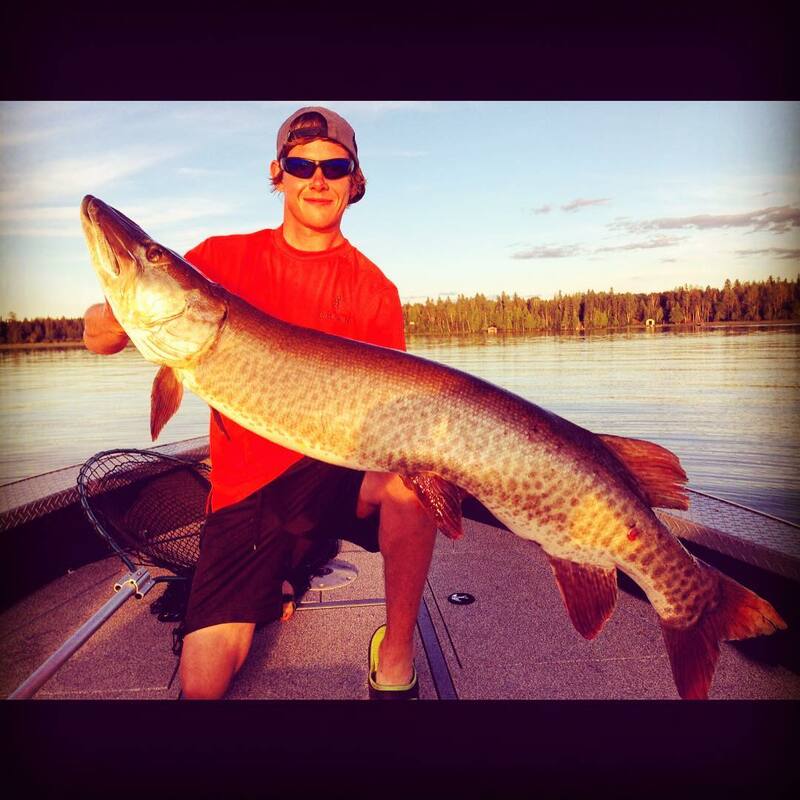 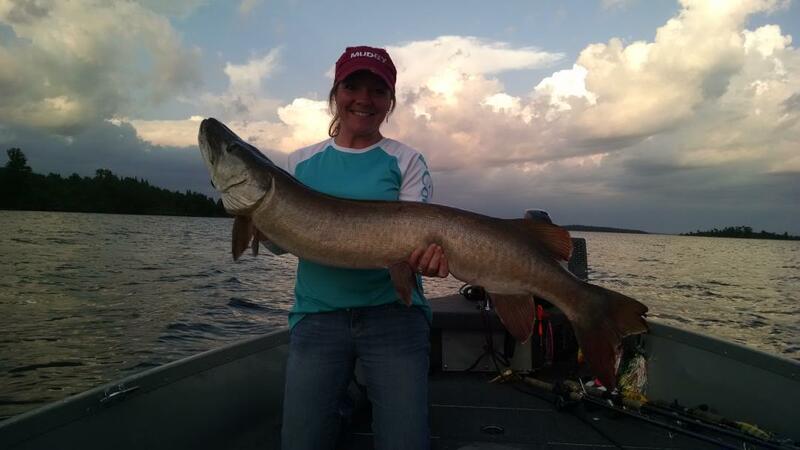 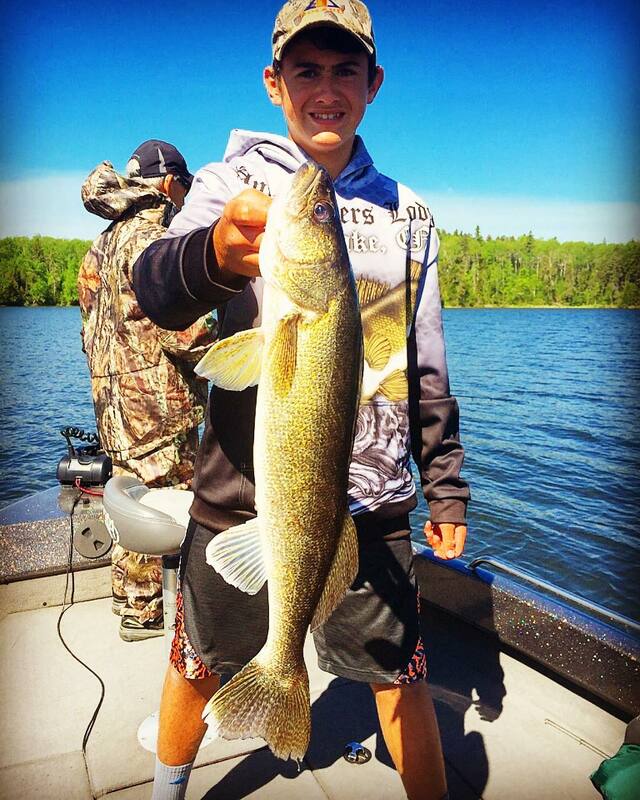 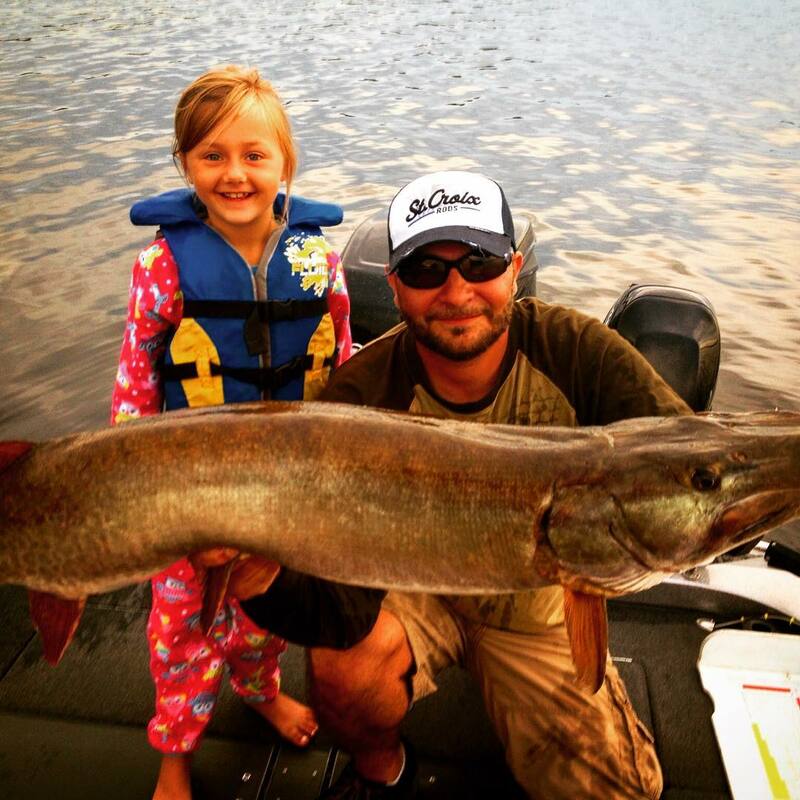 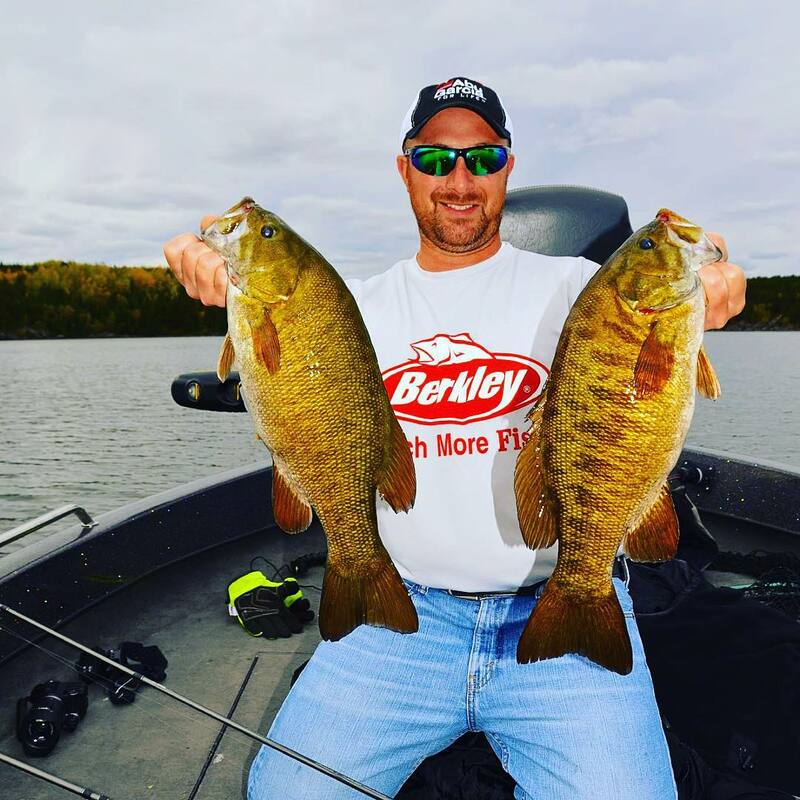 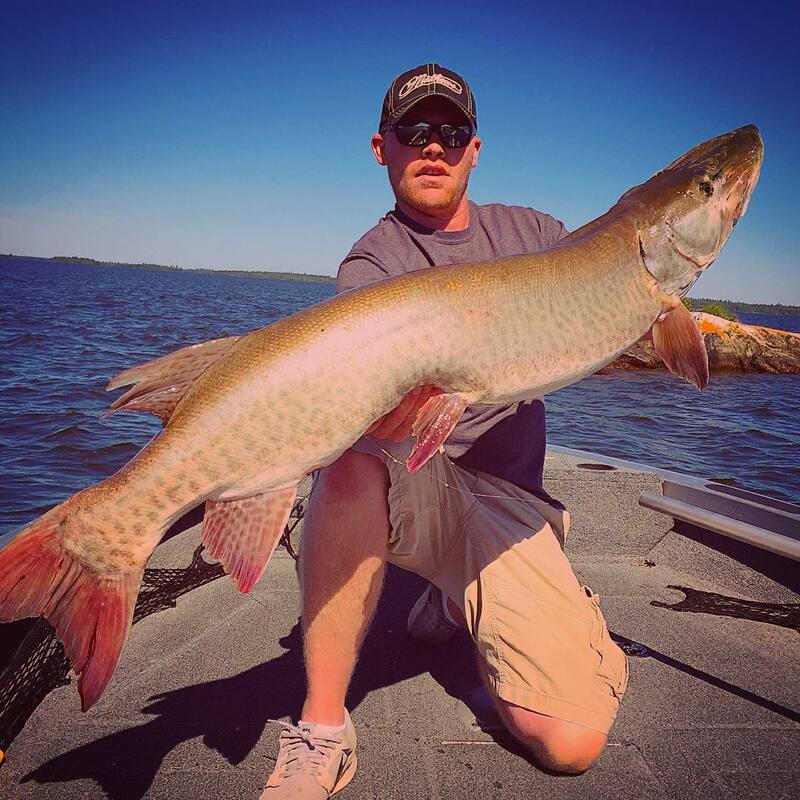 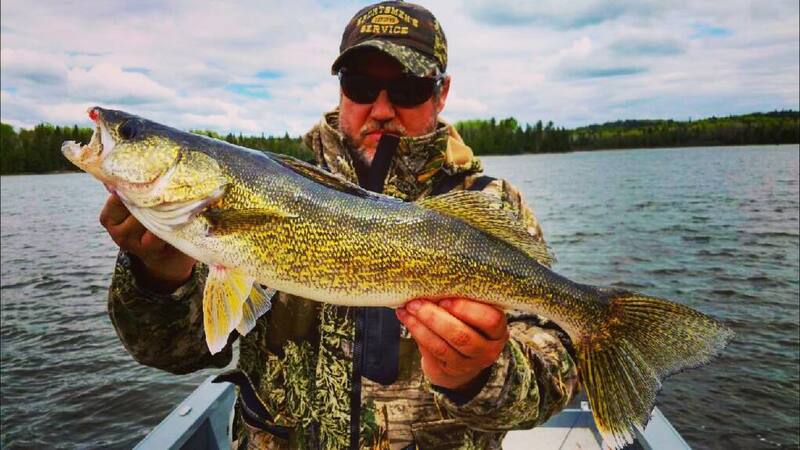 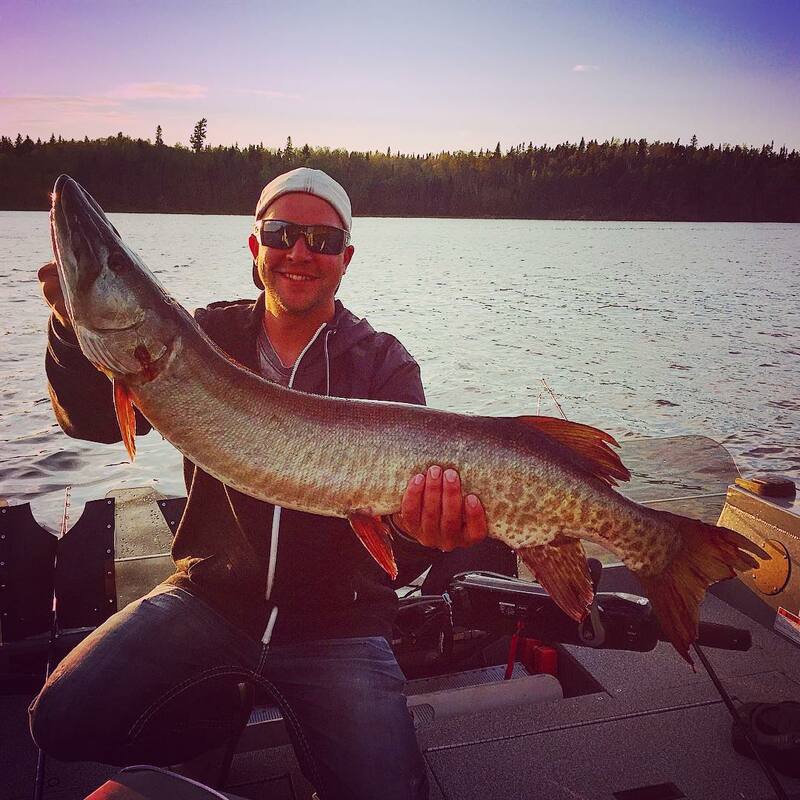 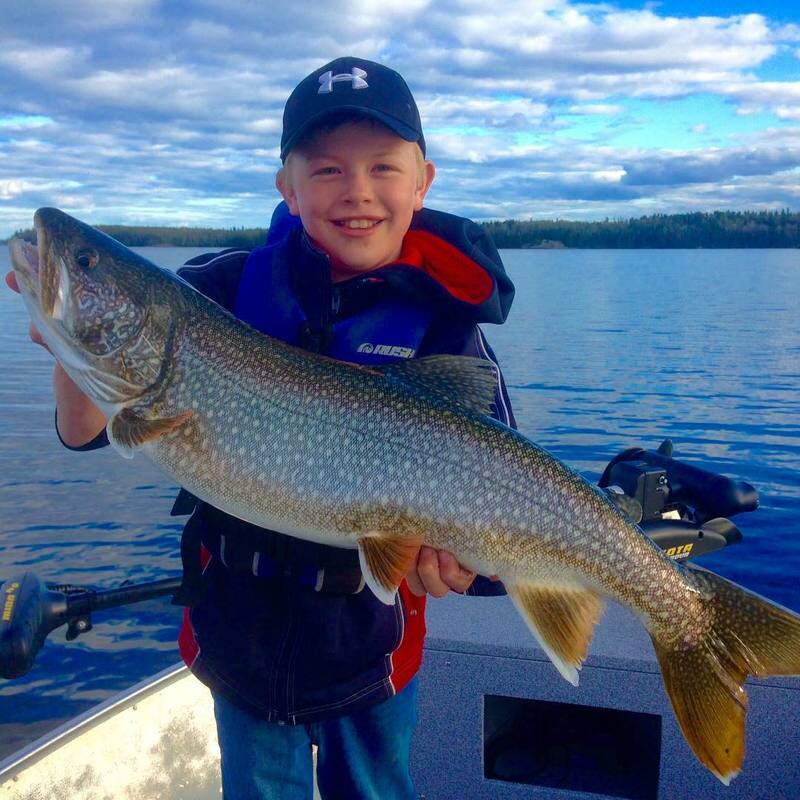 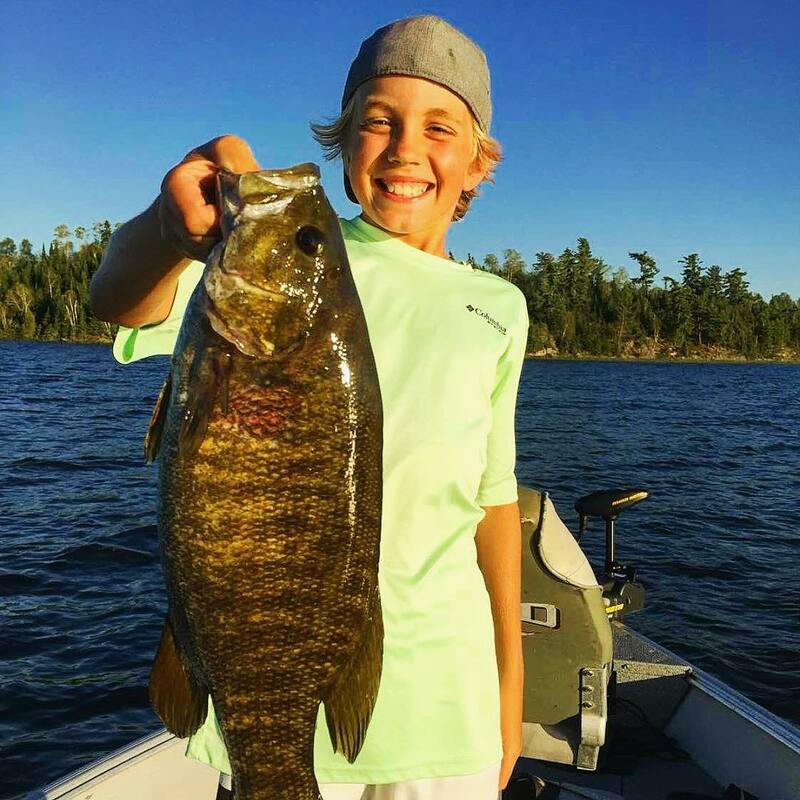 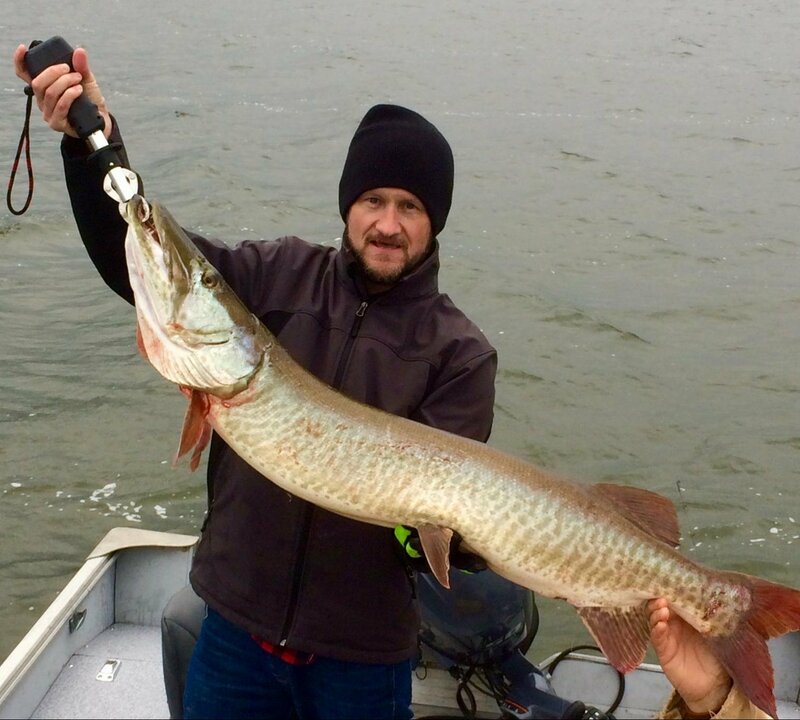 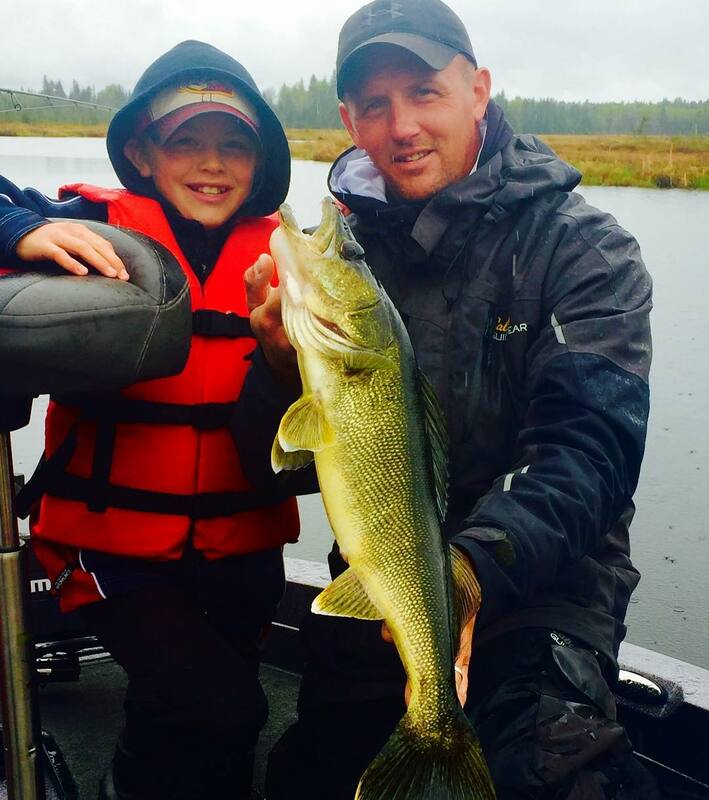 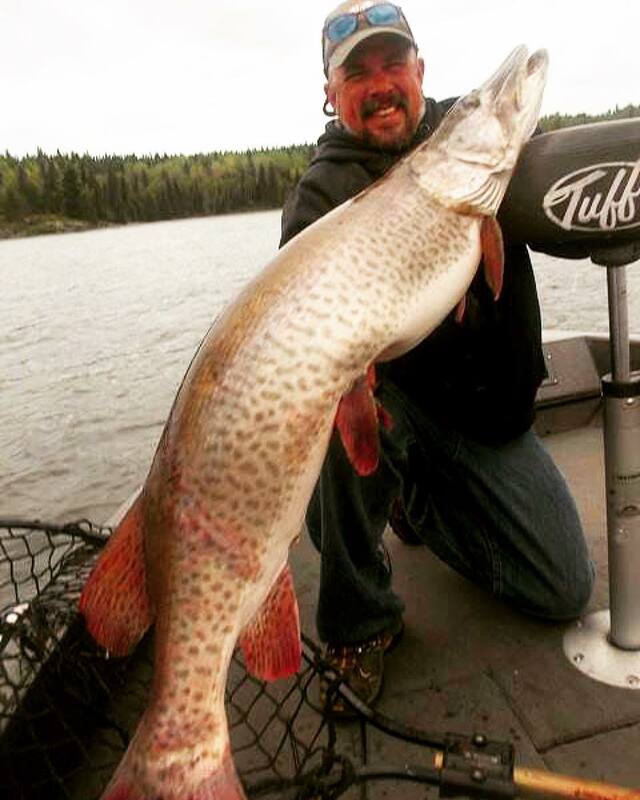 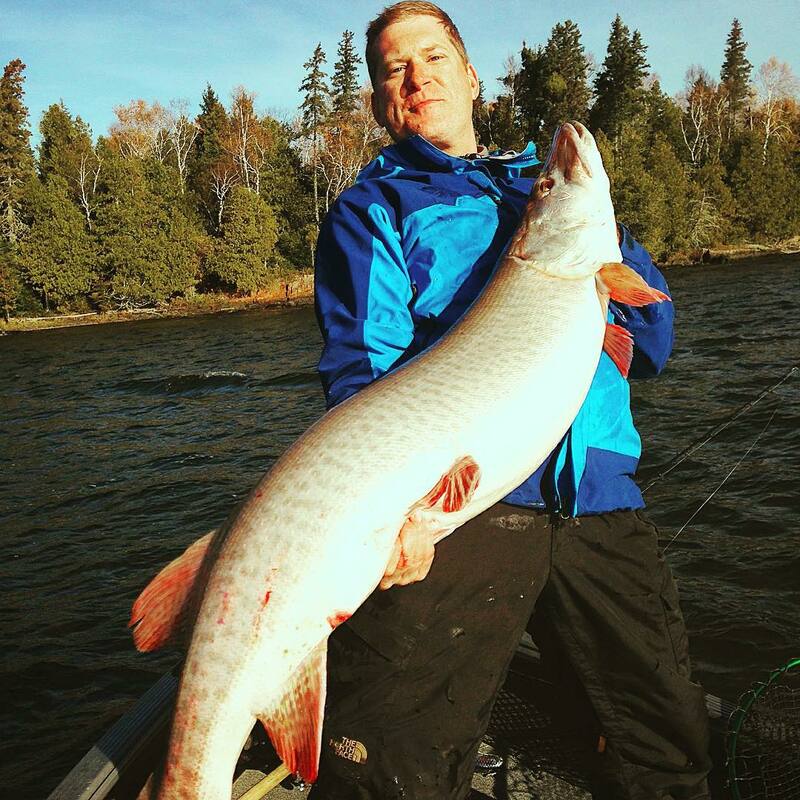 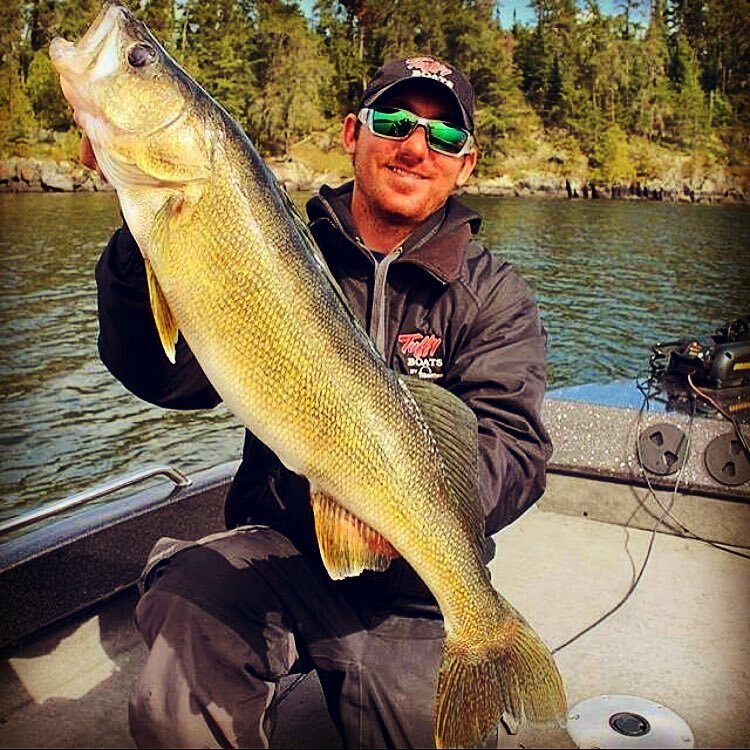 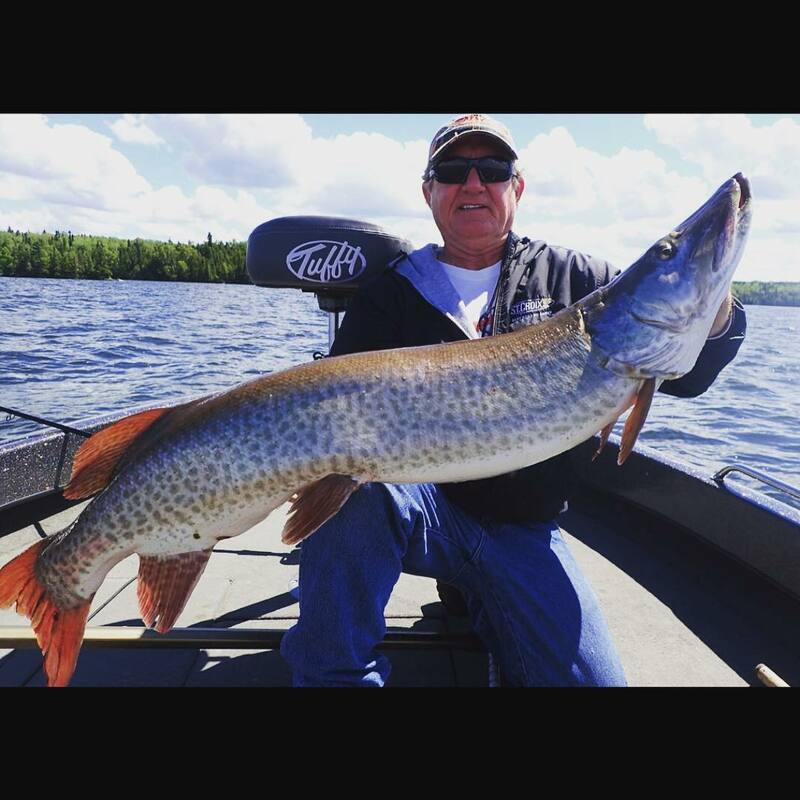 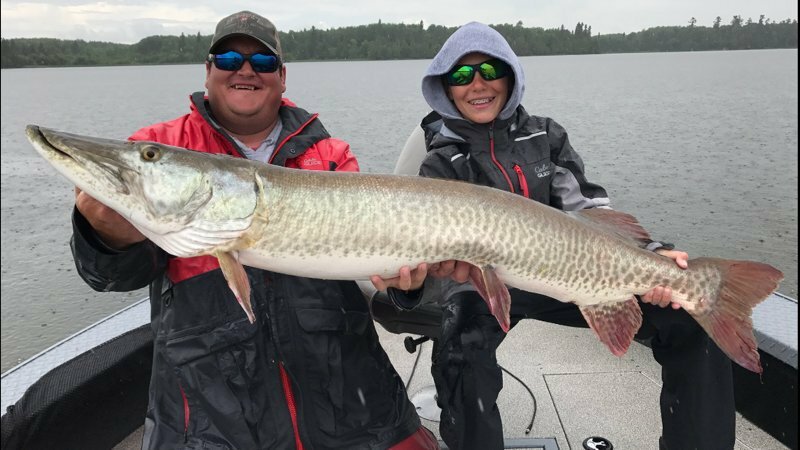 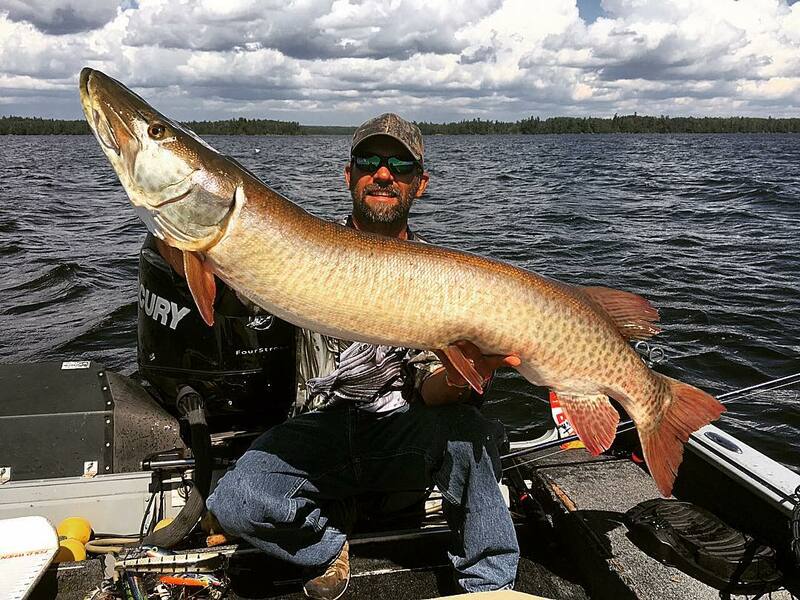 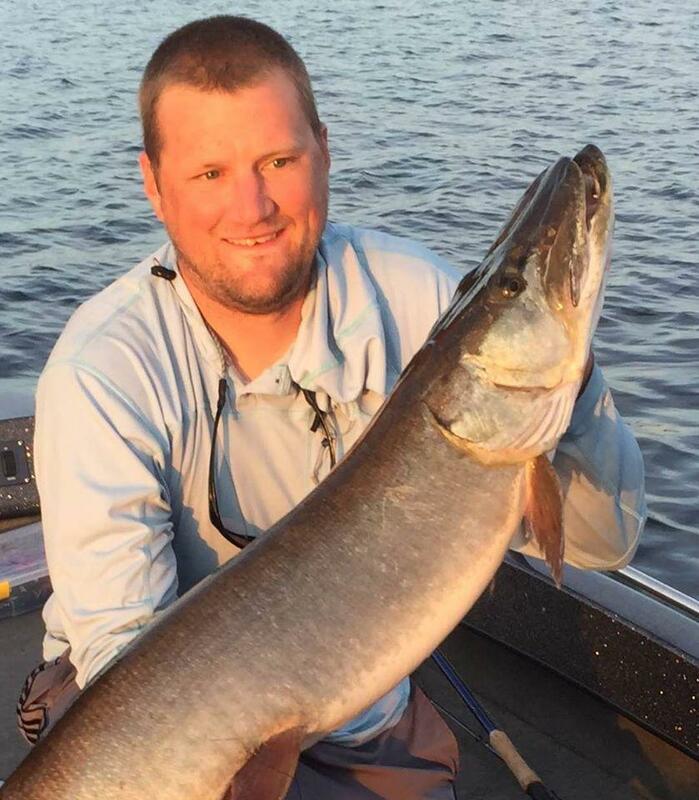 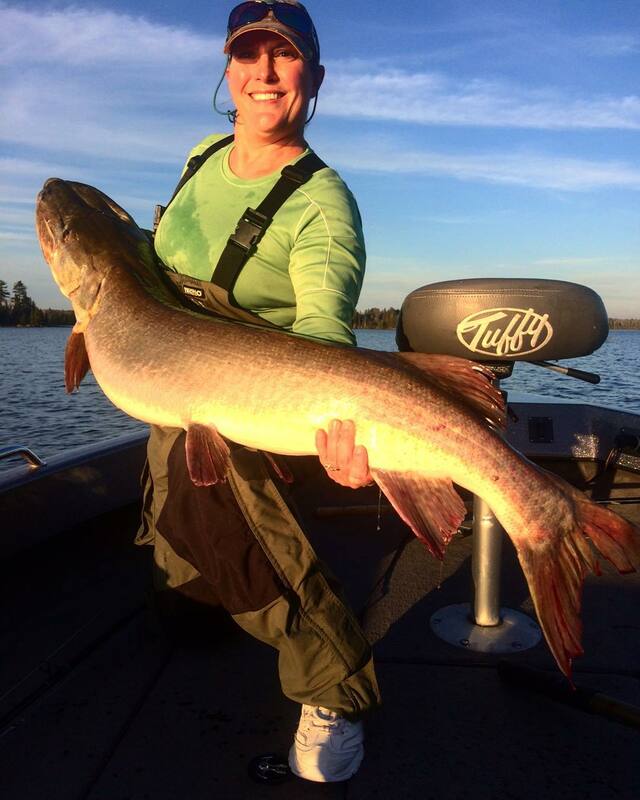 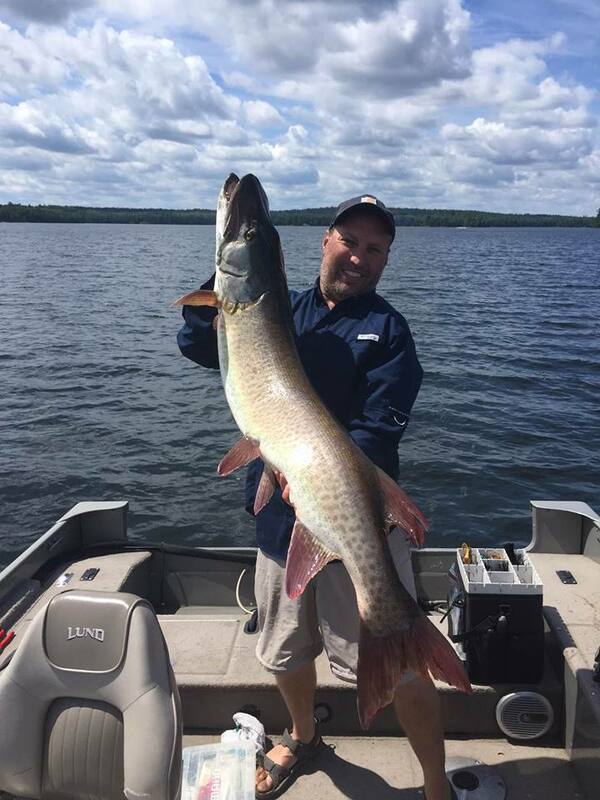 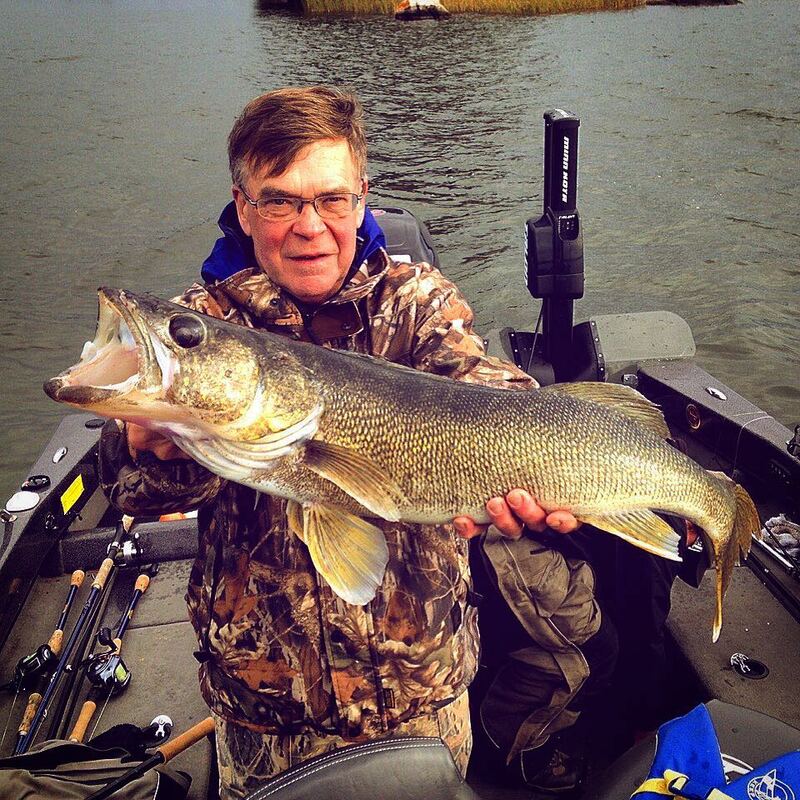 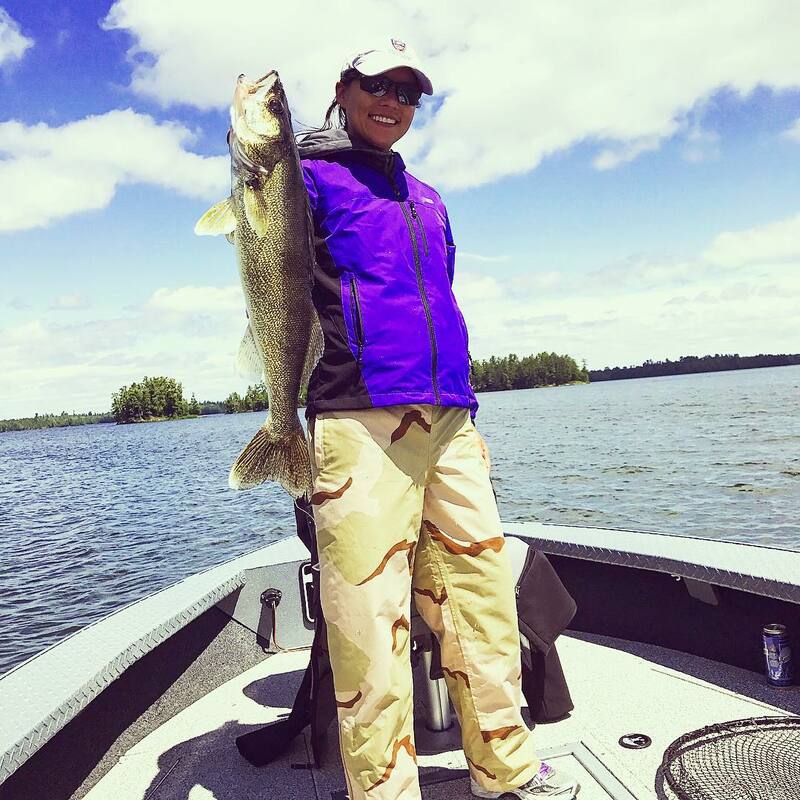 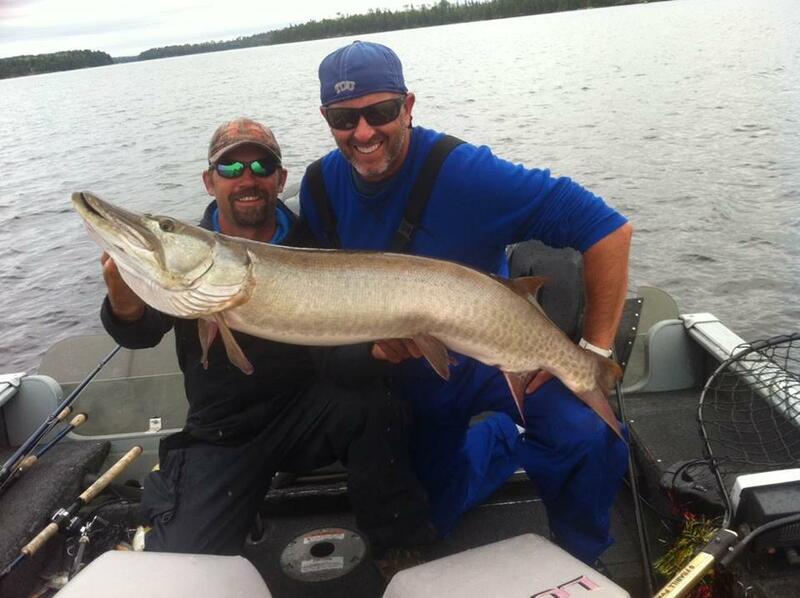 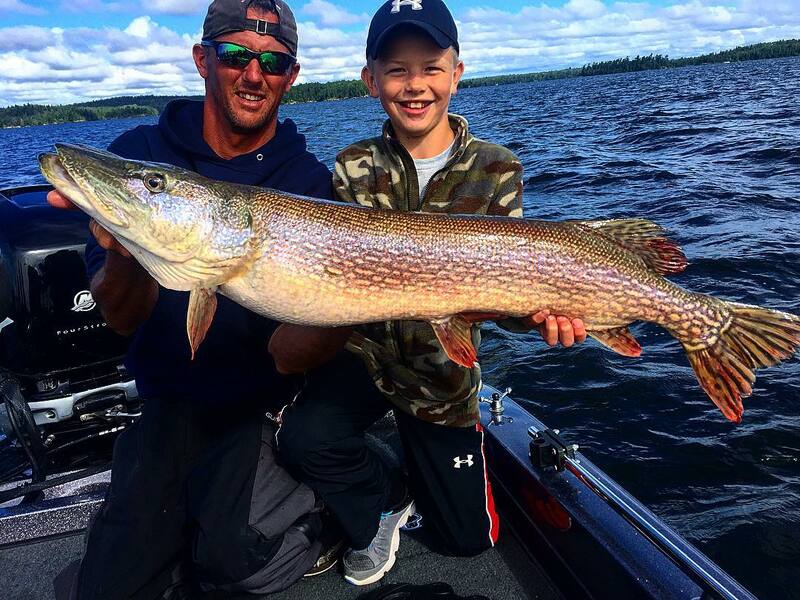 Eagle Lake has held fishing world records for; muskie, Canadian walleye, smallmouth bass, northern pike, and also provides excellent fishing for both lake trout and whitefish. 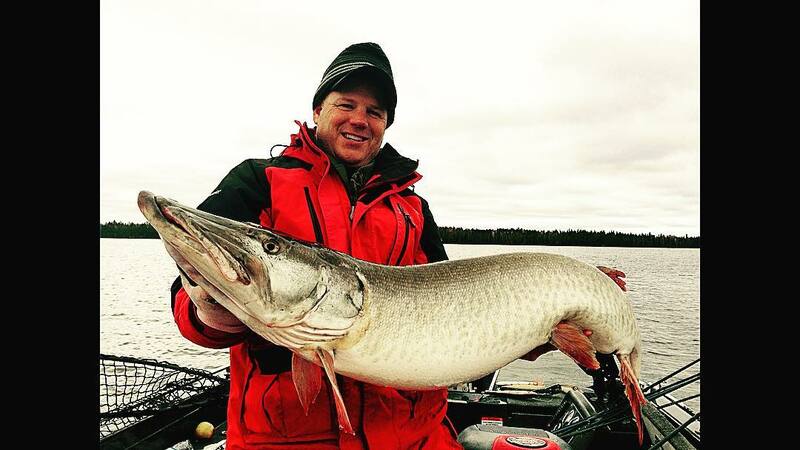 During the winter season, you can experience a unique ice fishing experience. 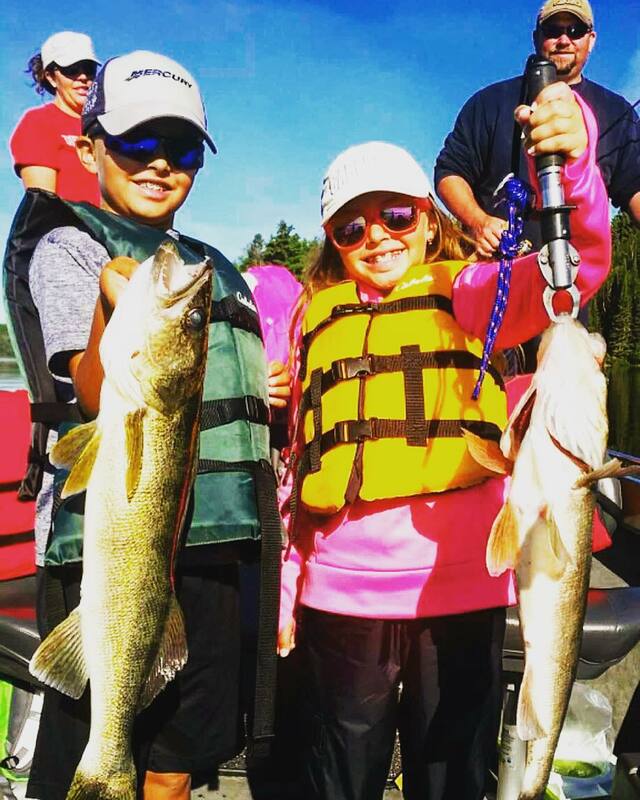 Our fishing trips are perfect for you and a group of friends or to bring your family to enjoy a great outdoor experience. 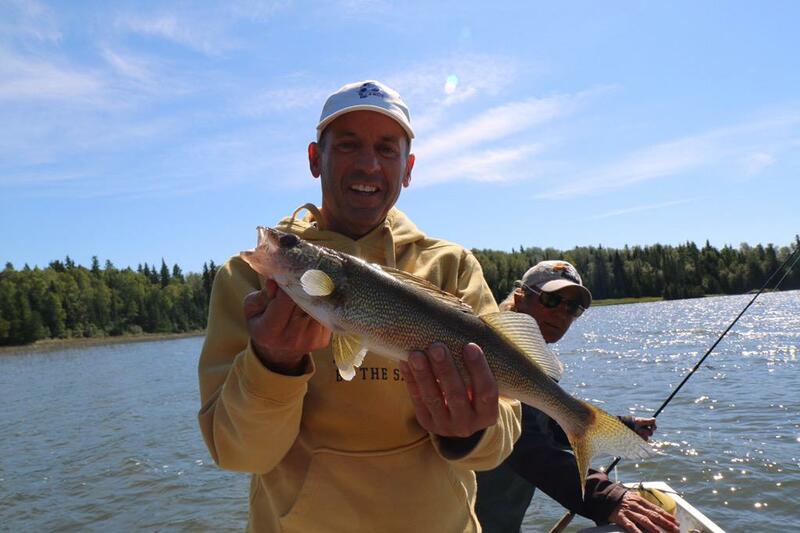 Whether you’re a first-timer or the experienced fishermen, you’ll be sure to have a great time. 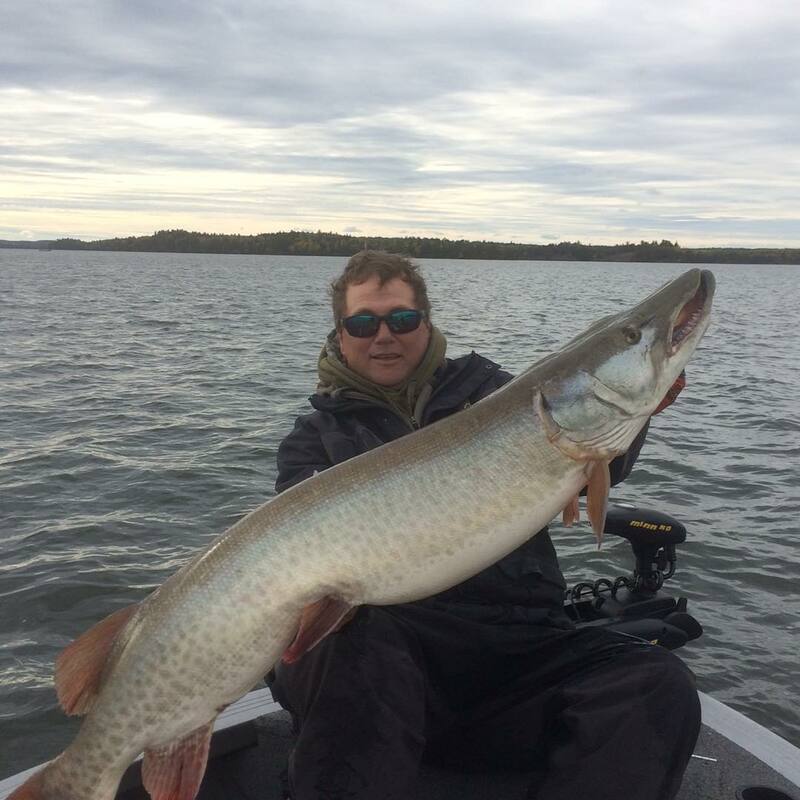 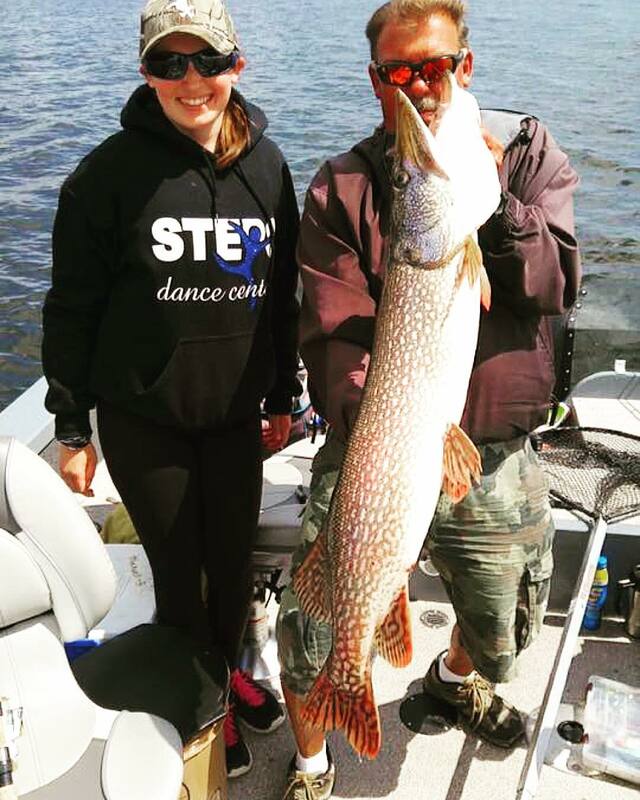 We are a no stress, hassle free fishing resort in Canada and we pride ourselves on being able to uphold a reputation as one of Canada’s premier fishing lodges. 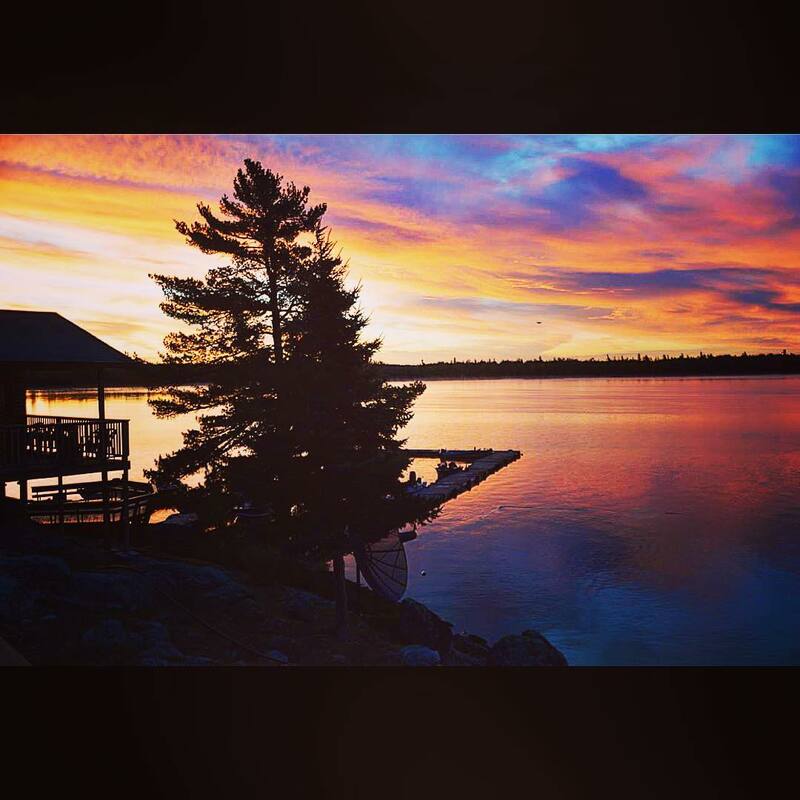 View our packages and book your next stay today! 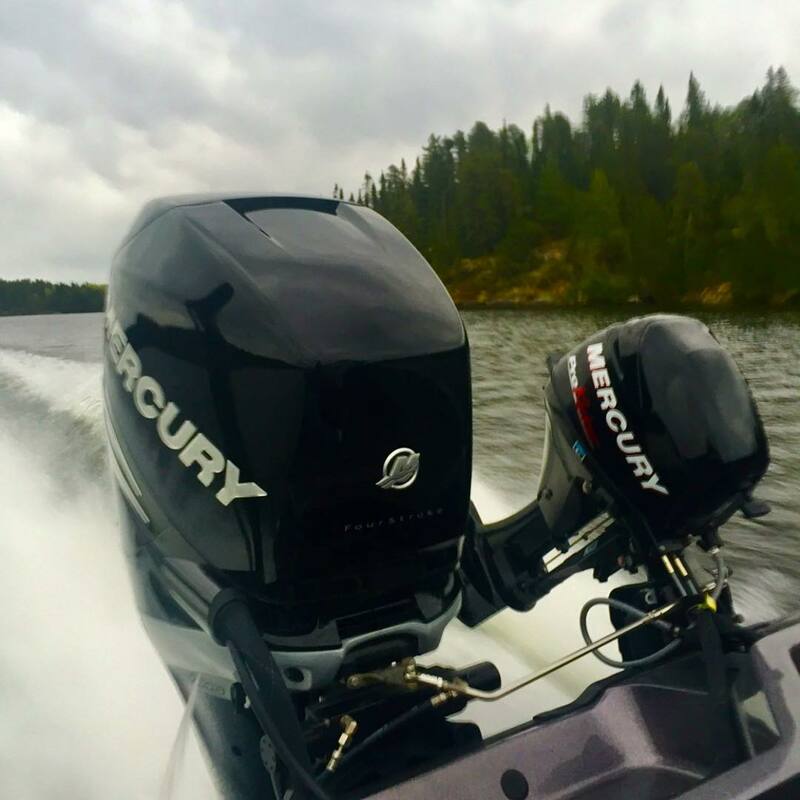 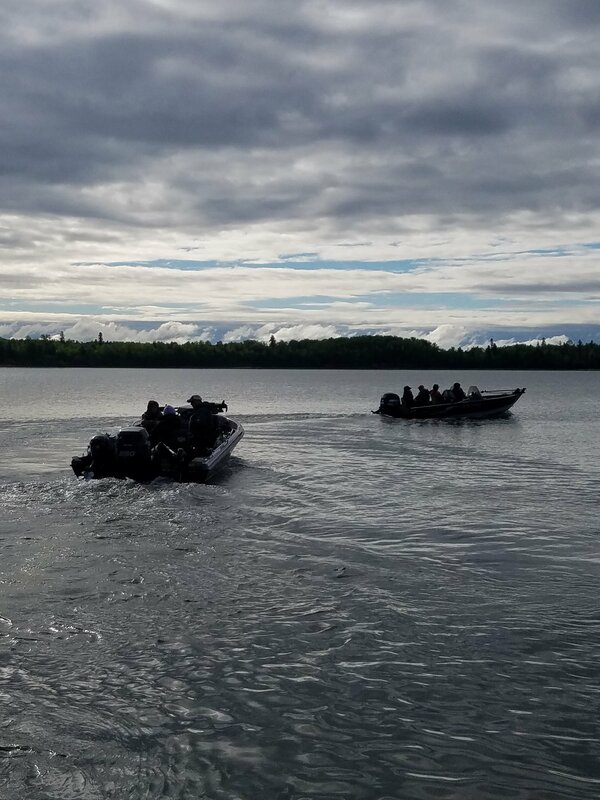 Our 16 1/2 and 18-foot aluminum boats are deep, wide and equipped with 25 and 50 HP motors for dependability with your safety and comfort in mind. 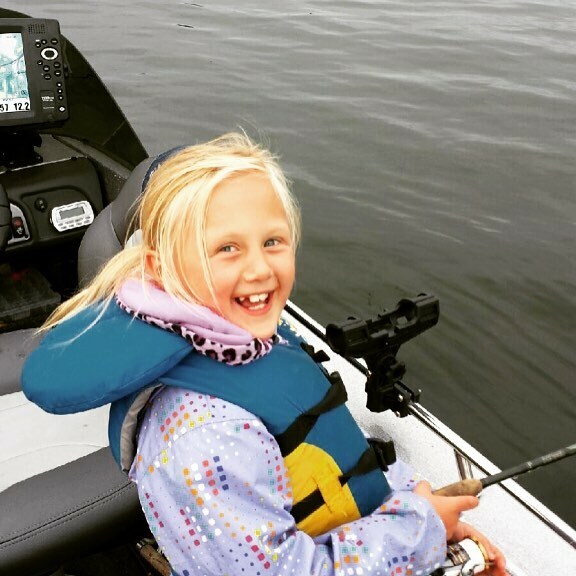 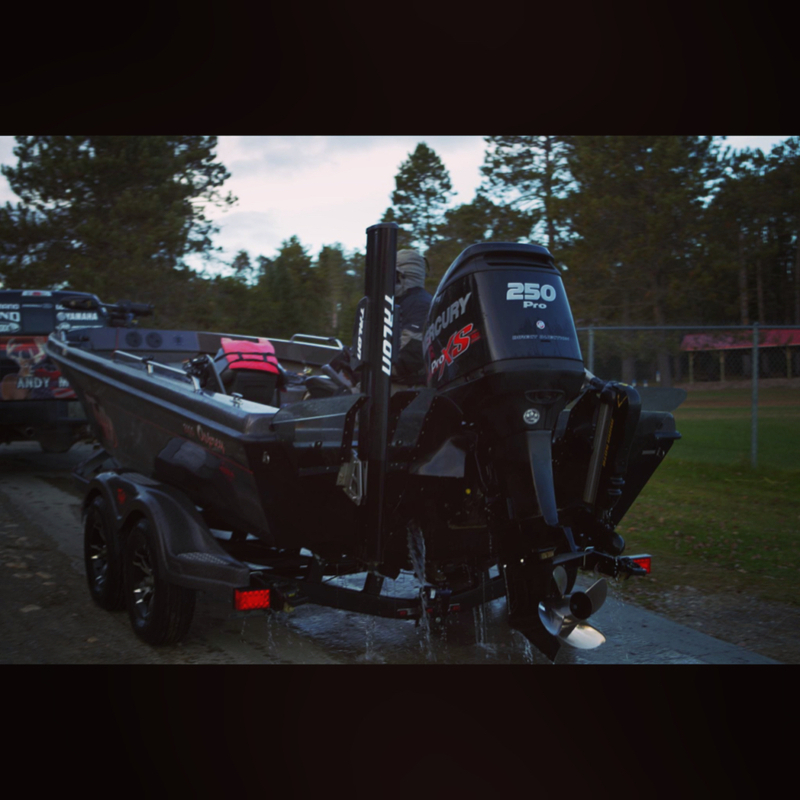 They are fully equipped with swivel seats, minnow buckets, paddles, cushions, and landing net. 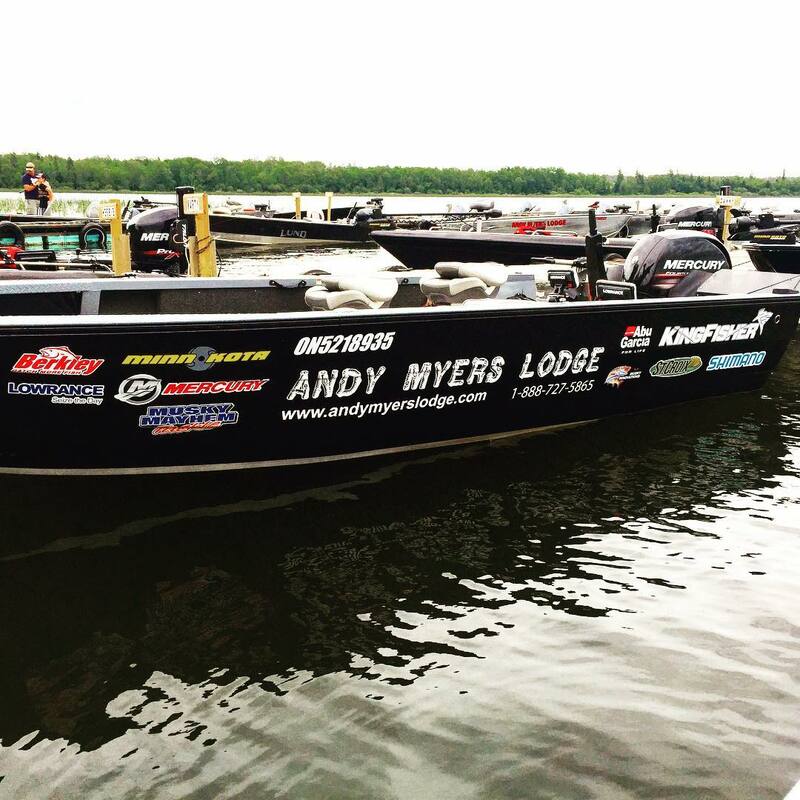 The 18 and 20-foot boats are available as an upgrade. 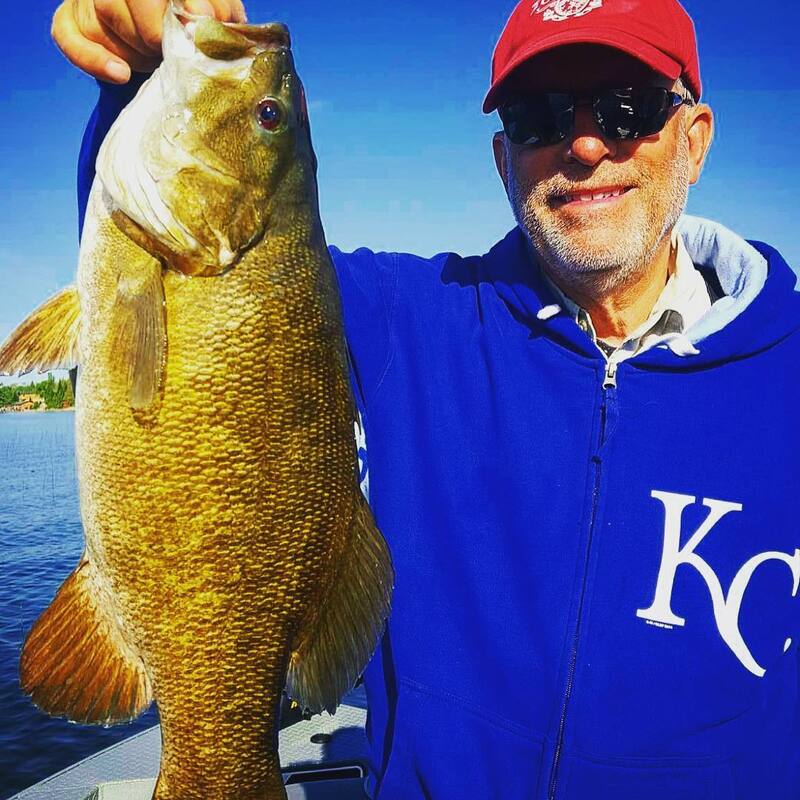 If you bring your own boat, we will help you launch and provide you with a safe, secure spot on our new 180-foot sheltered dock and provide you with electricity for your battery charger. 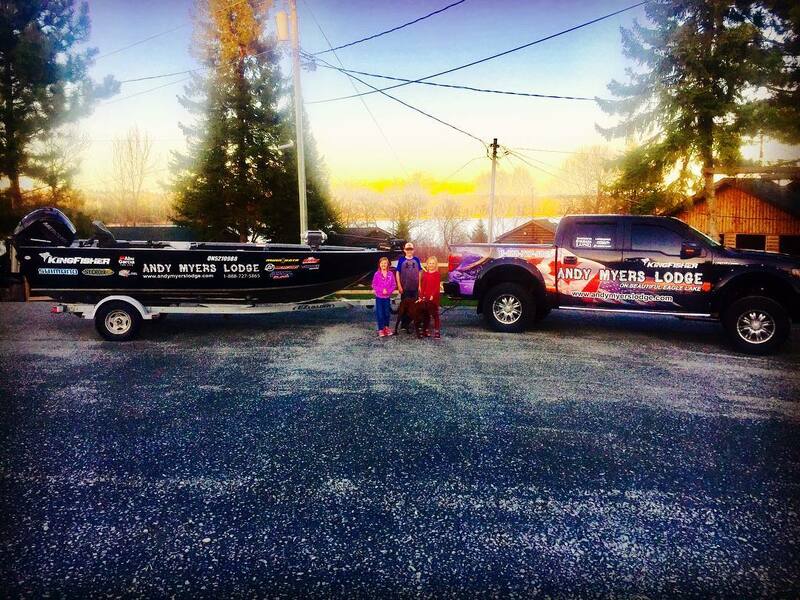 Either way, 18 hr full dock hand services make sure your boat is secure, always gassed up, batteries charged, and your bait bucket is full so you’re ready to go. 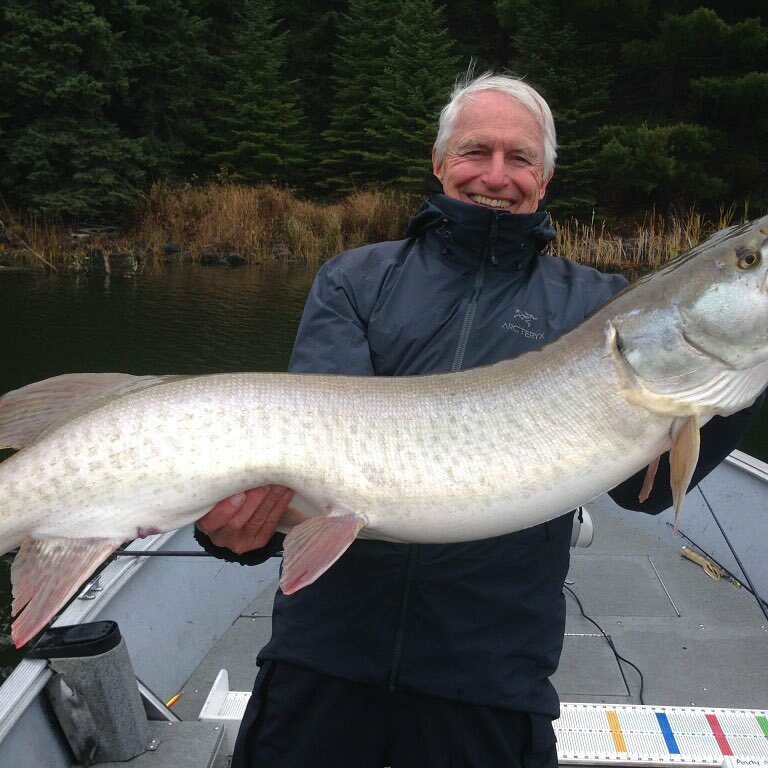 When you return for the day, your catch is photographed, filleted, wrapped and frozen, all complimentary. 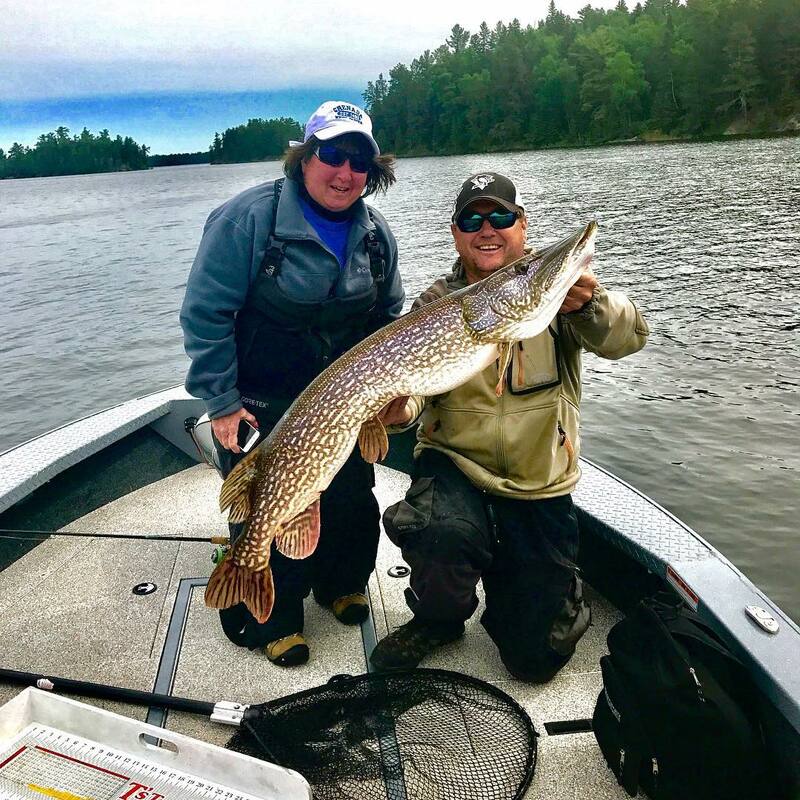 Guides are professional, on staff, and available upon pre-arrangement and their services can really help make your trip a memorable one. 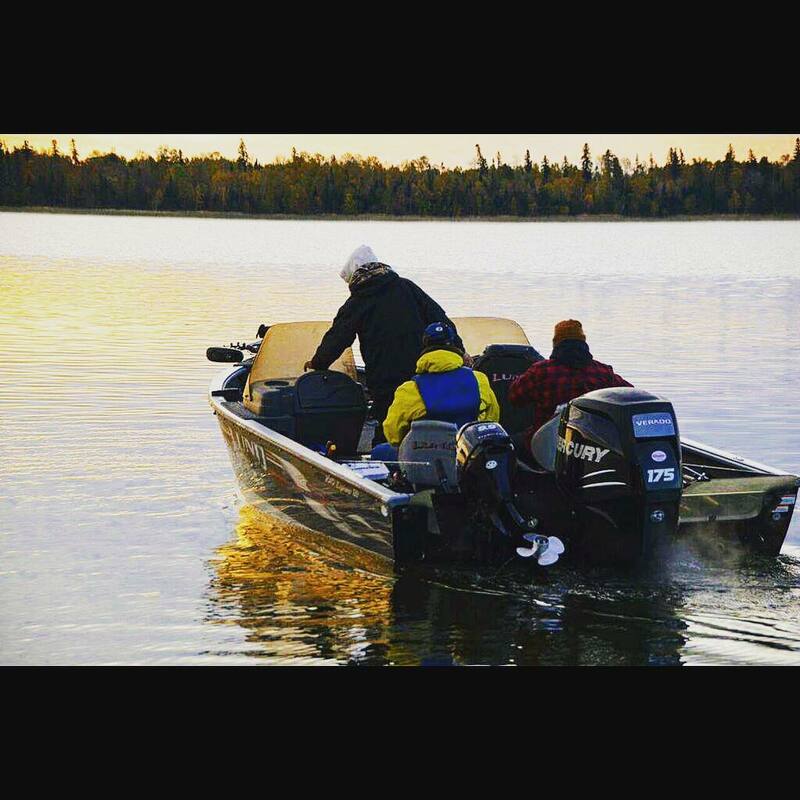 Guide boats are 21-21.5′ Lund, Tuffy, or KingFisher with 115HP 150HP 250 HP Yamaha or Mercury Motors and fully equipped for efficiency and comfort. 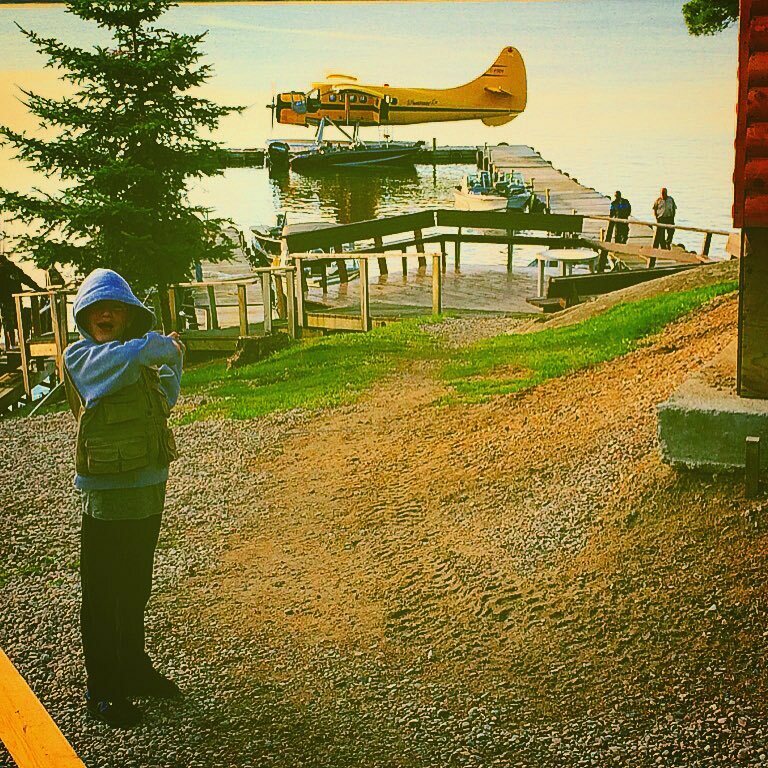 Fly-ins are made to remote lakes daily from our dock and are included or available with all packages. 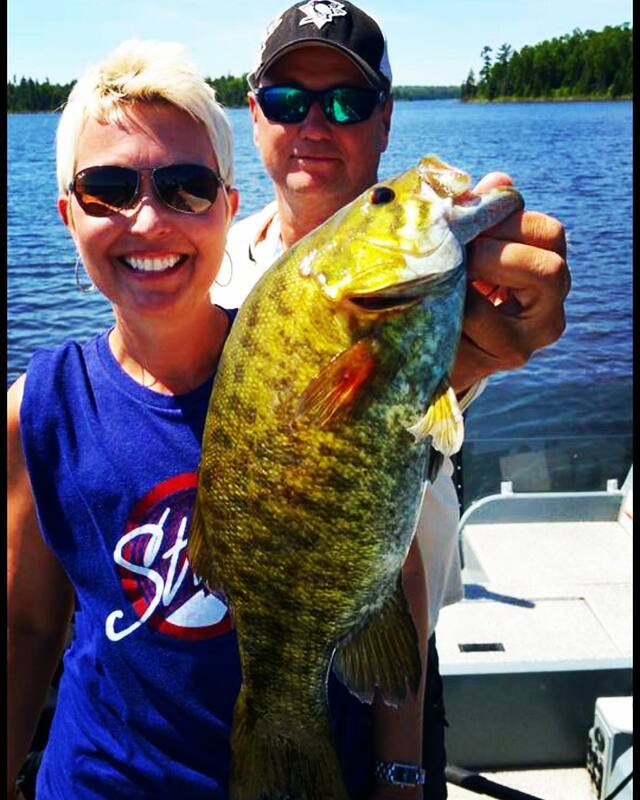 Our staff is second to none and are there to serve you with a smile. 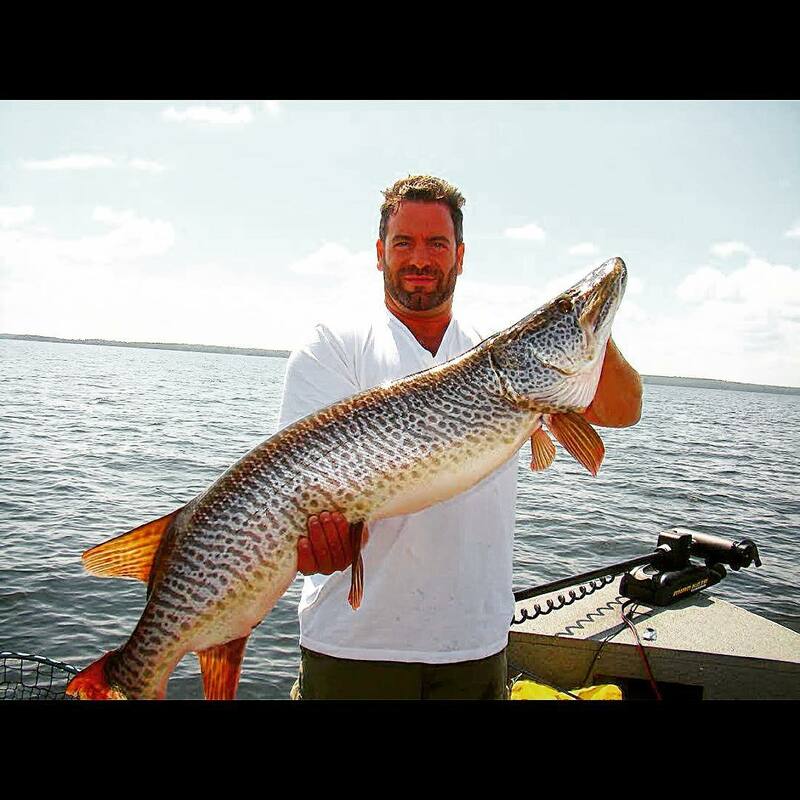 4WD Guided Safaris are made to many remote lakes, which are full of adventure and excitement. 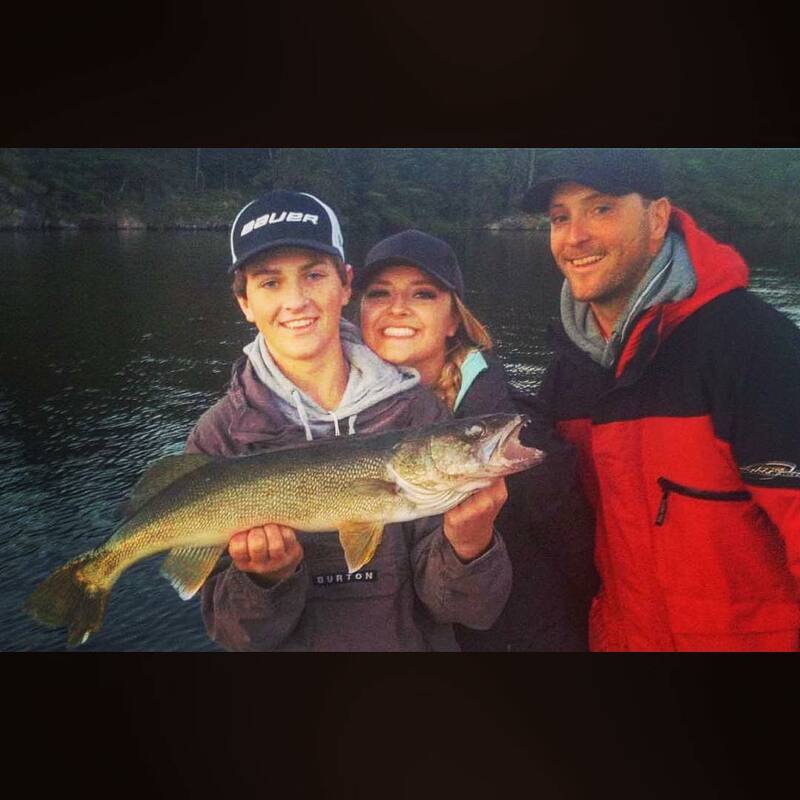 Our staff is second to none and are there to serve you with a smile. 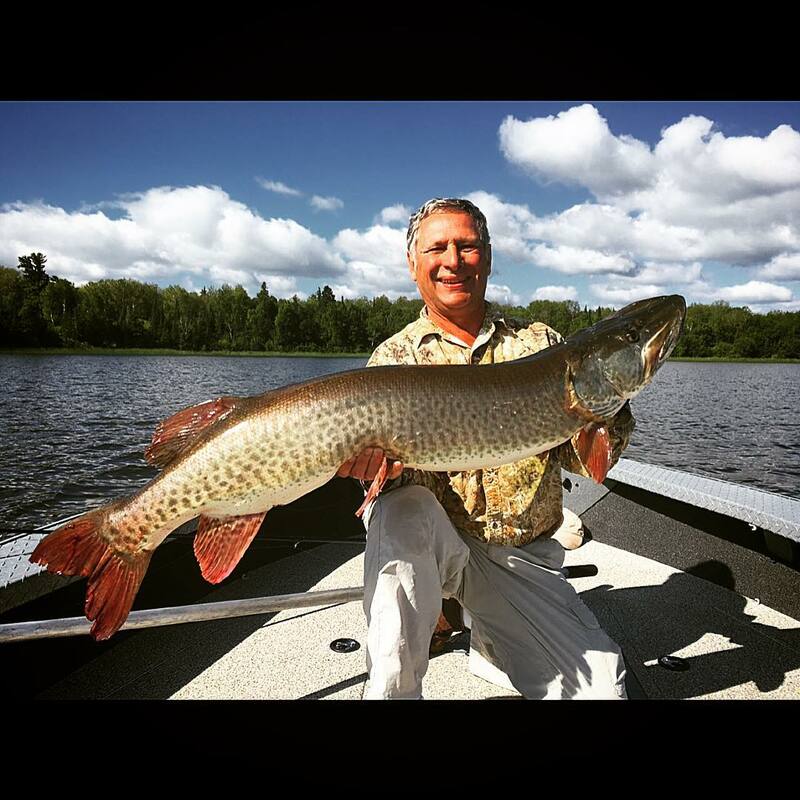 Besides the great fishing, there are lots of activities to do at Andy Myers Lodge. 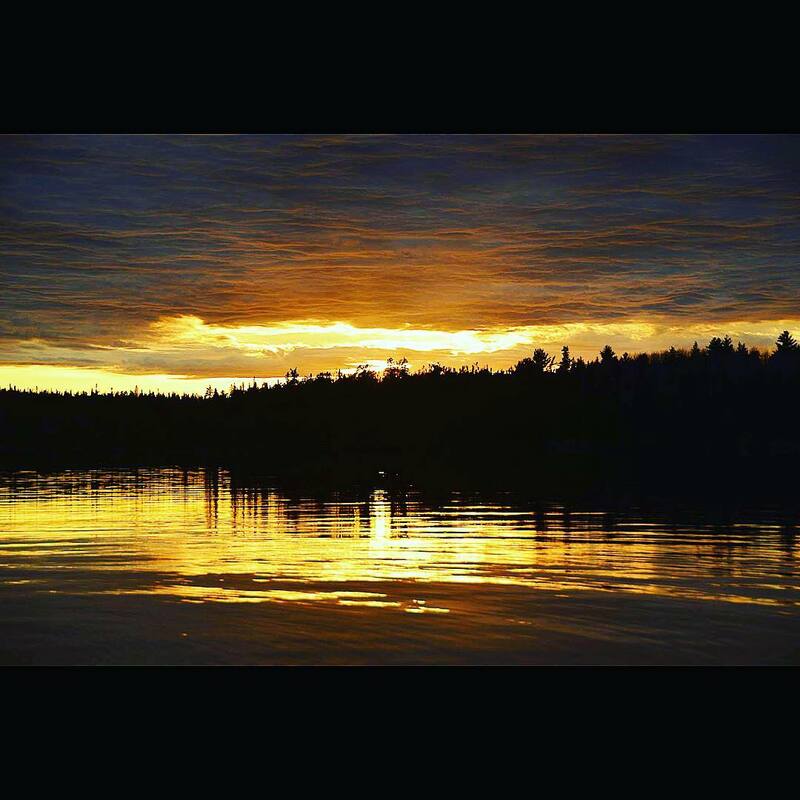 Take a swim, sunbathe, canoe, take a hike or explore and enjoy the scenery and wildlife, go berry picking, or just plain relax. 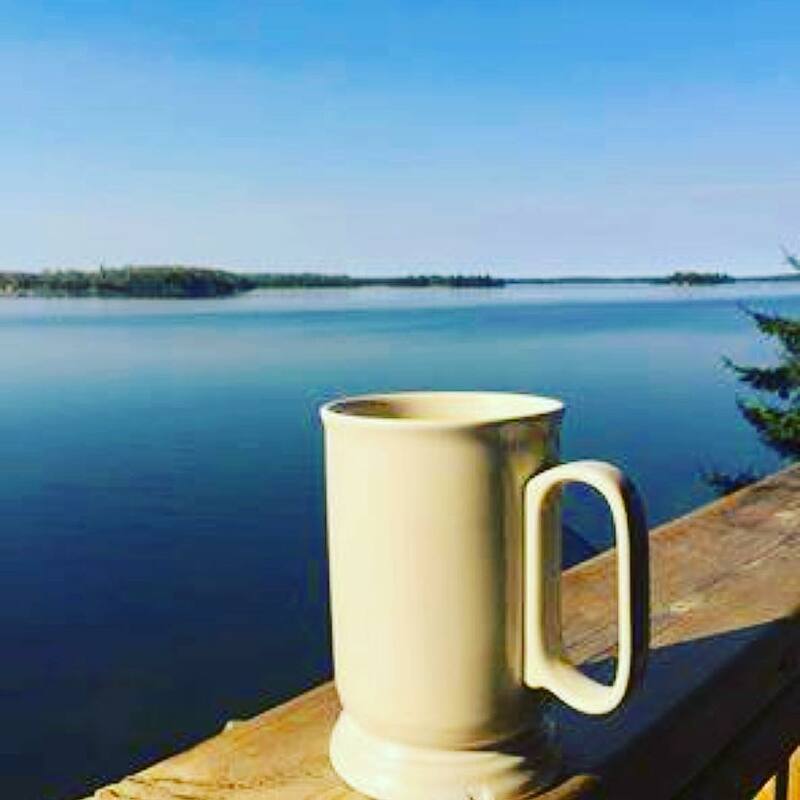 There is nothing quite like sitting down near the lake listening to the loons call or the wind whispering to you as it flows through the treetops. 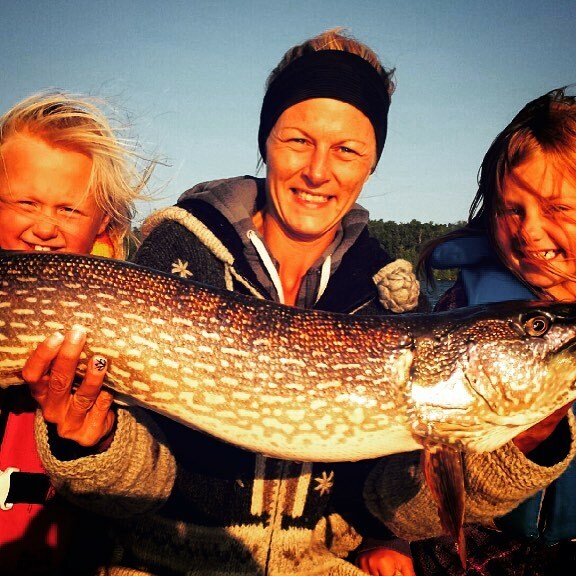 Come and enjoy! 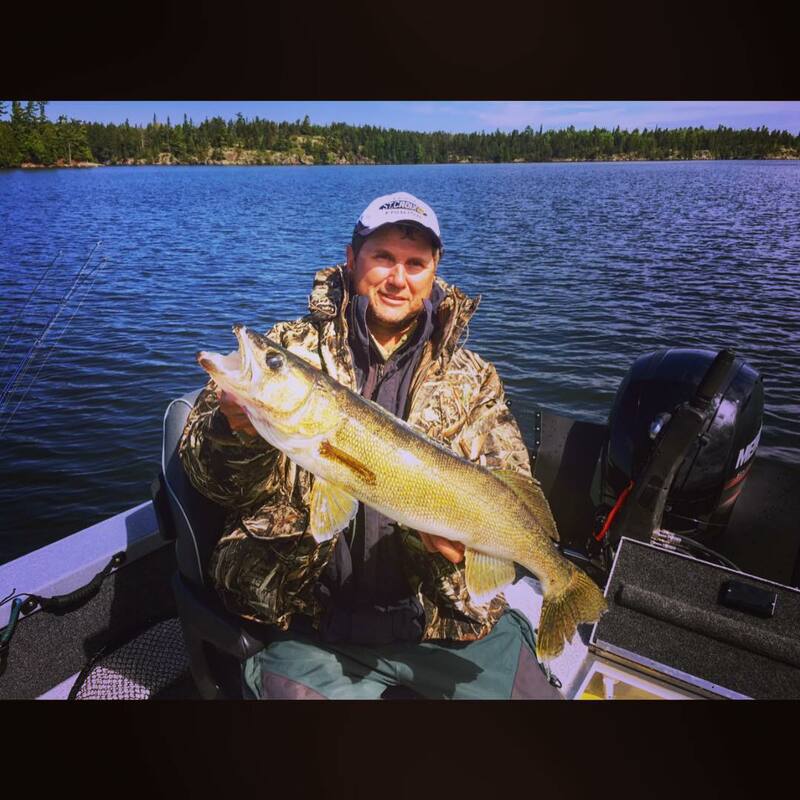 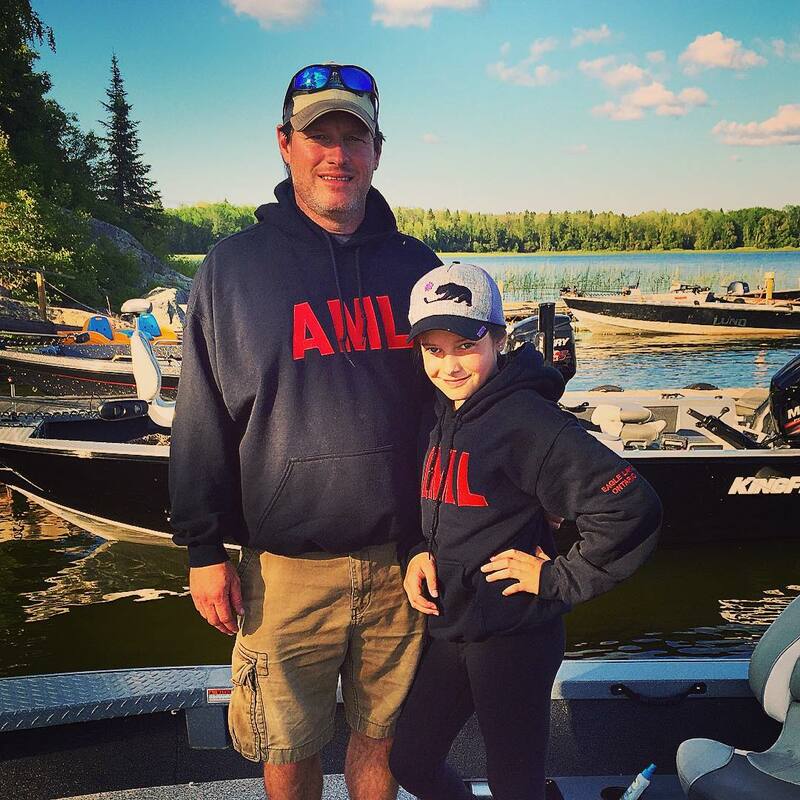 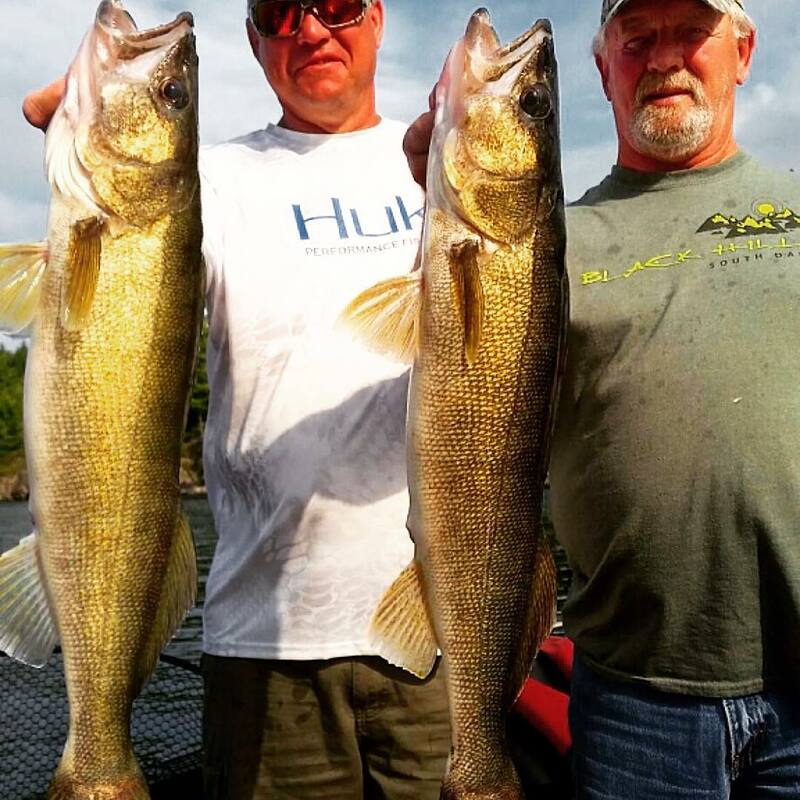 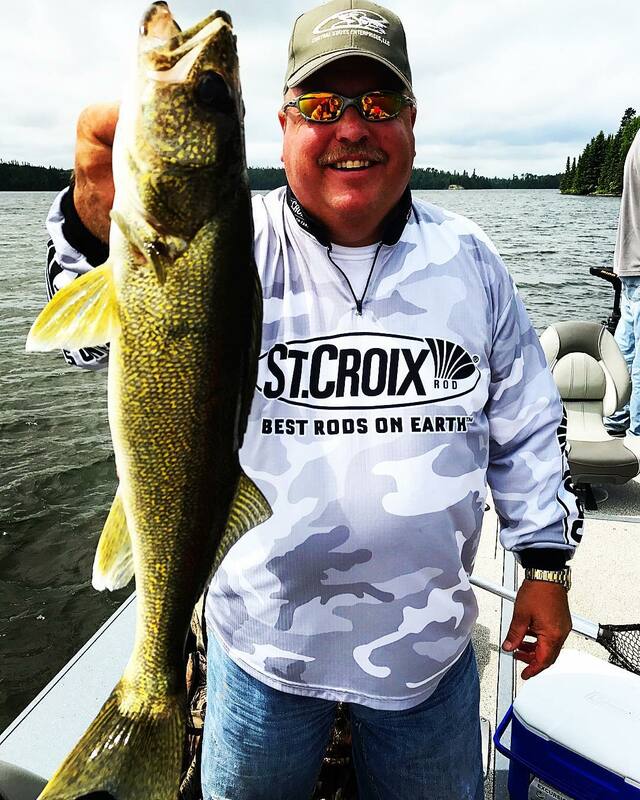 Extensive Fishing Instruction Program, Nightly Rap Sessions and Updates, Map Marking and Seminars to get you on fish and familiar with our waters.